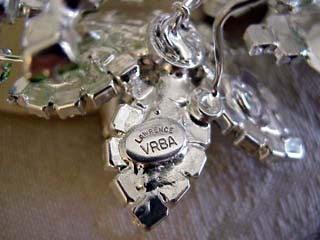 Larry Vrba is a wonderful jewelry maker and a good friend. 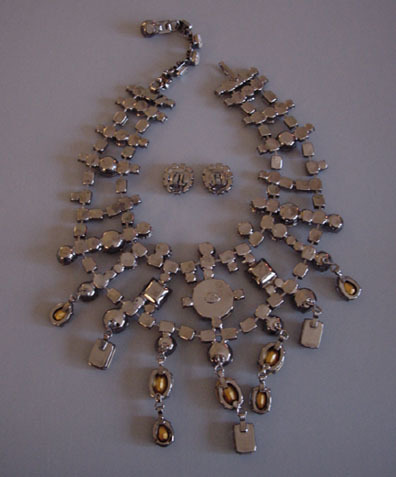 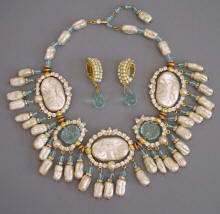 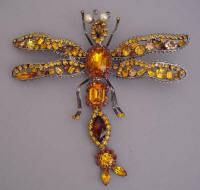 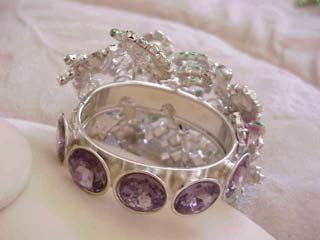 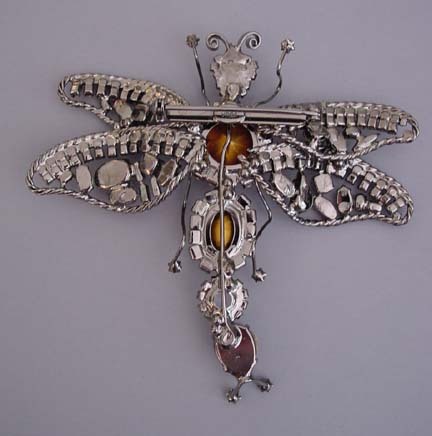 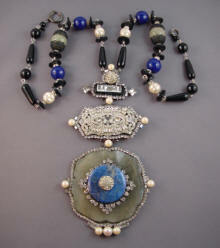 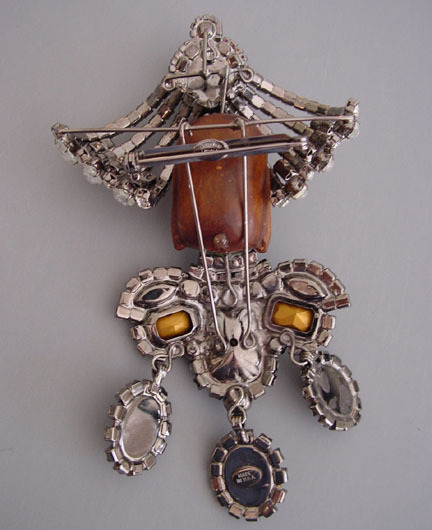 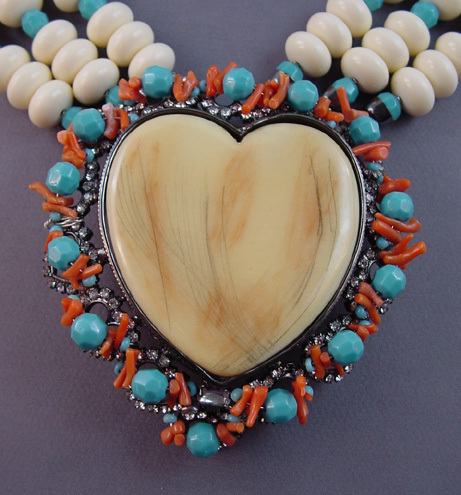 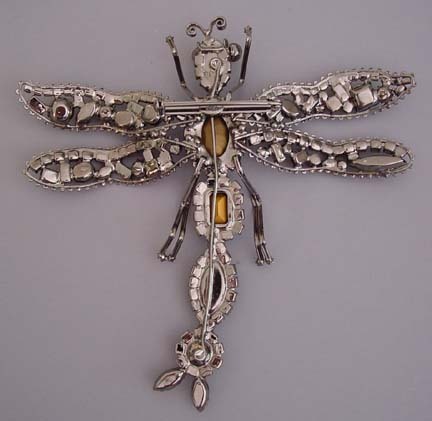 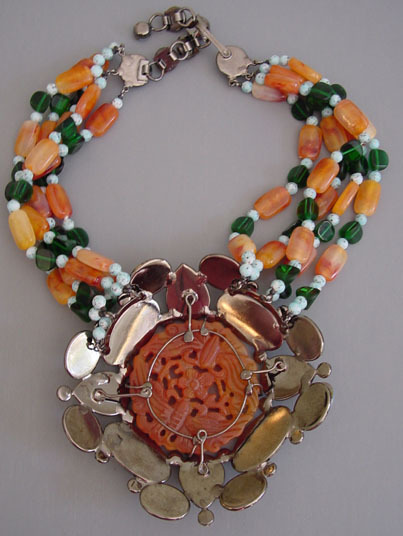 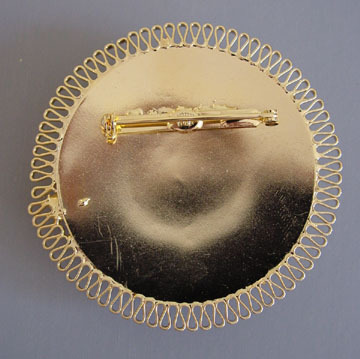 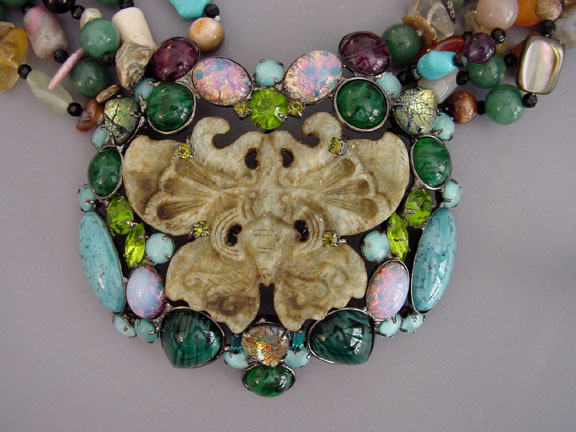 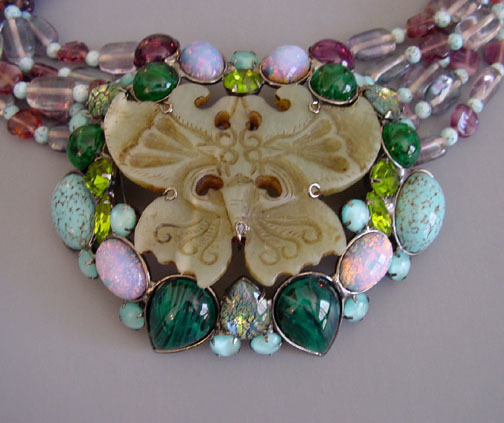 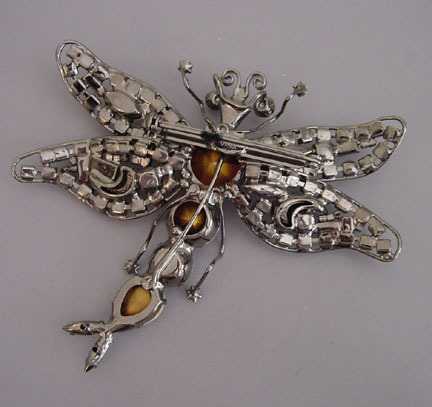 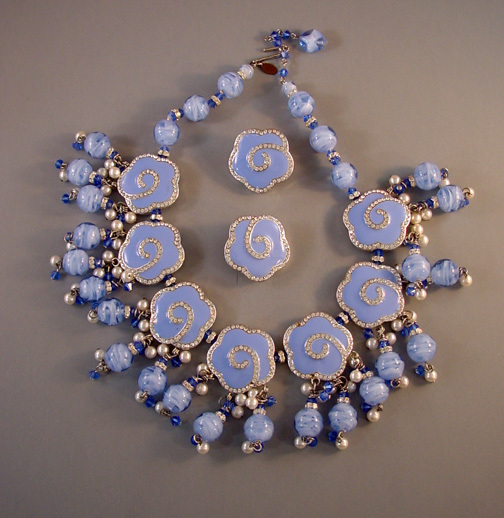 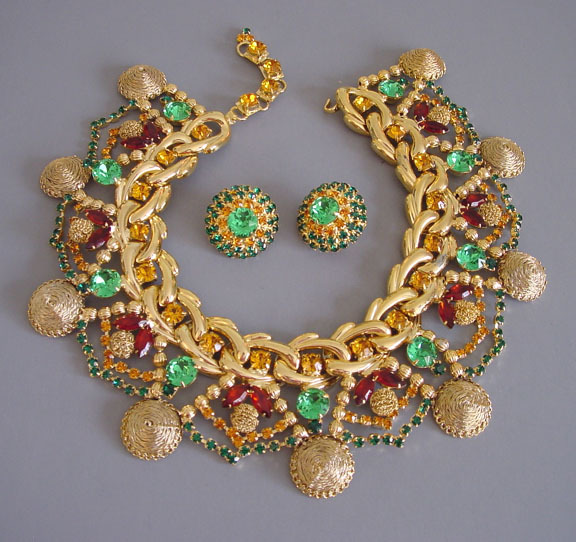 He has been making jewelry for over 50 years, and was the head designer at Miriam Haskell Jewelry in the 1970's. 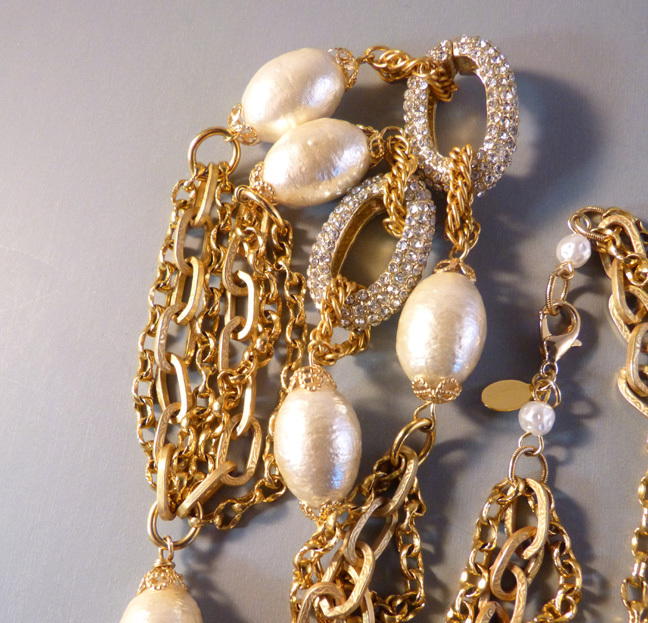 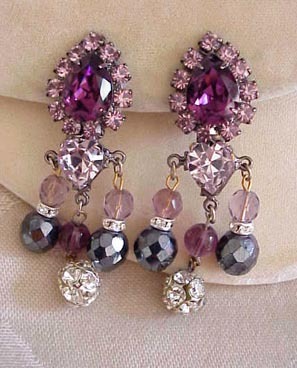 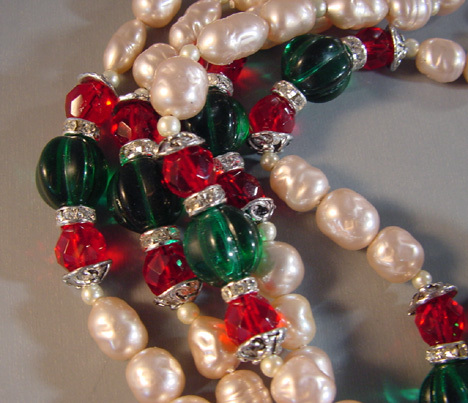 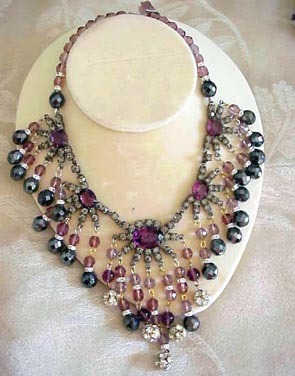 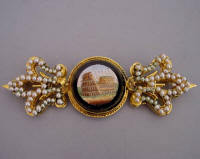 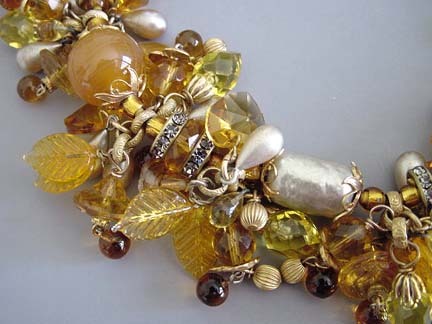 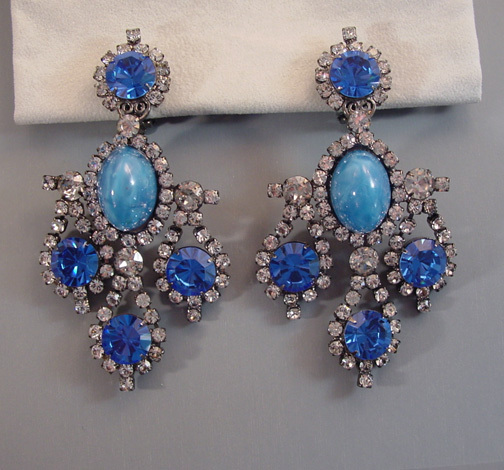 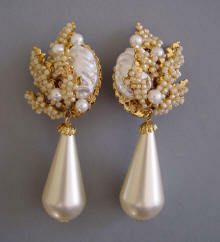 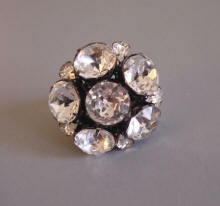 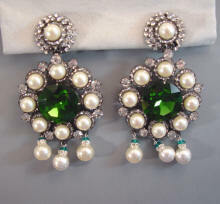 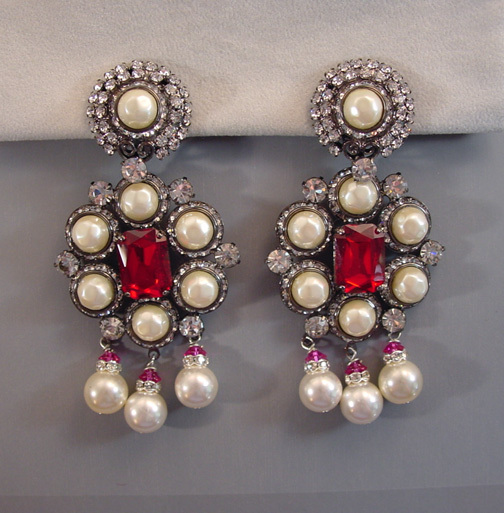 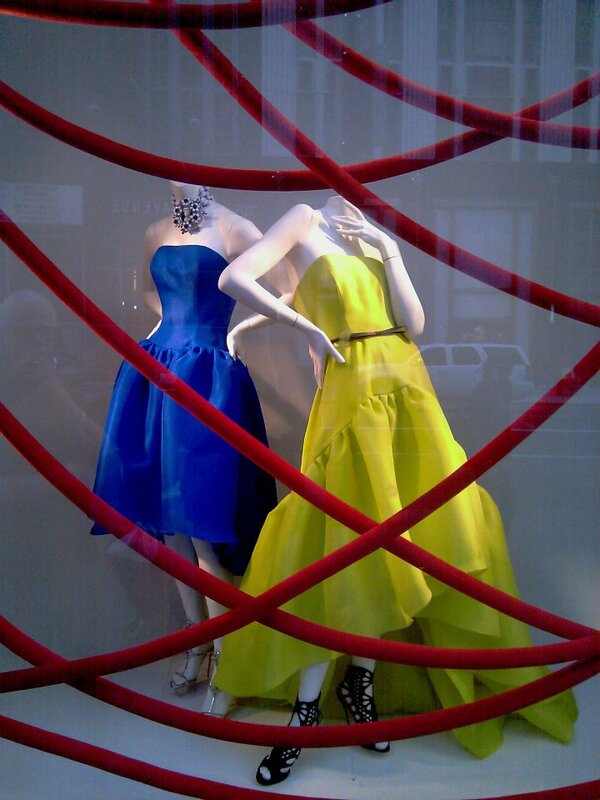 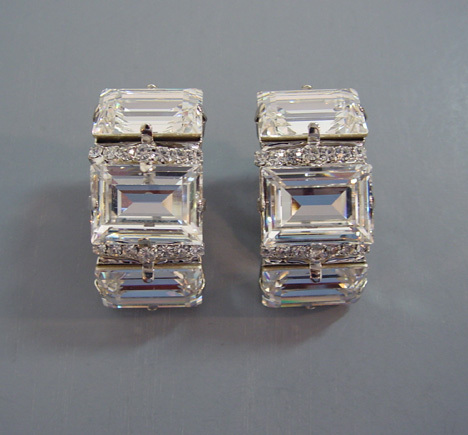 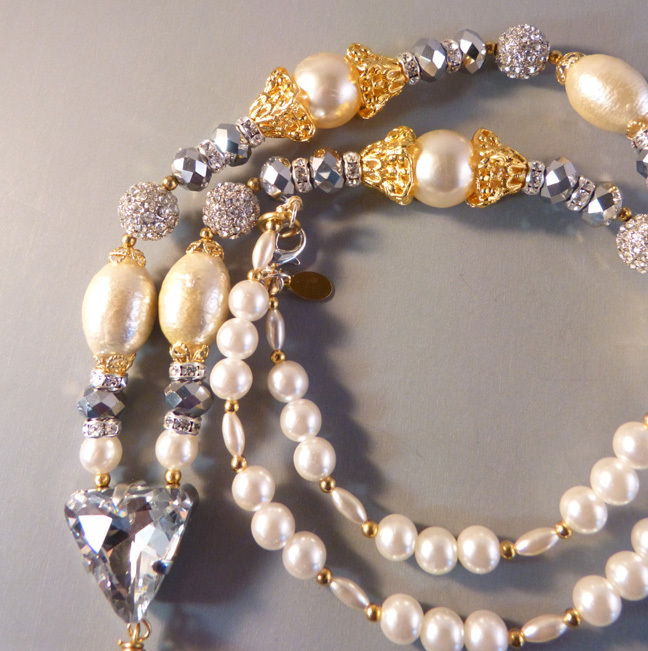 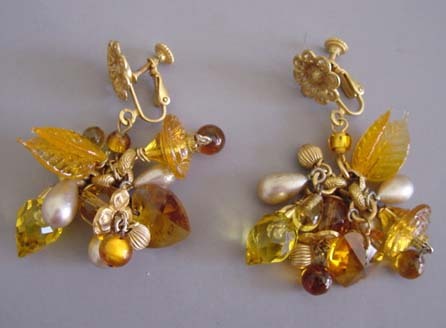 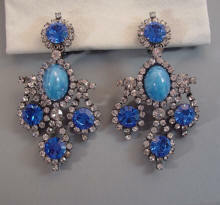 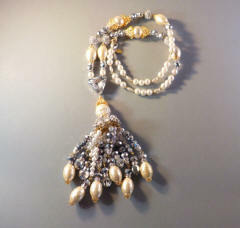 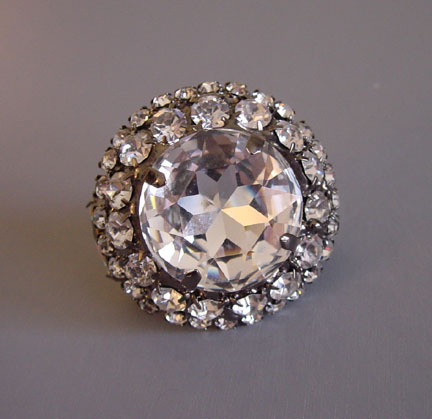 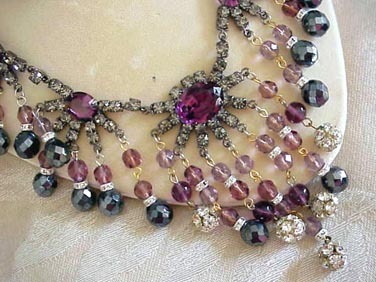 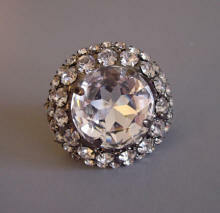 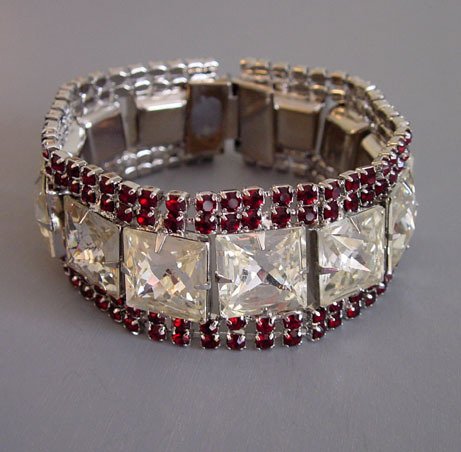 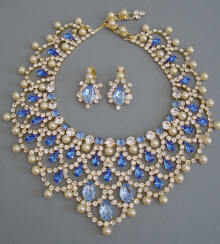 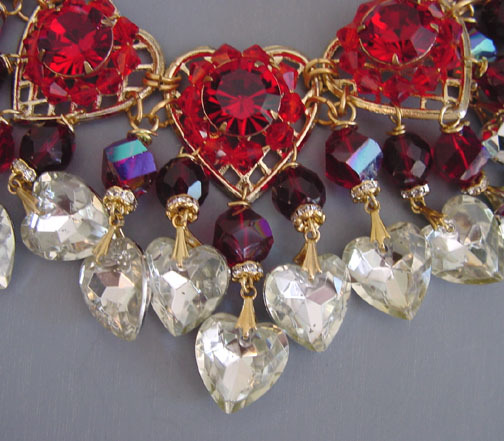 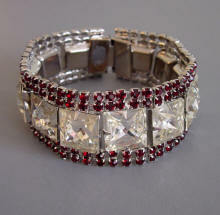 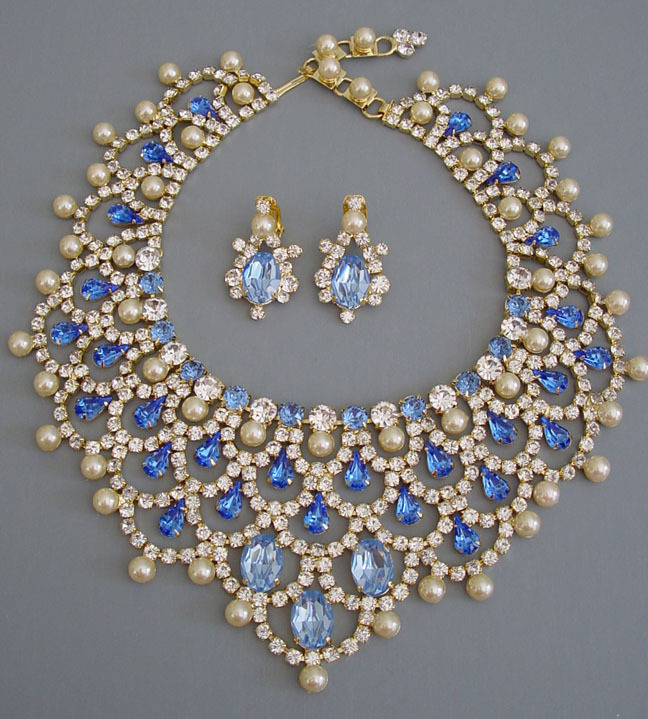 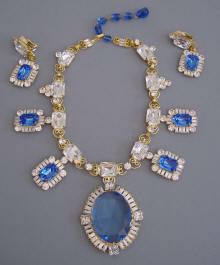 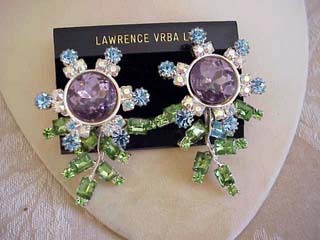 Larry makes jewelry for the Broadway Stage and the Opera as well as for boutiques, balls and vintage jewelry shops. 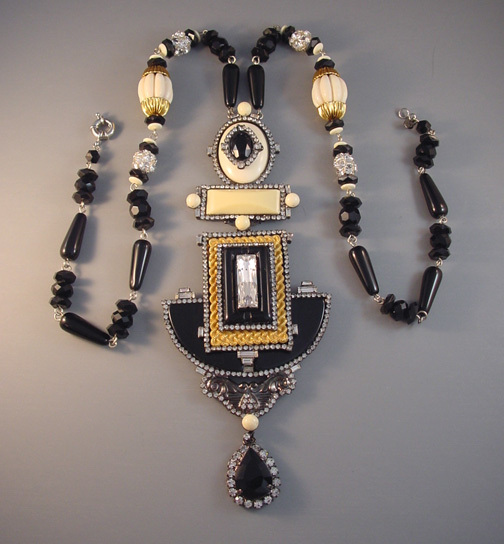 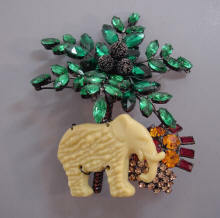 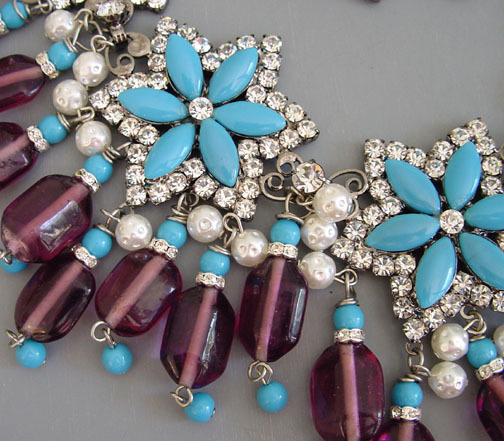 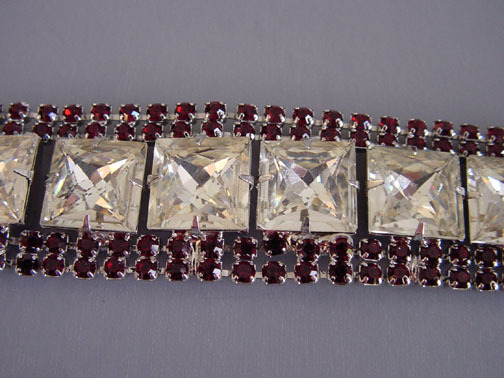 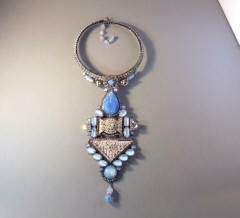 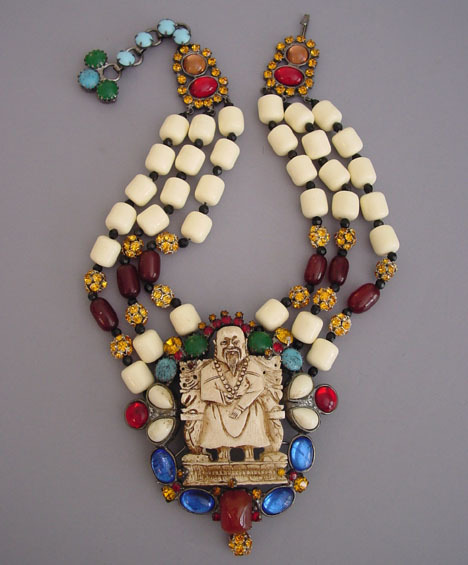 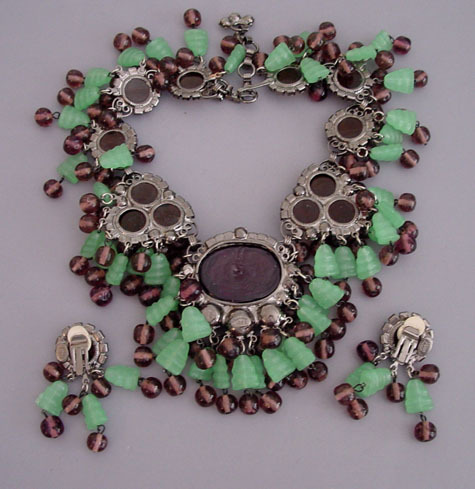 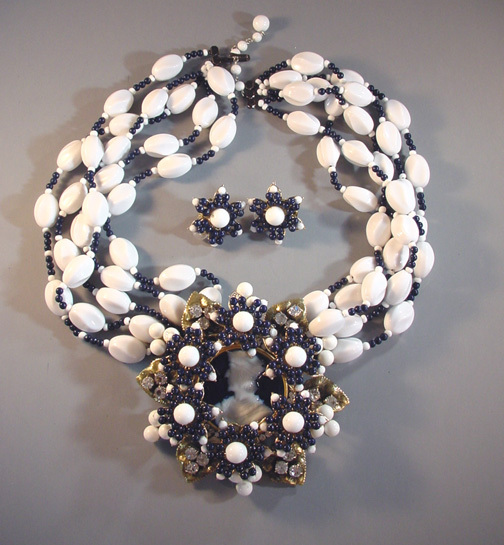 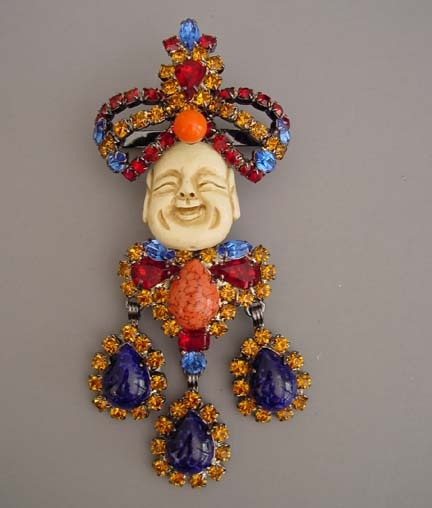 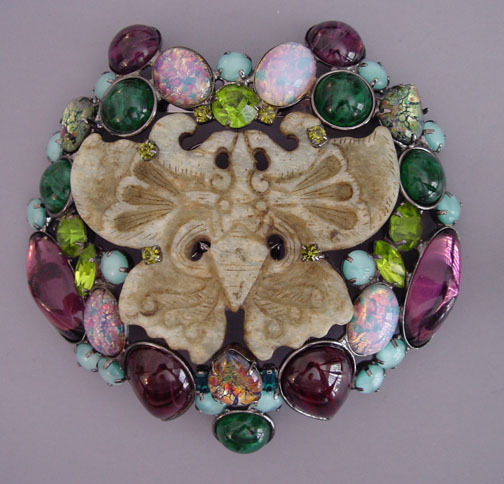 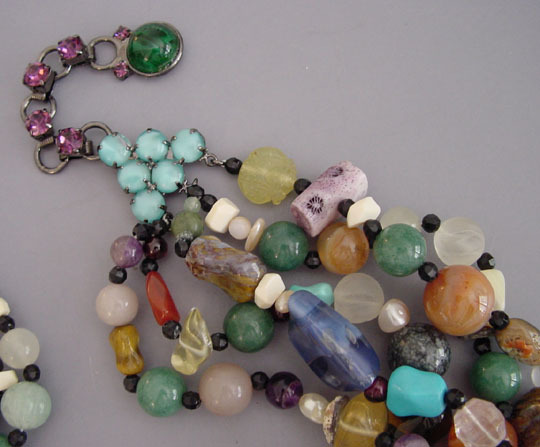 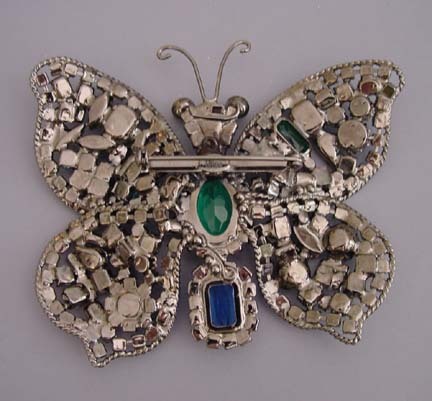 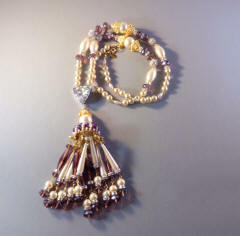 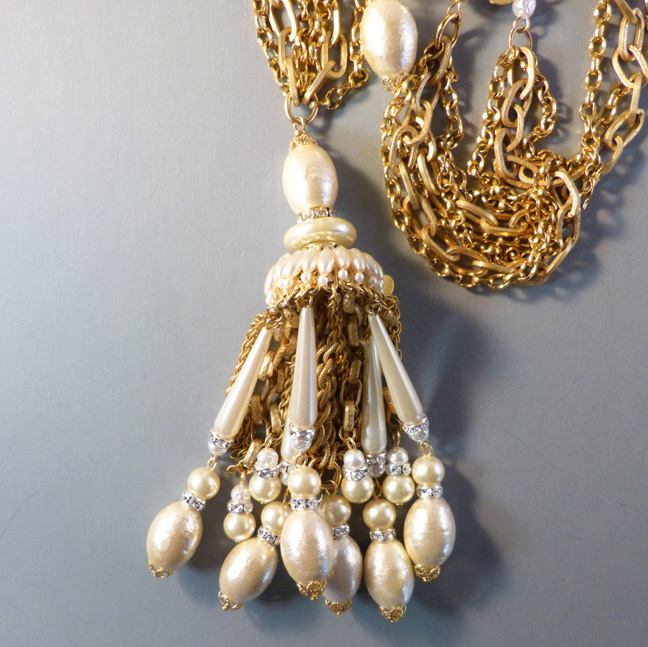 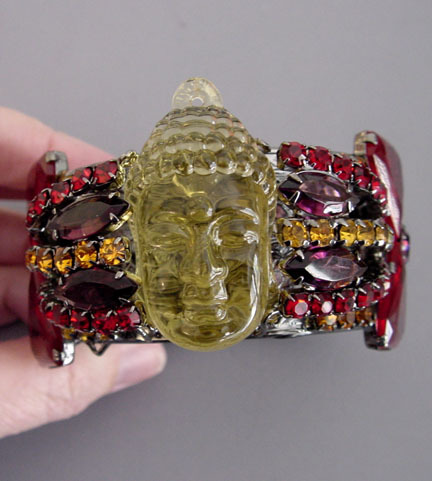 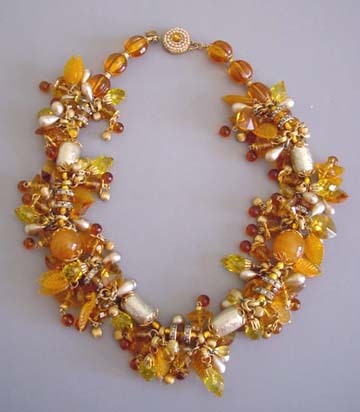 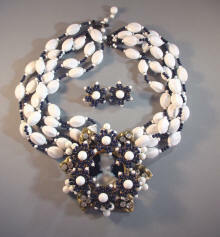 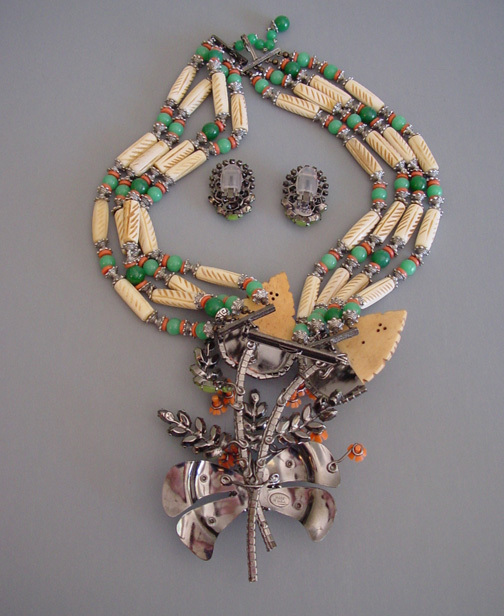 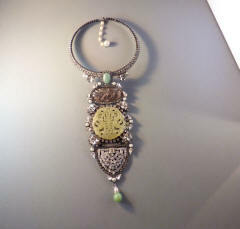 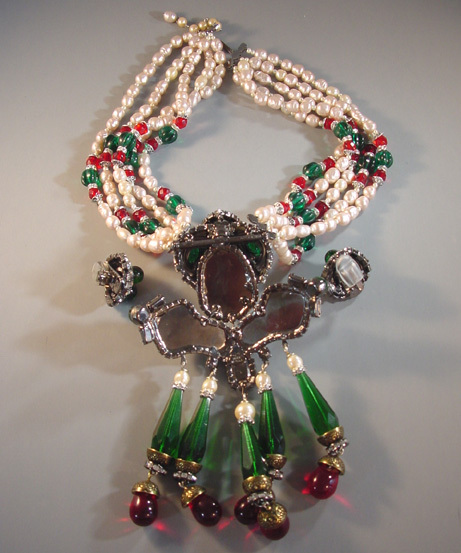 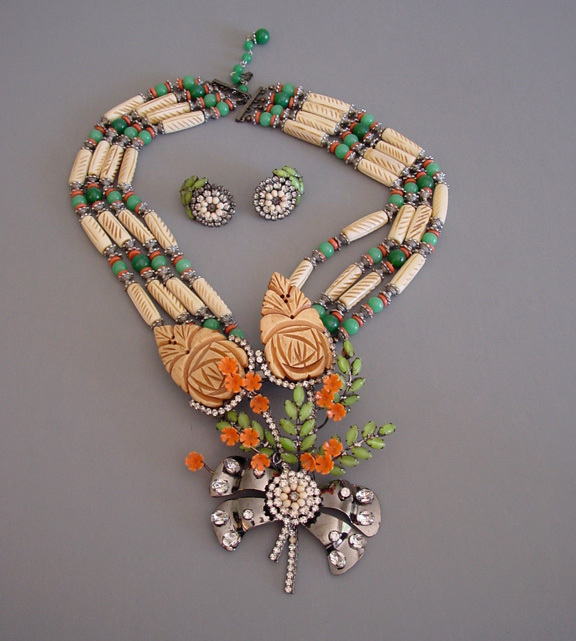 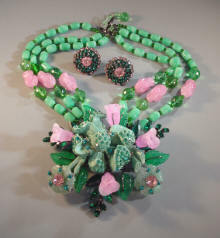 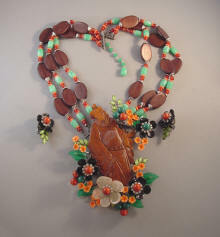 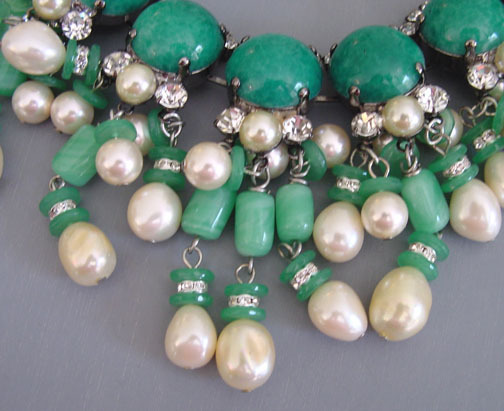 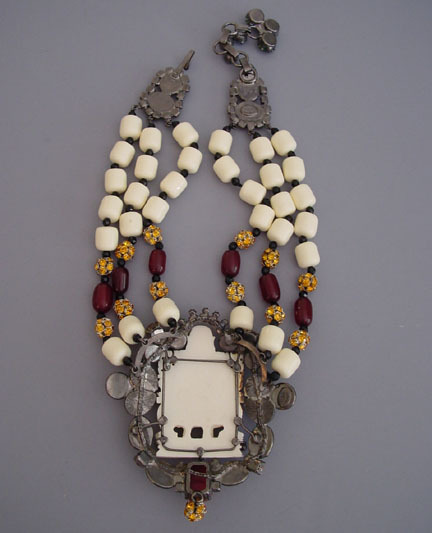 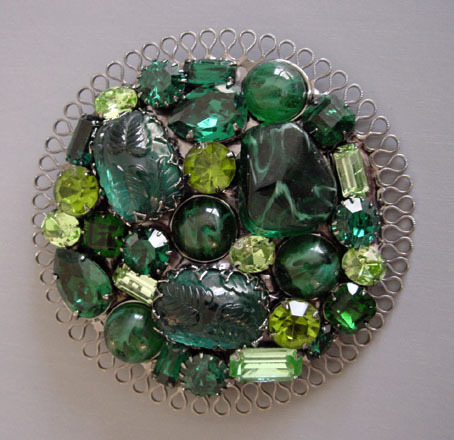 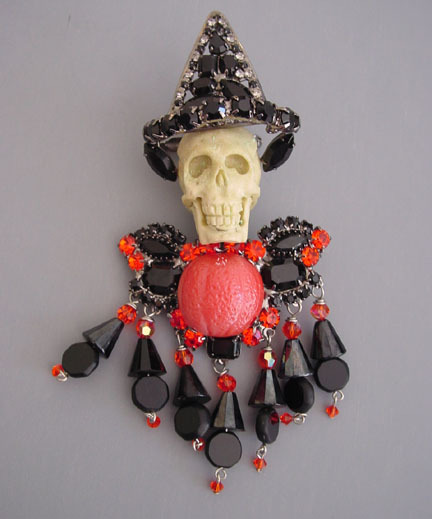 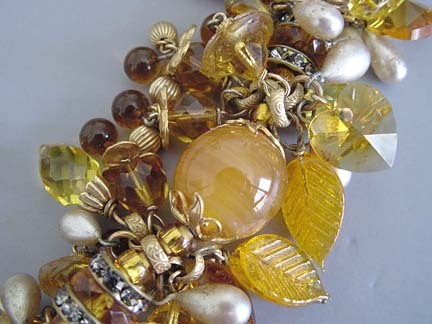 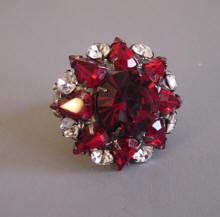 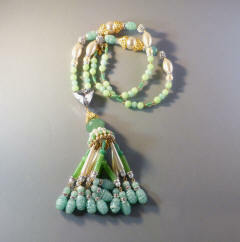 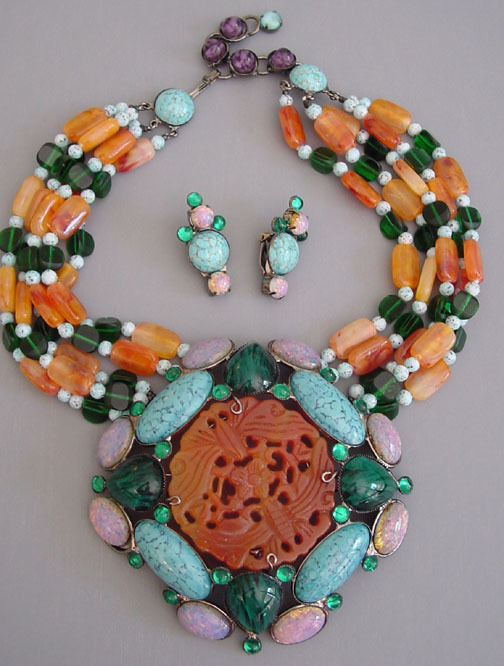 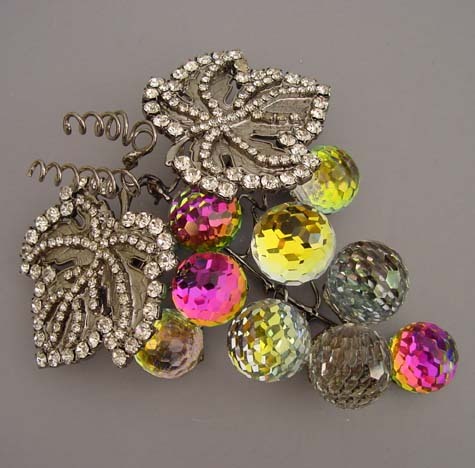 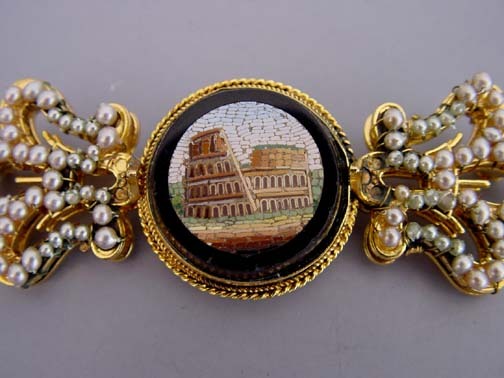 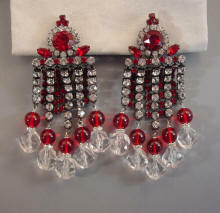 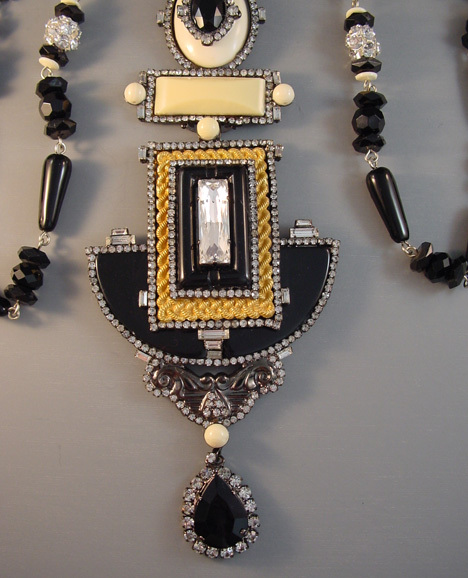 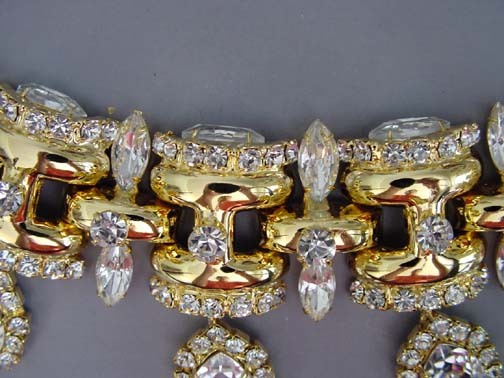 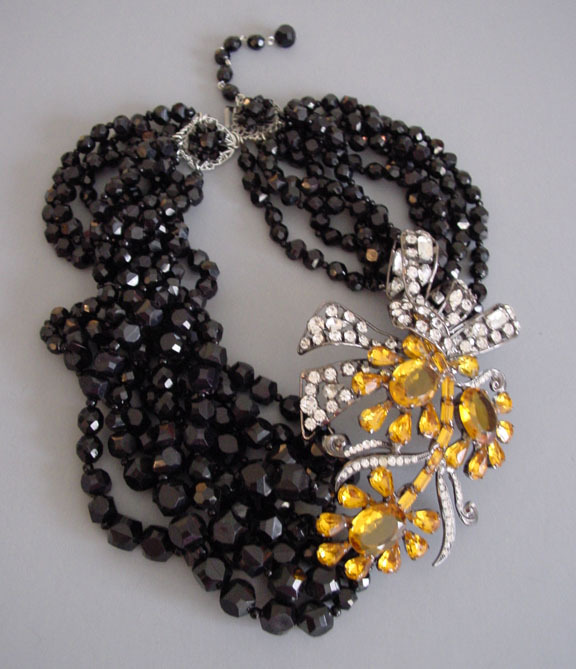 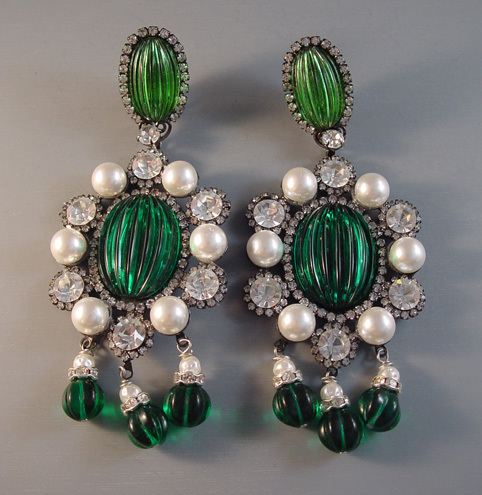 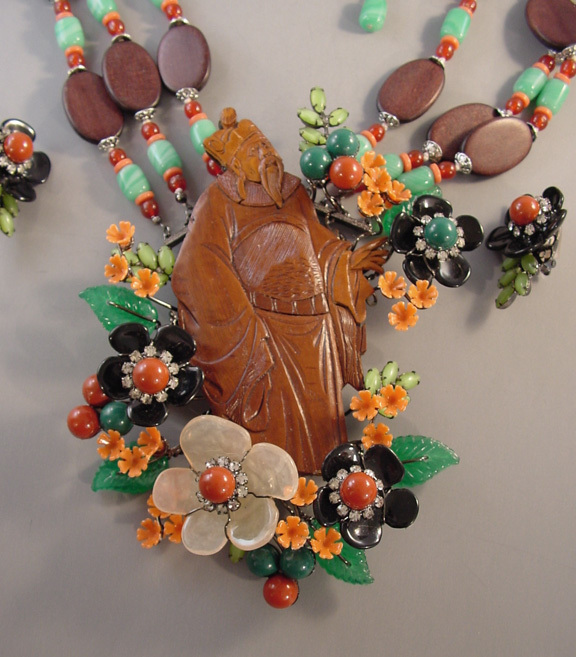 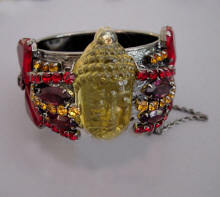 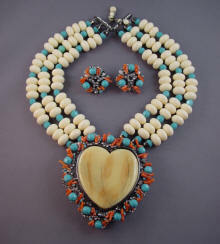 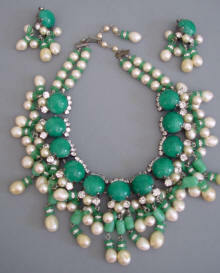 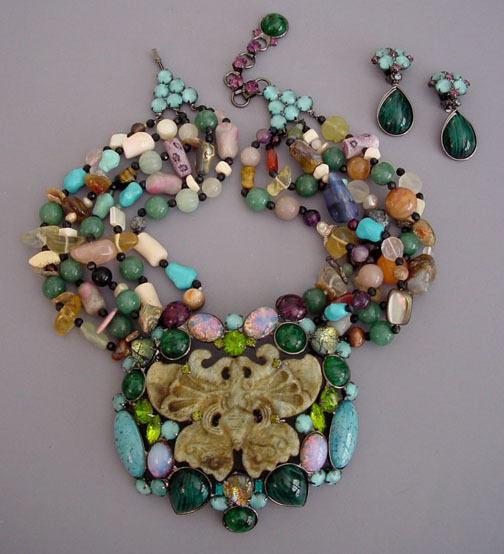 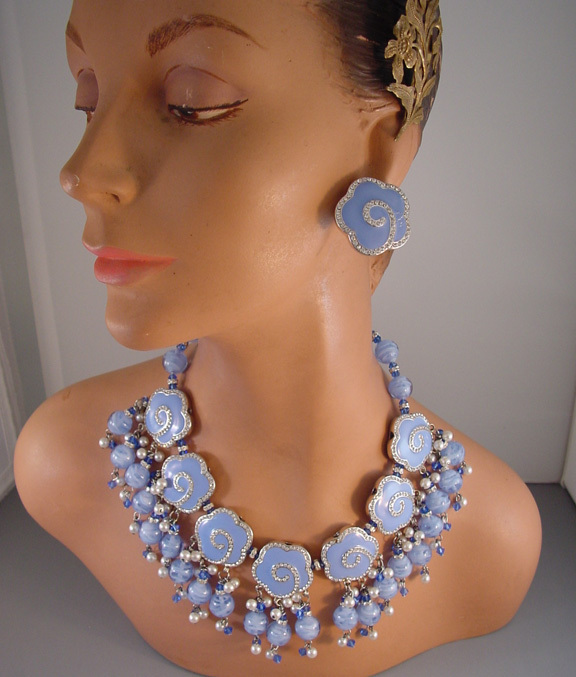 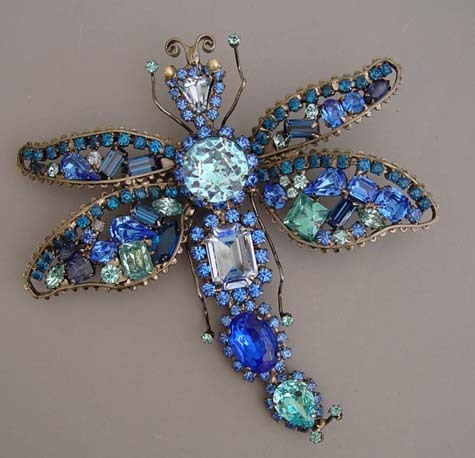 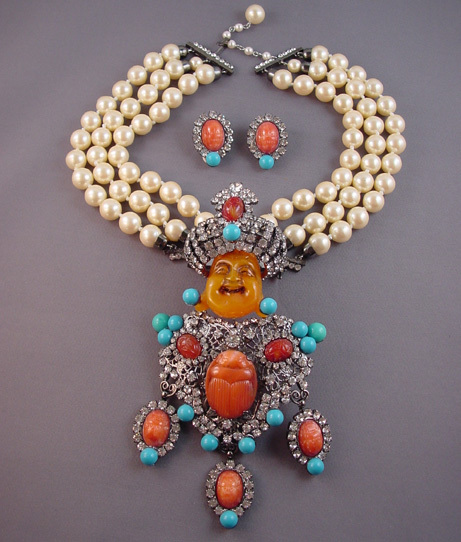 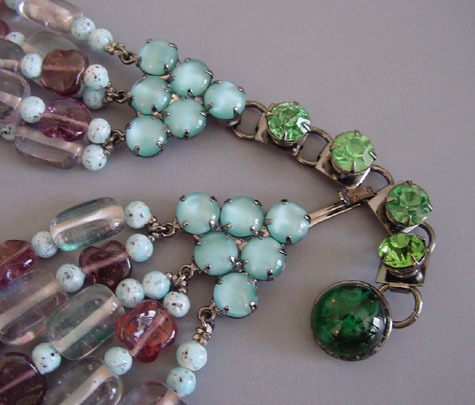 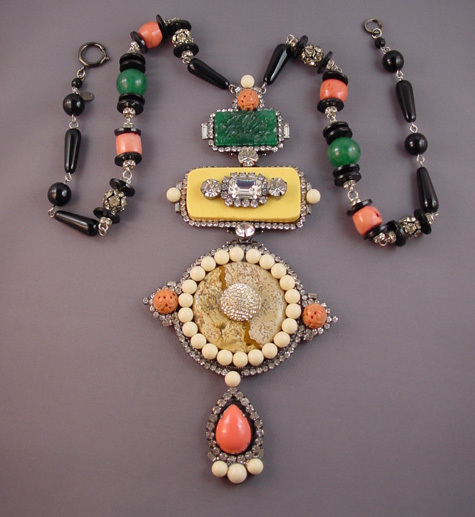 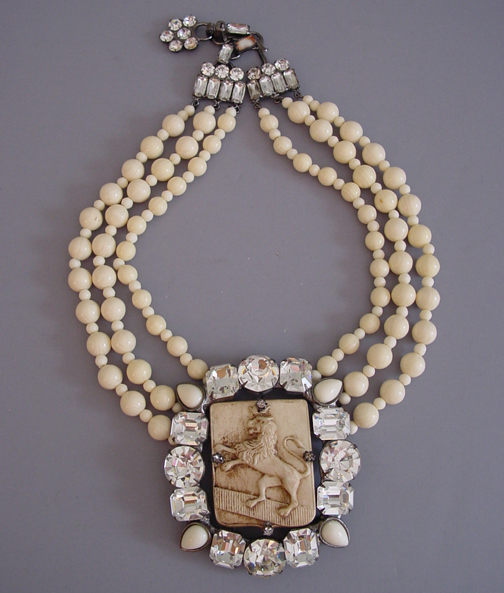 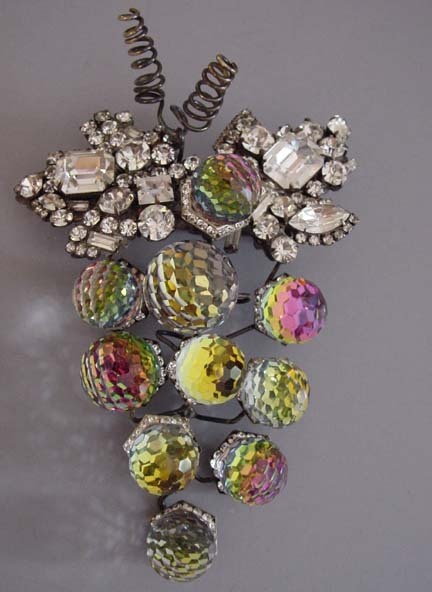 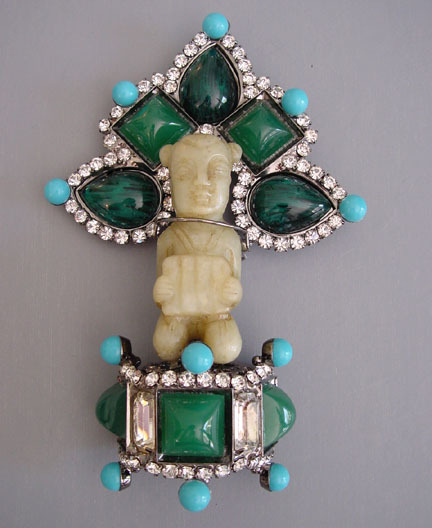 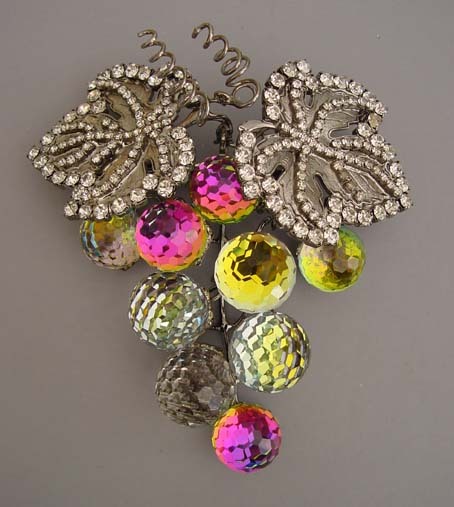 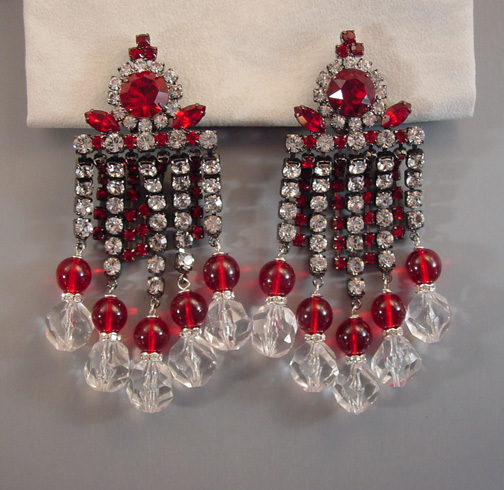 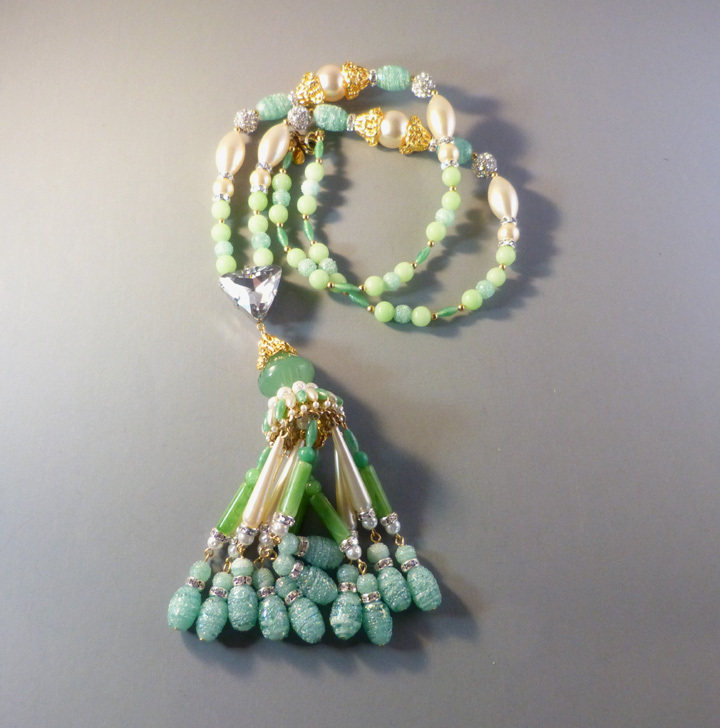 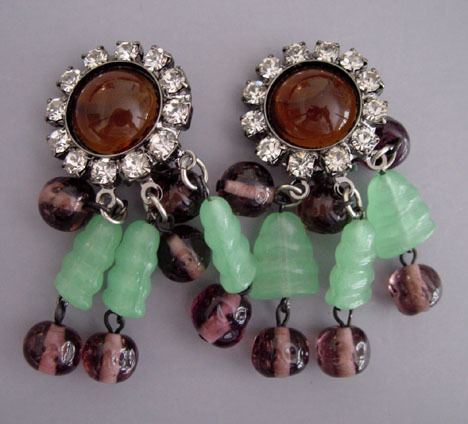 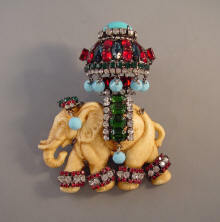 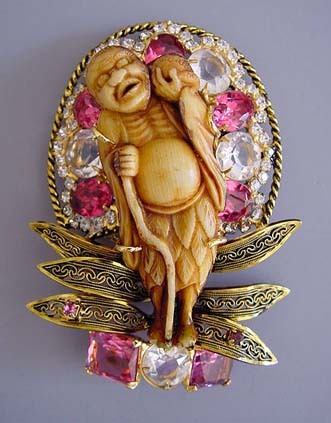 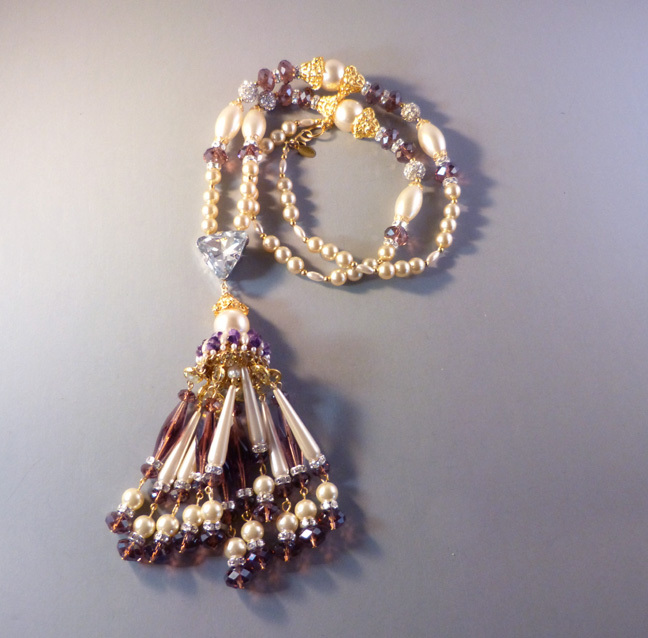 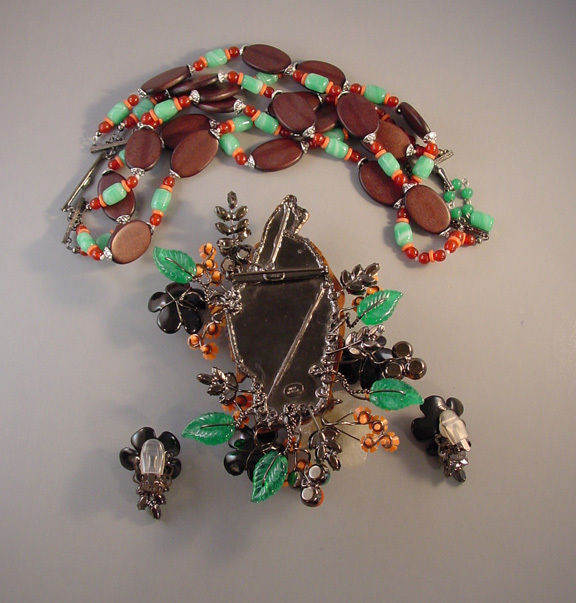 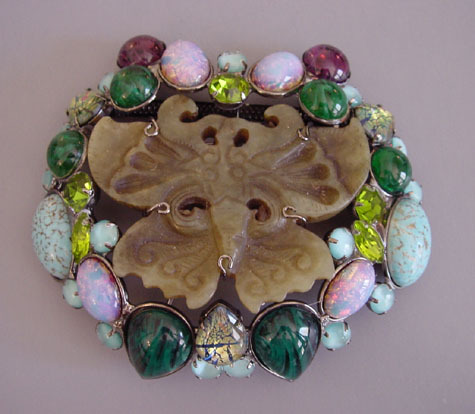 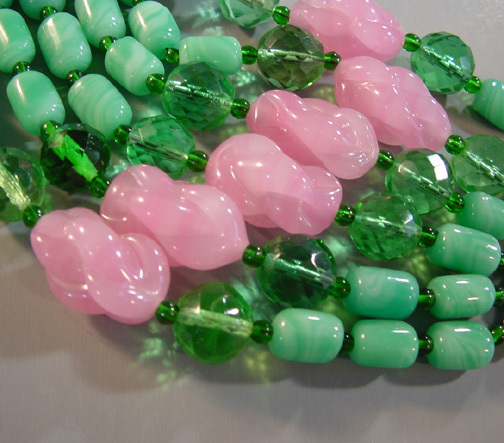 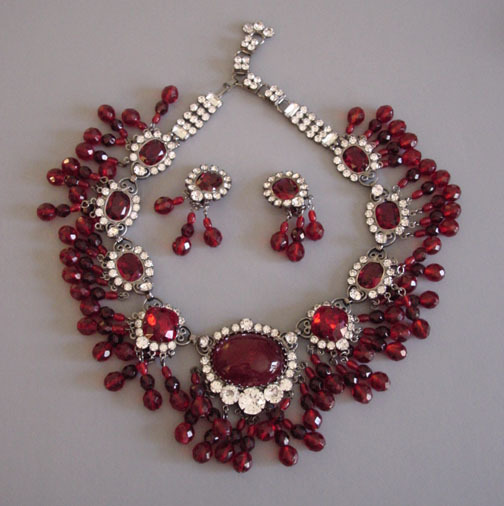 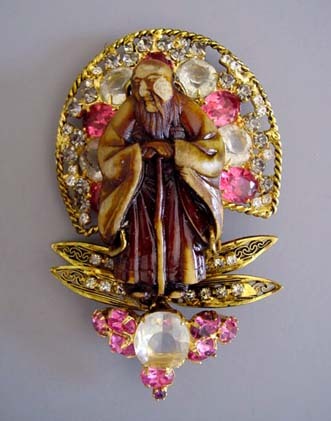 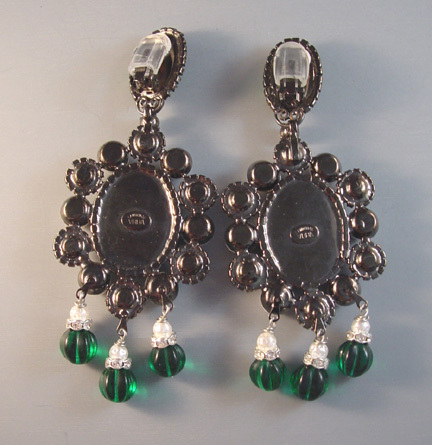 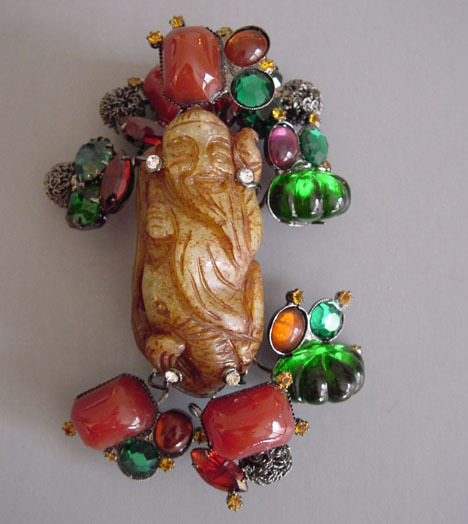 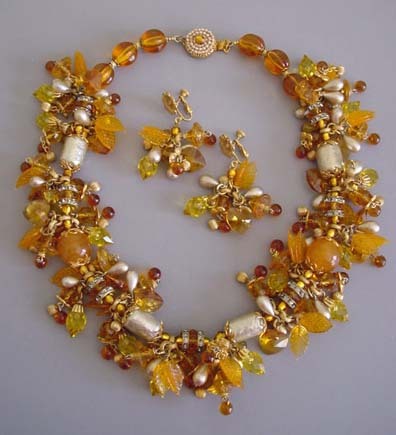 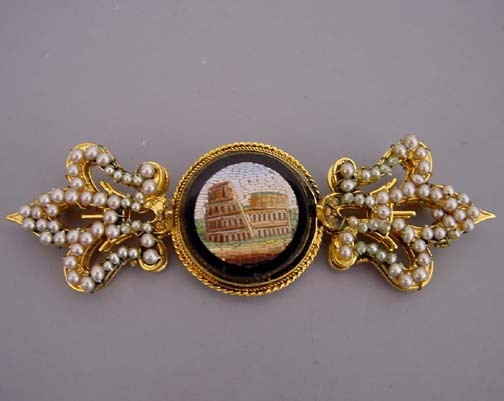 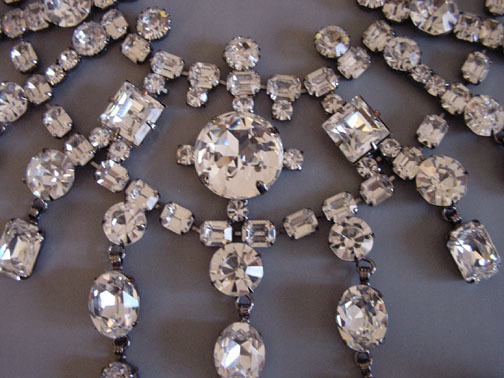 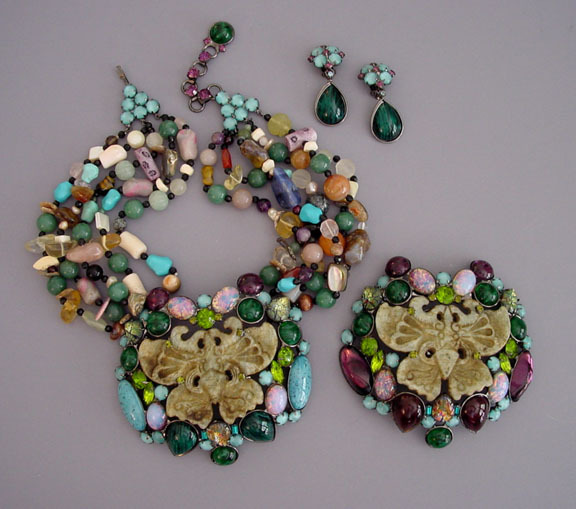 His pieces are almost always quite large, usually four inches or more, and he has a huge collection of vintage beads and rhinestones from which to fashion them. 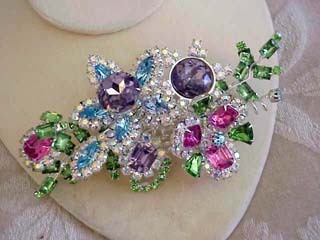 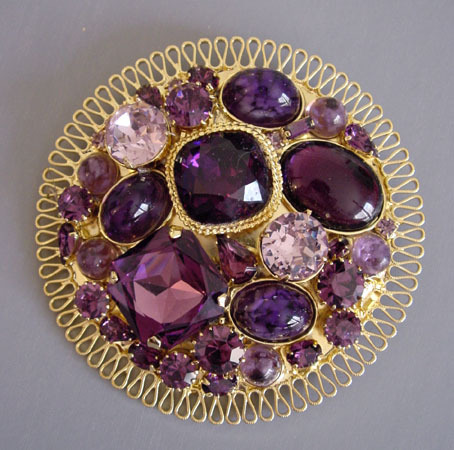 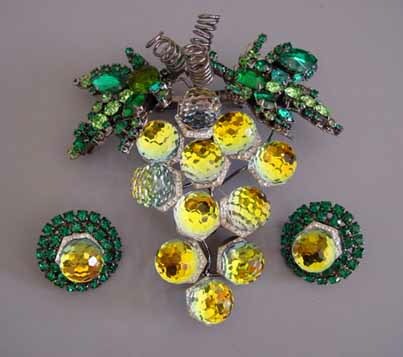 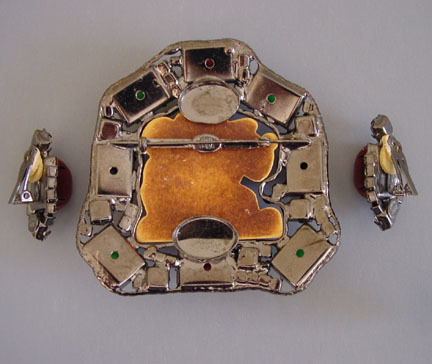 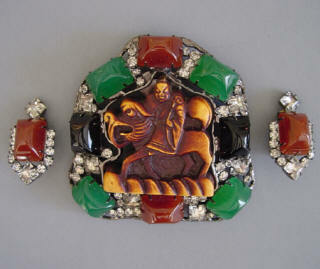 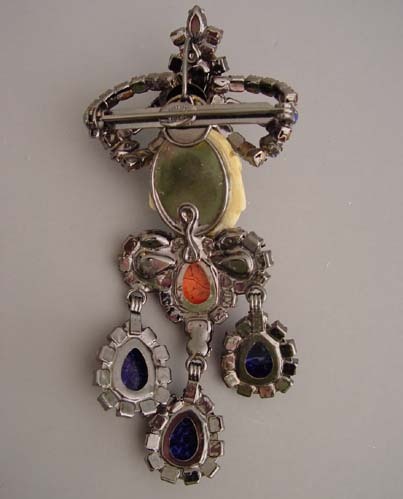 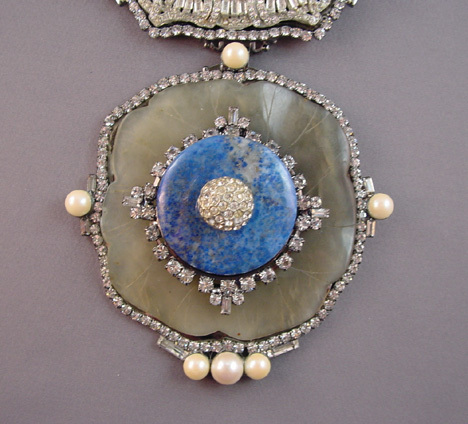 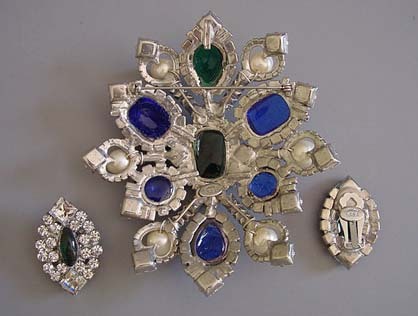 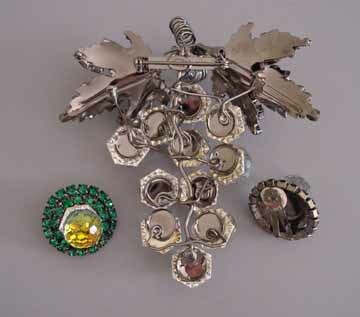 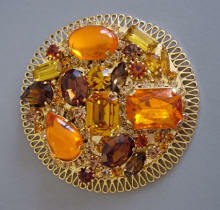 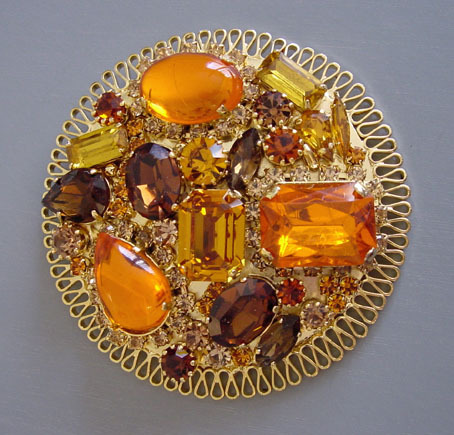 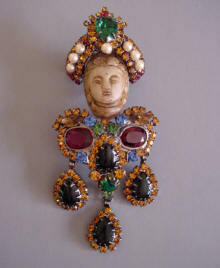 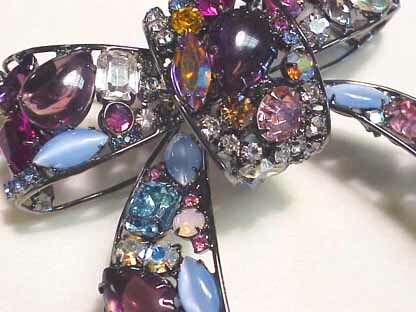 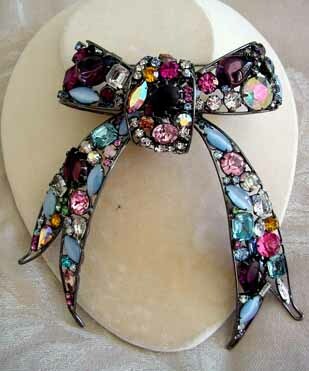 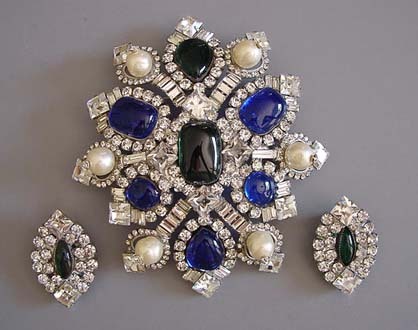 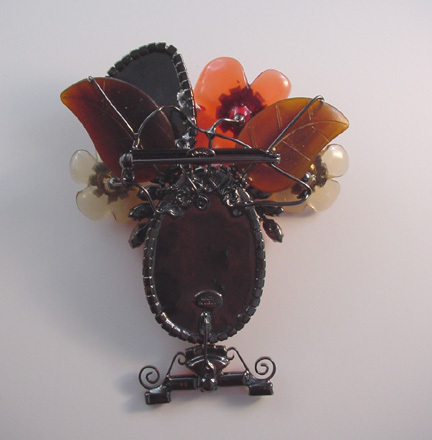 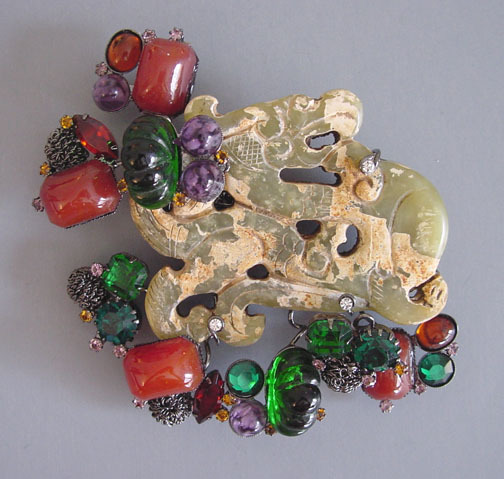 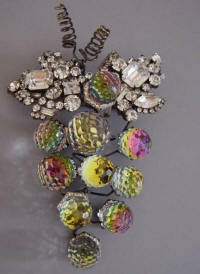 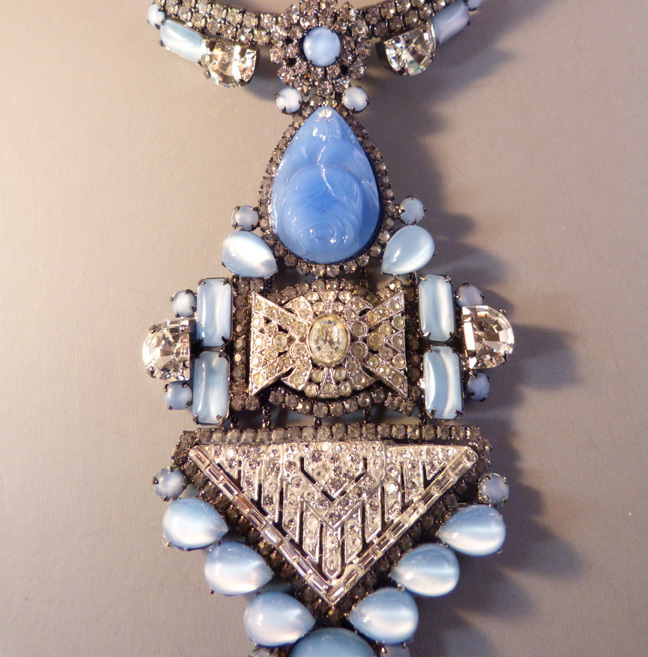 The brooch on the left is one of my favorites as it has such a rich combination of stones and colors. 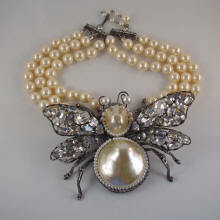 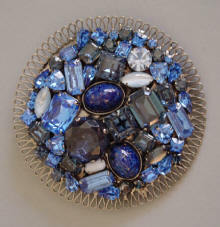 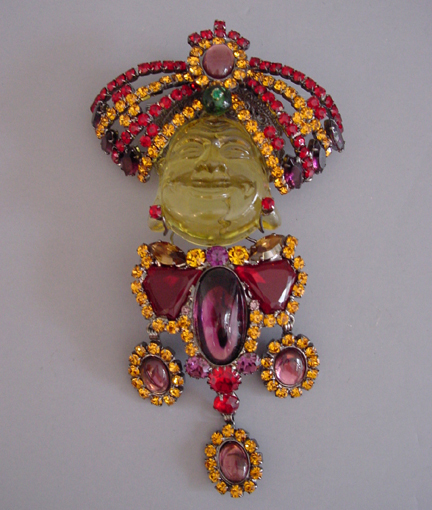 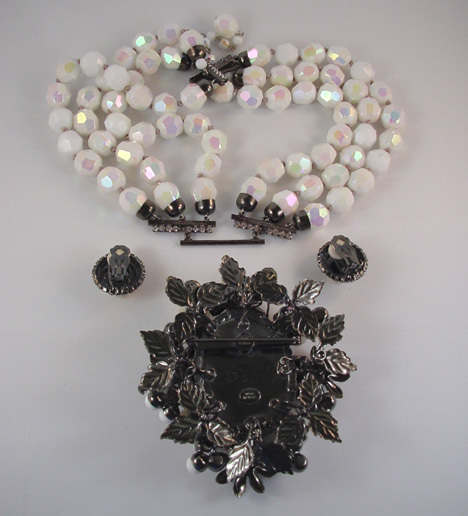 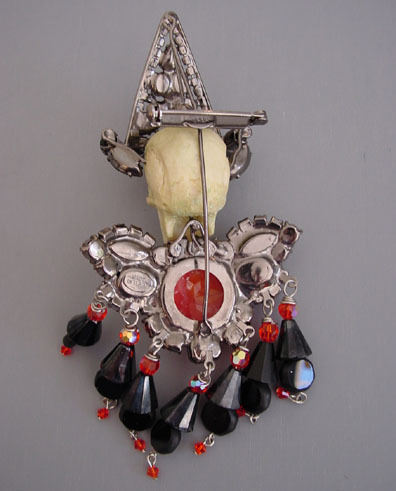 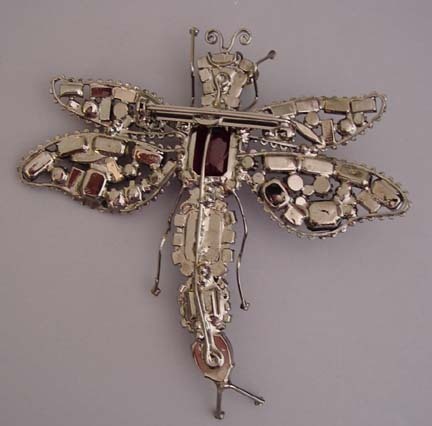 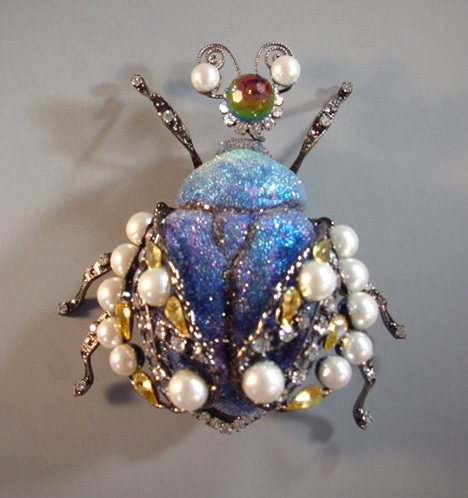 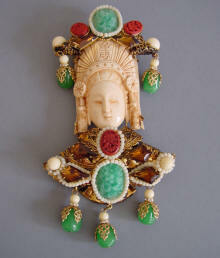 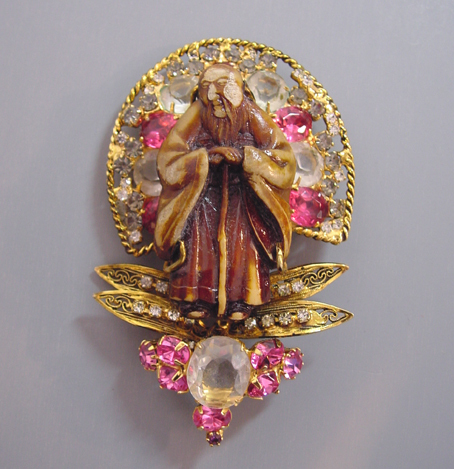 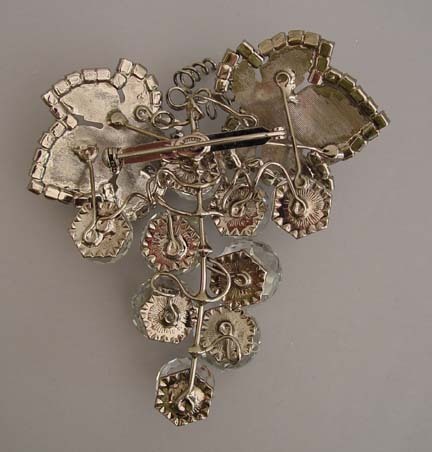 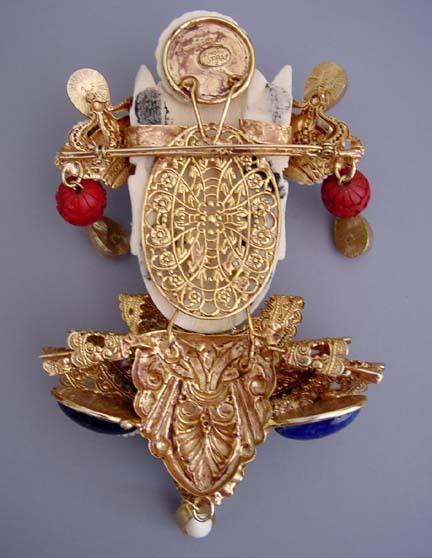 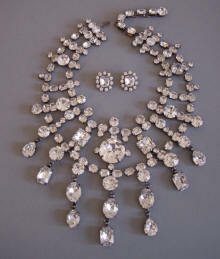 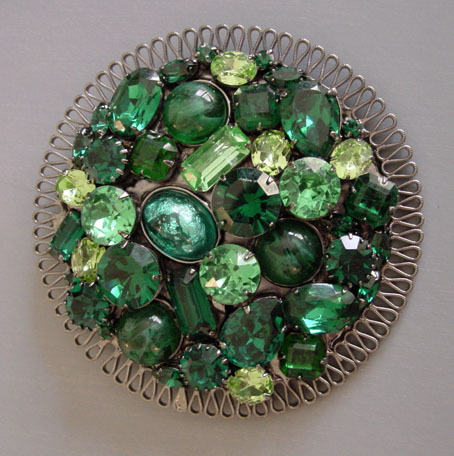 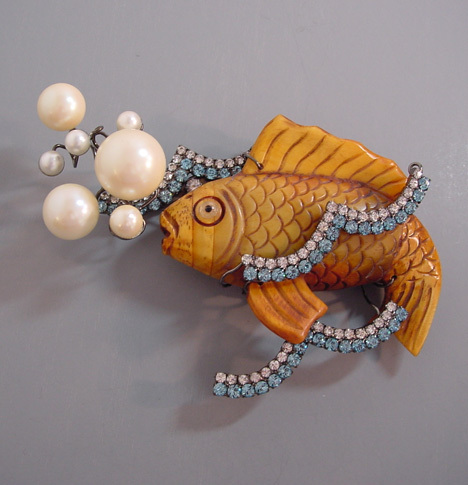 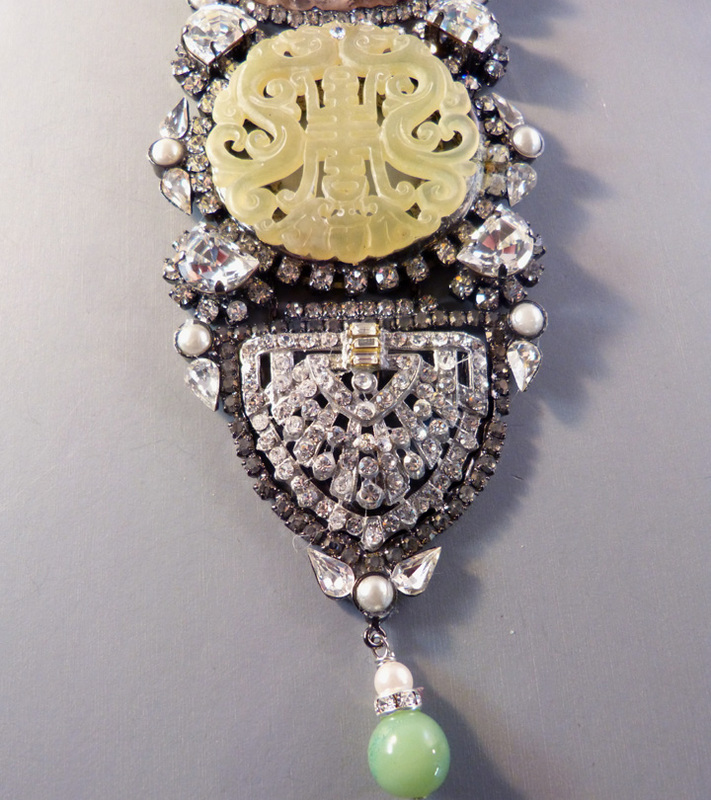 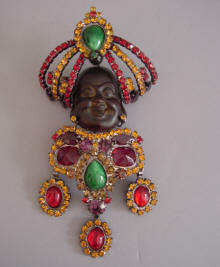 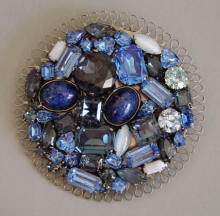 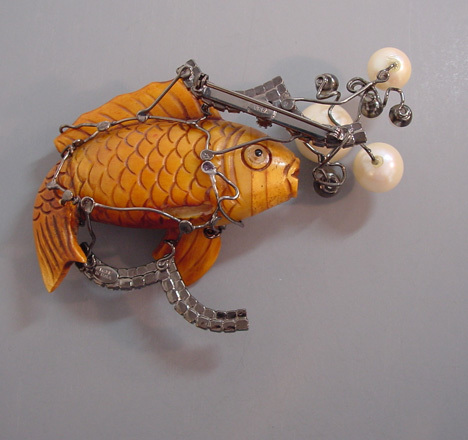 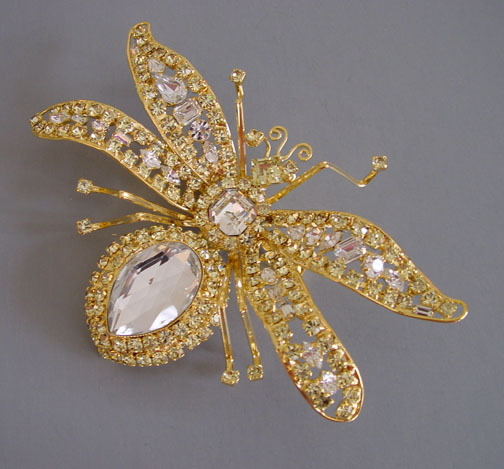 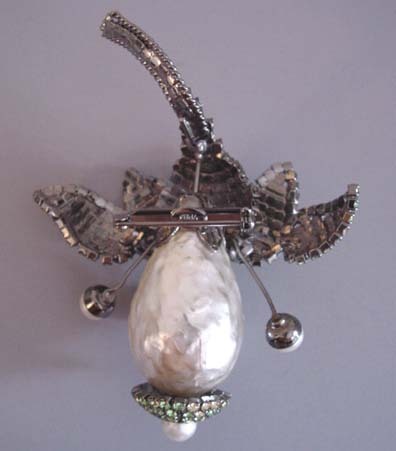 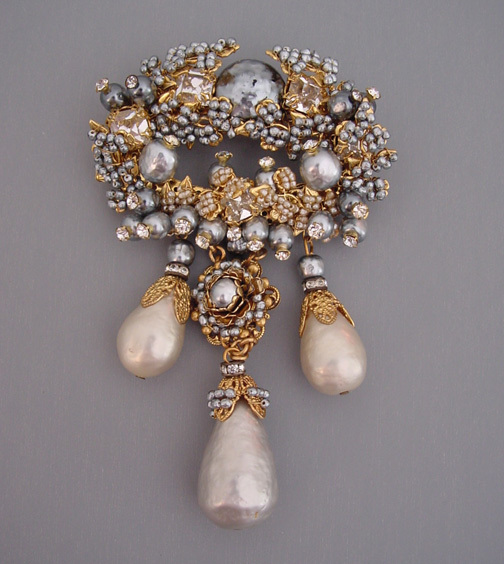 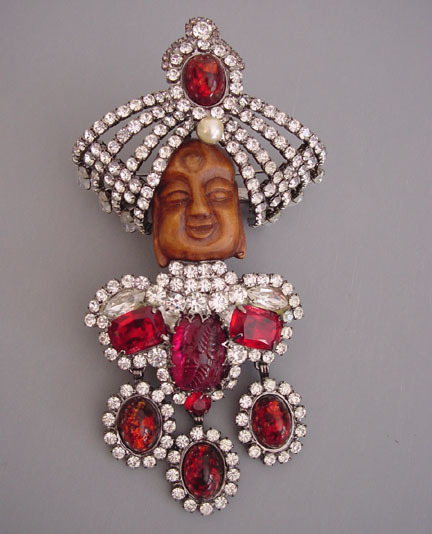 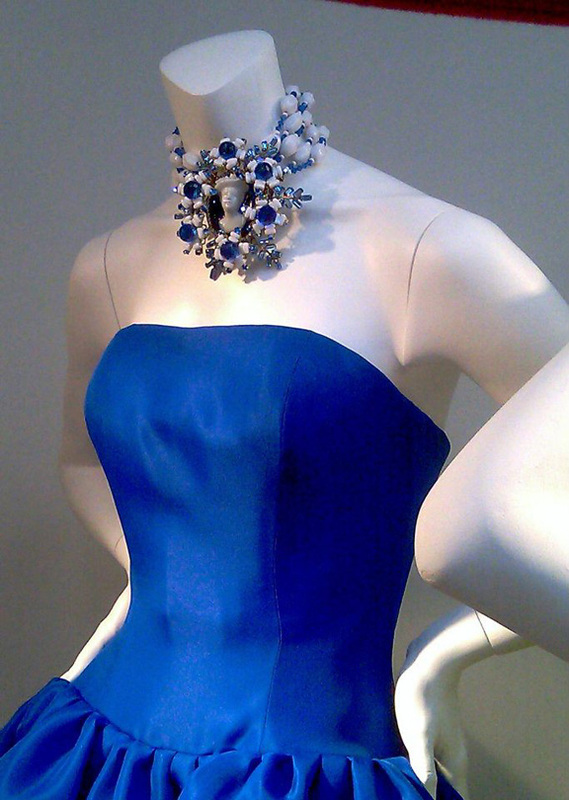 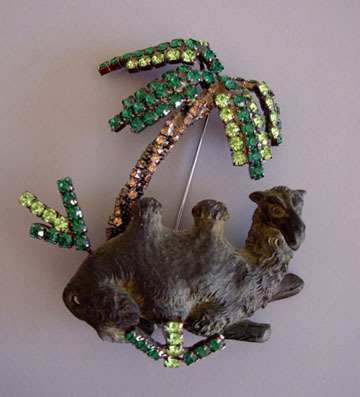 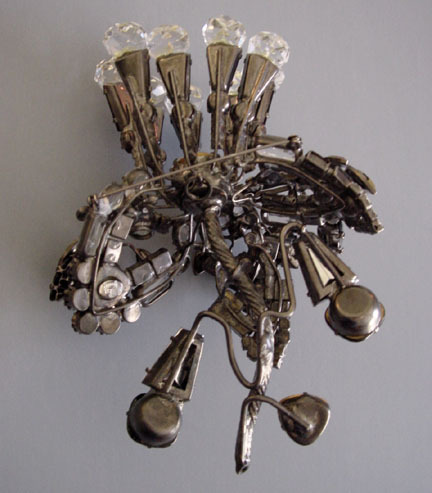 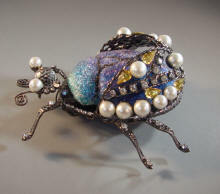 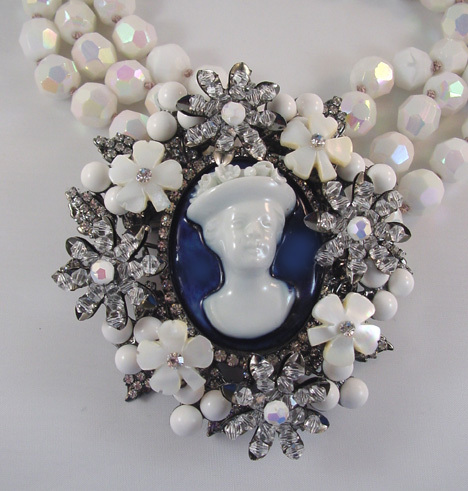 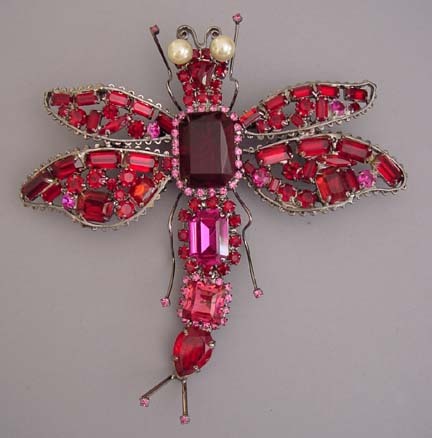 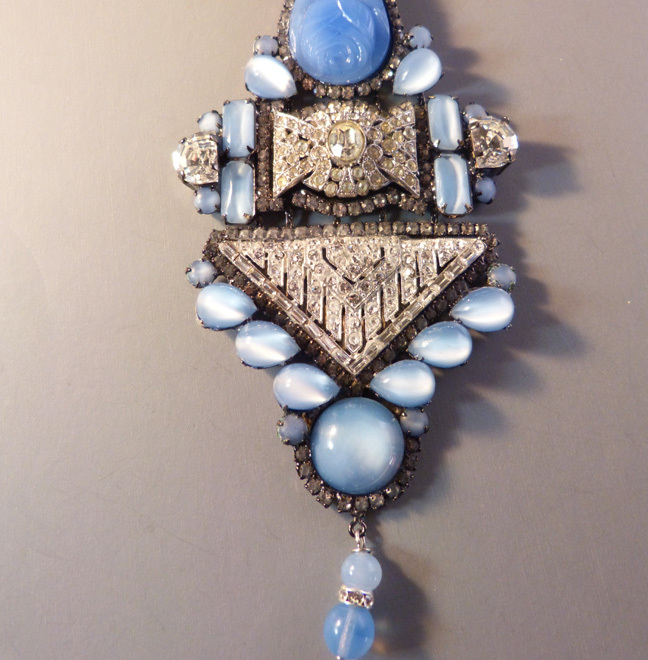 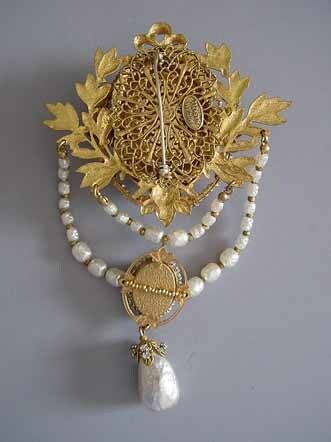 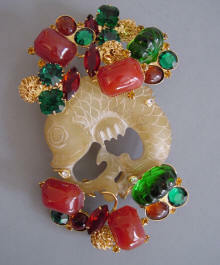 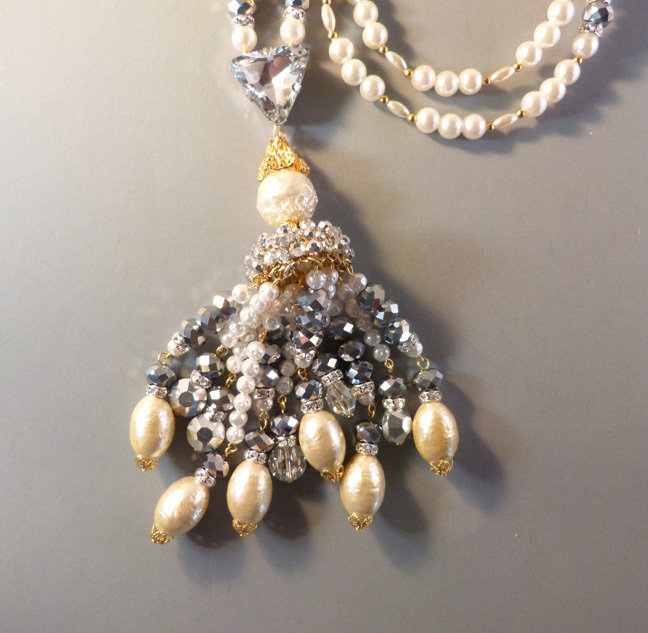 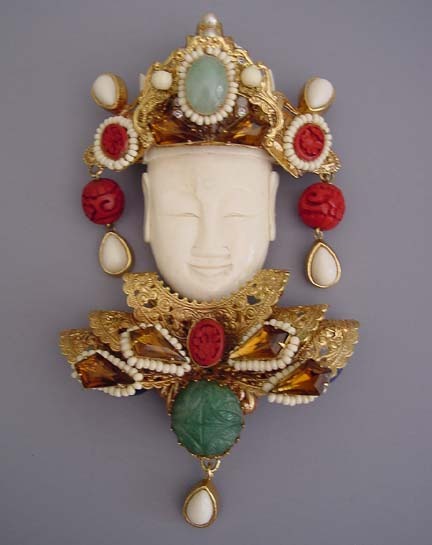 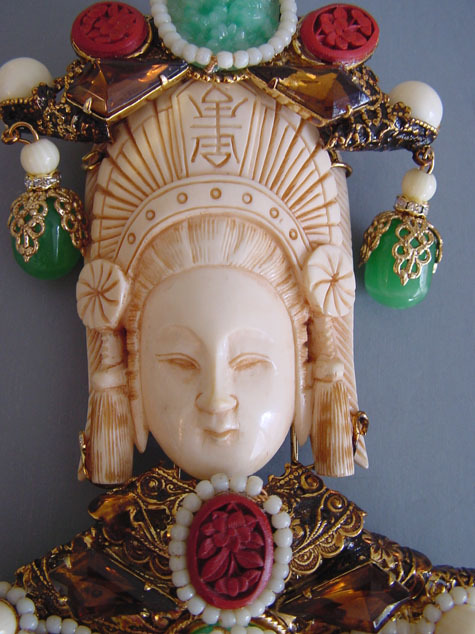 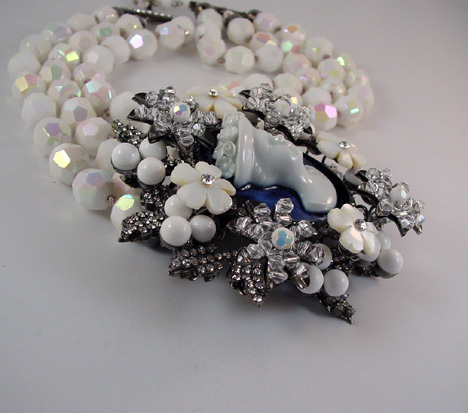 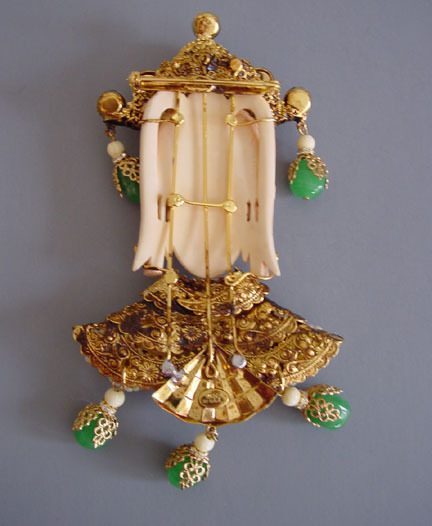 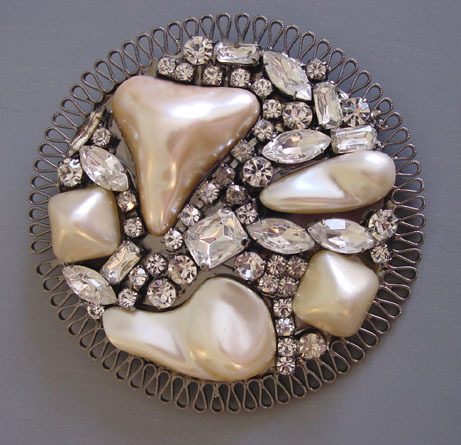 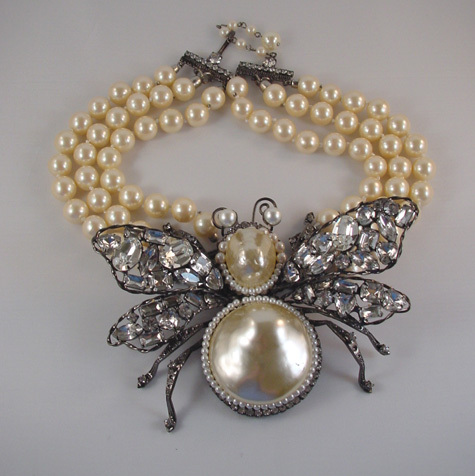 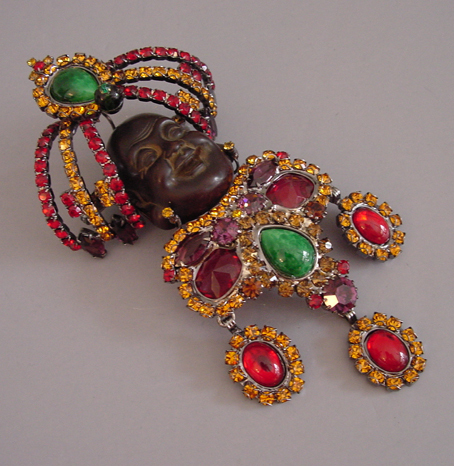 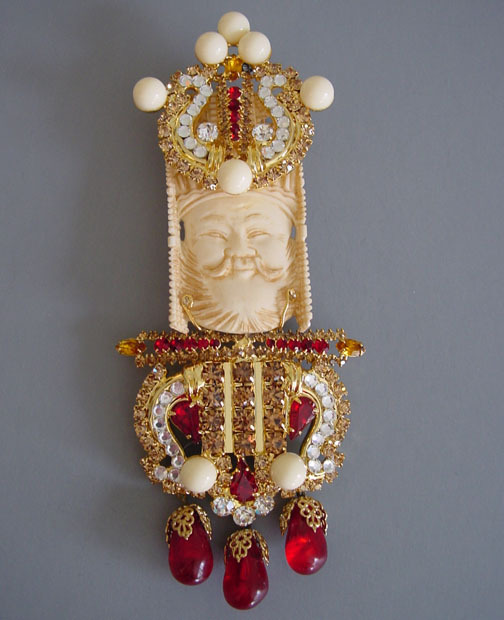 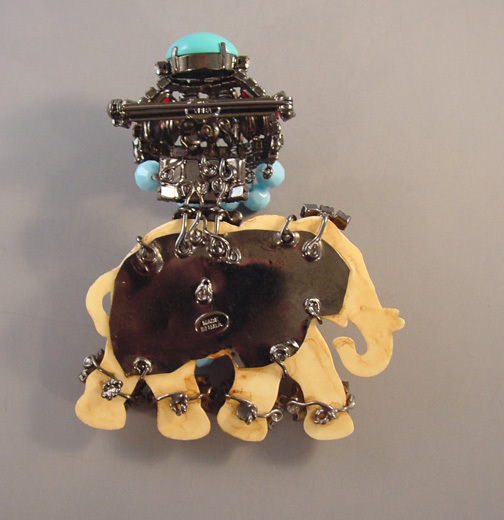 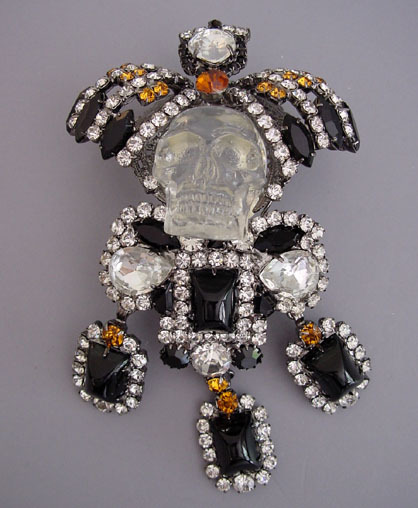 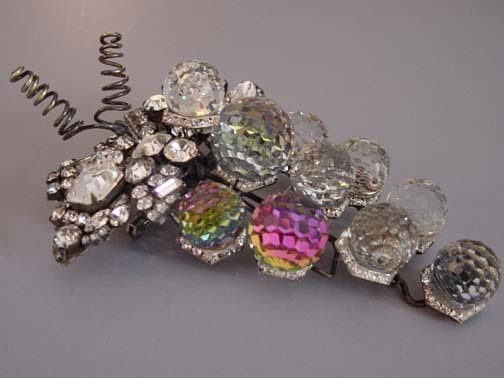 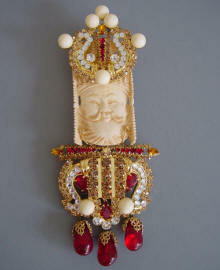 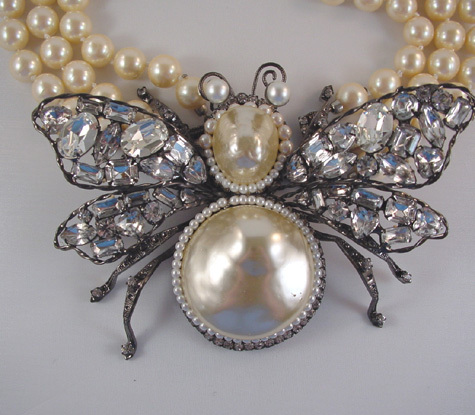 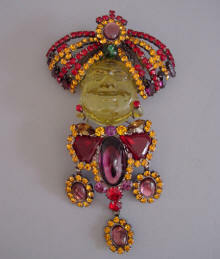 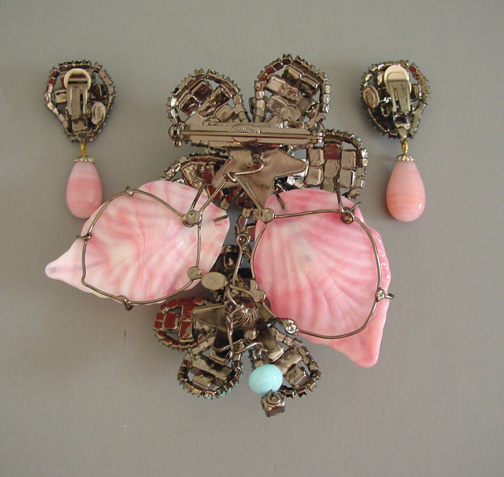 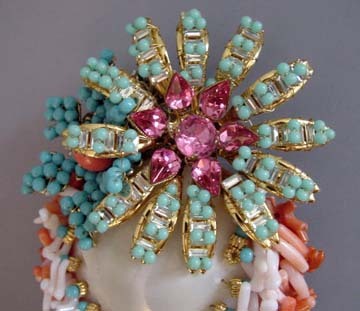 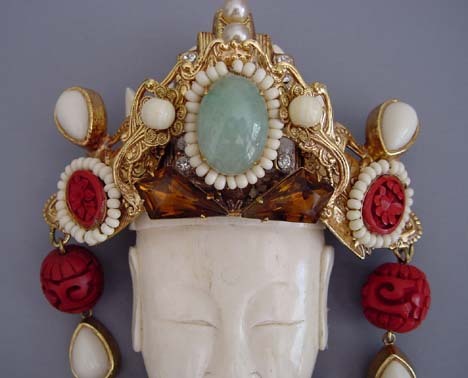 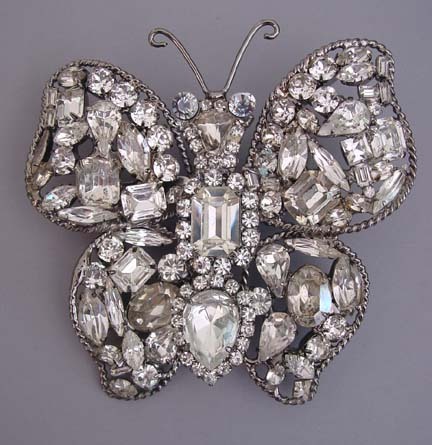 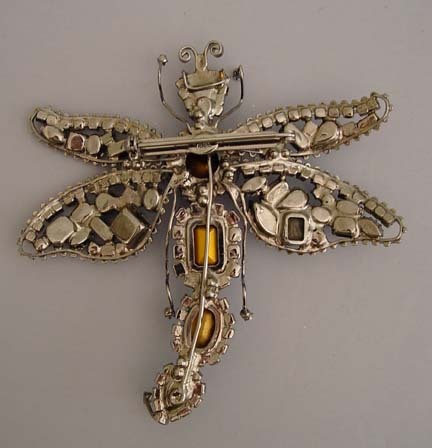 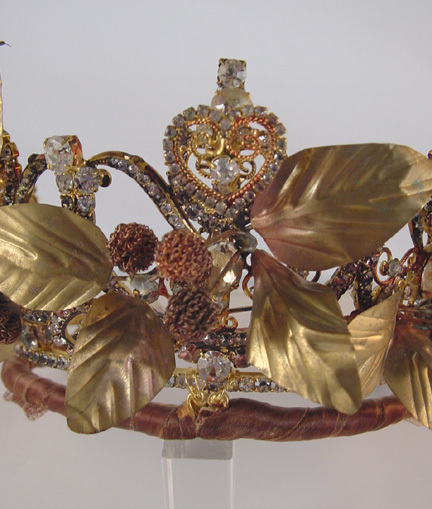 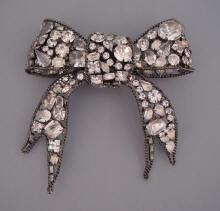 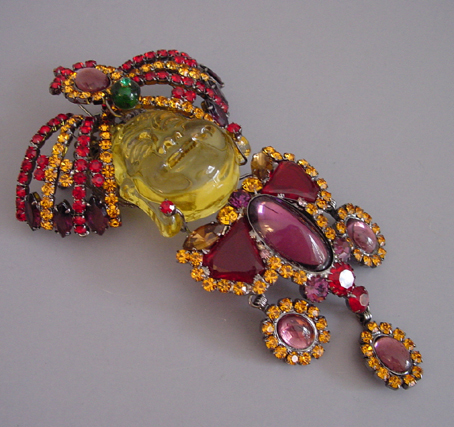 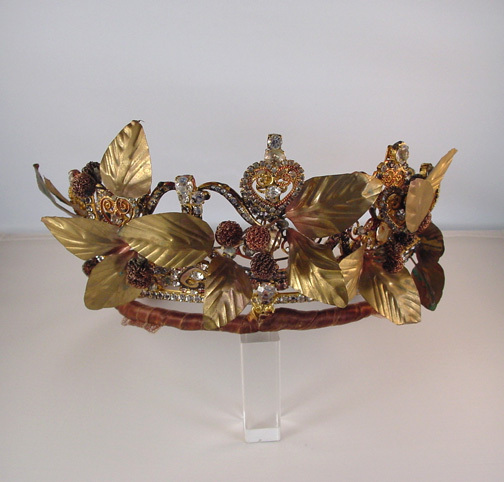 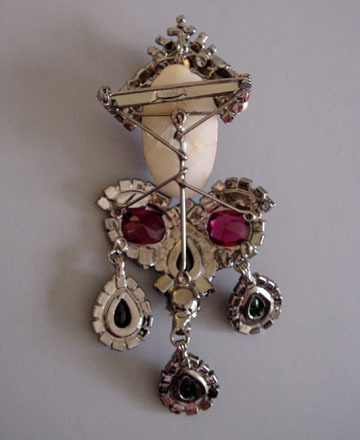 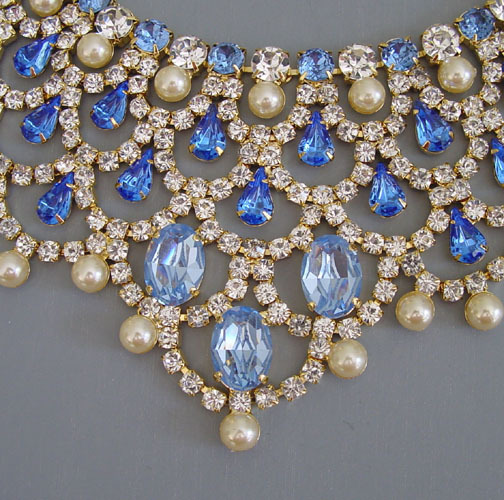 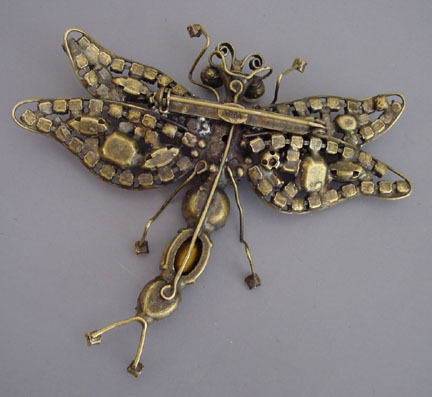 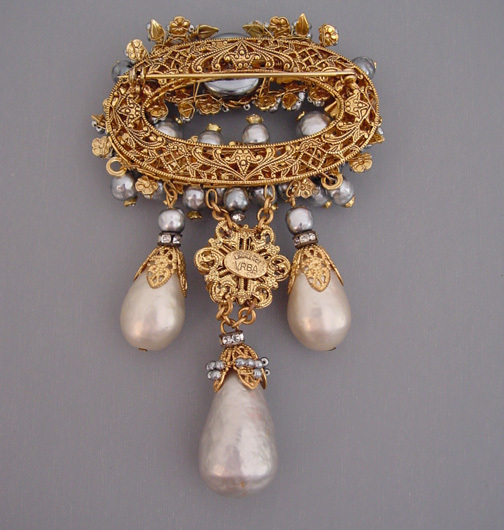 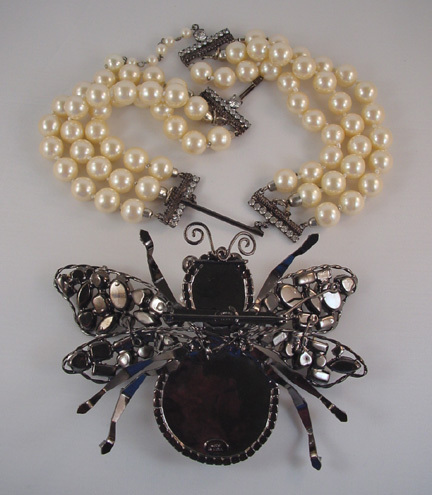 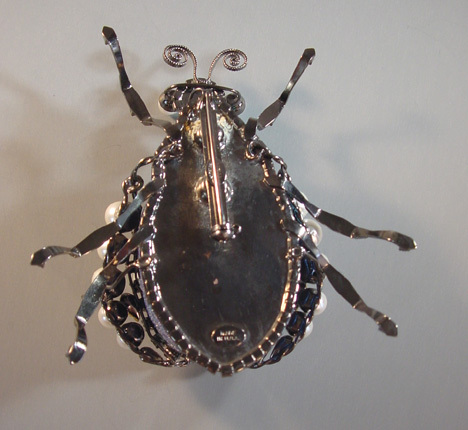 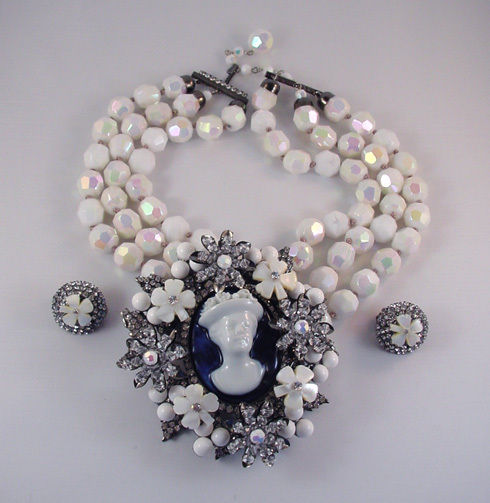 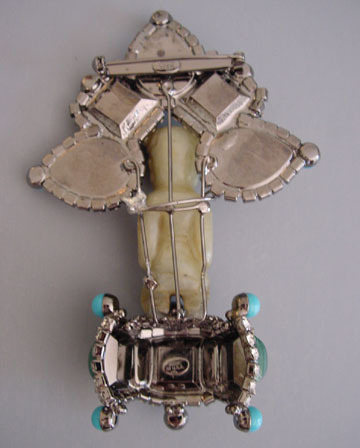 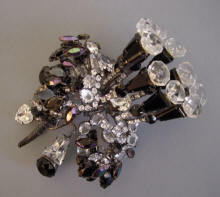 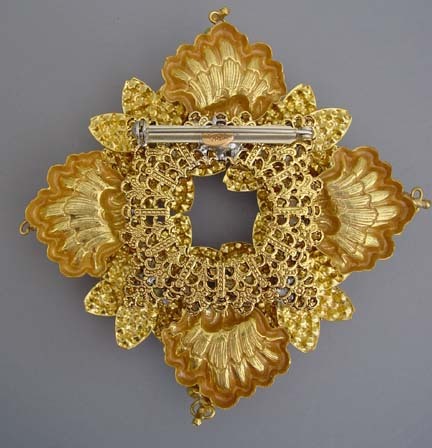 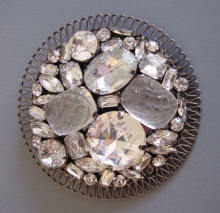 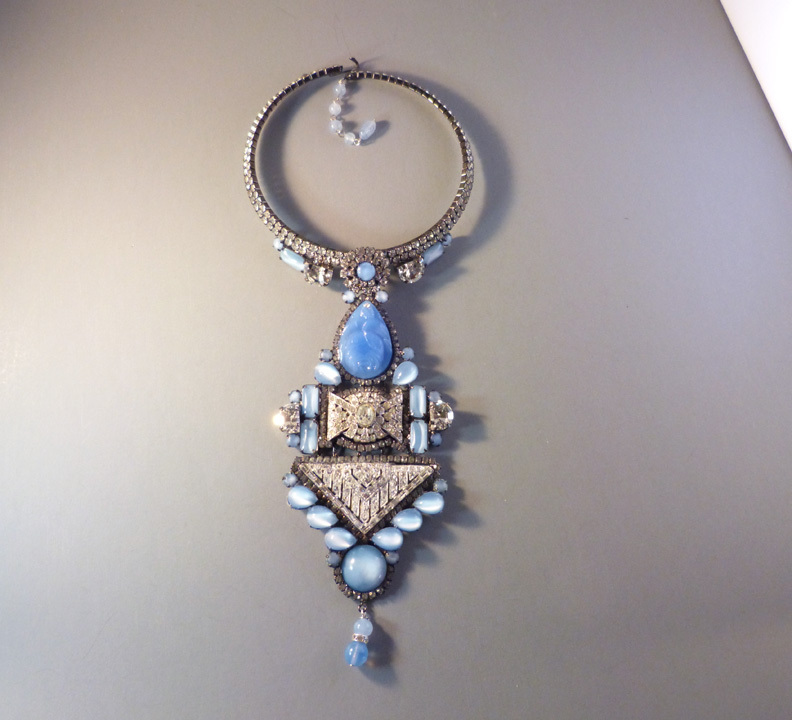 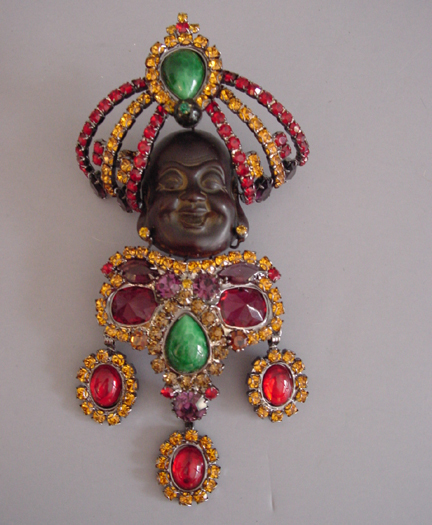 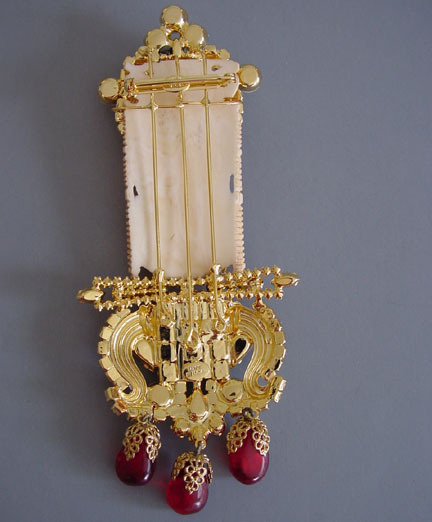 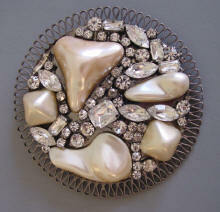 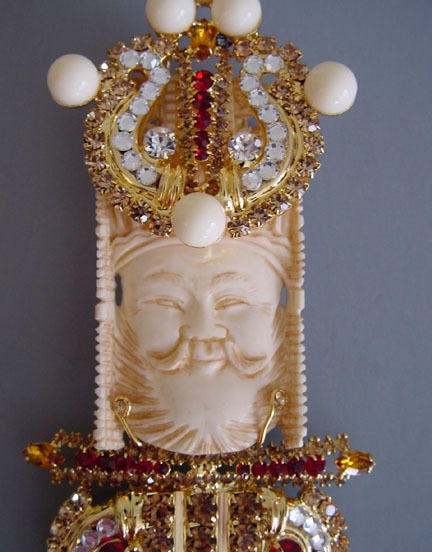 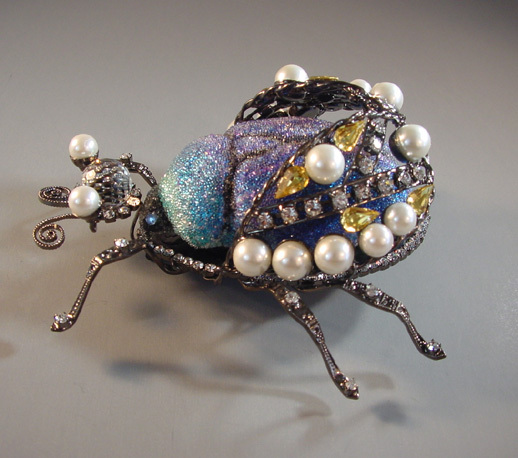 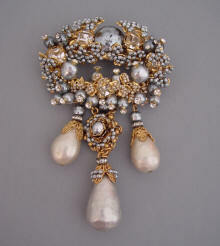 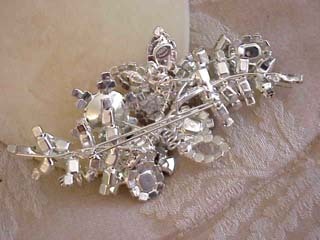 This particular piece is really too large to wear, but it is a jeweled sculpture. 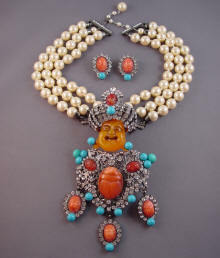 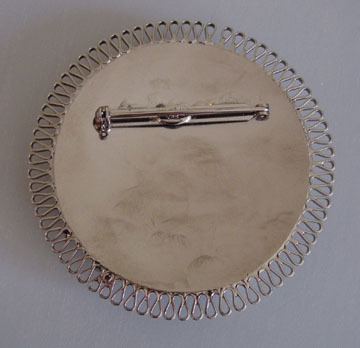 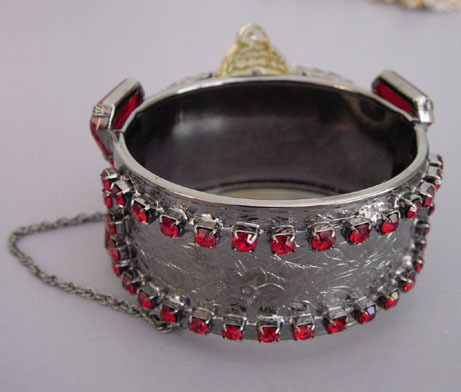 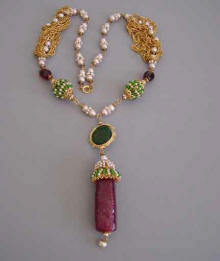 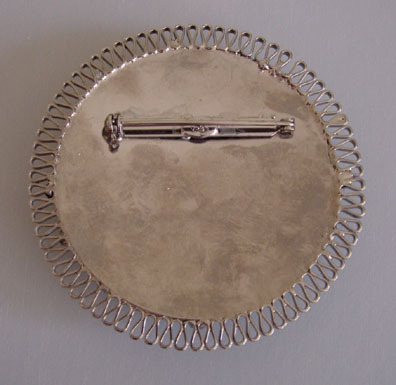 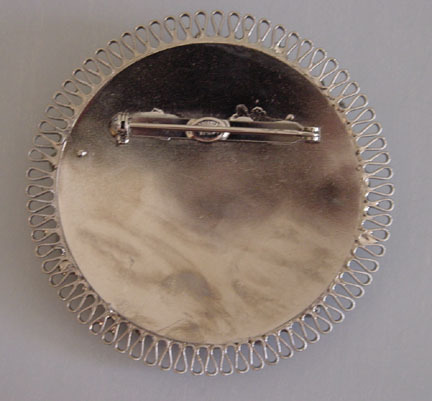 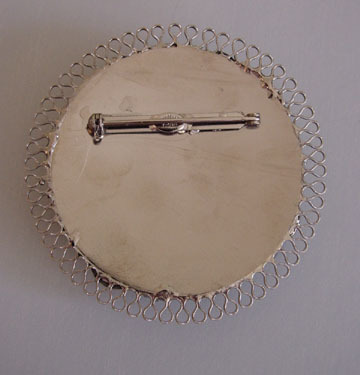 Each and every piece is hand made, so it is not always easy to get his jewelry. 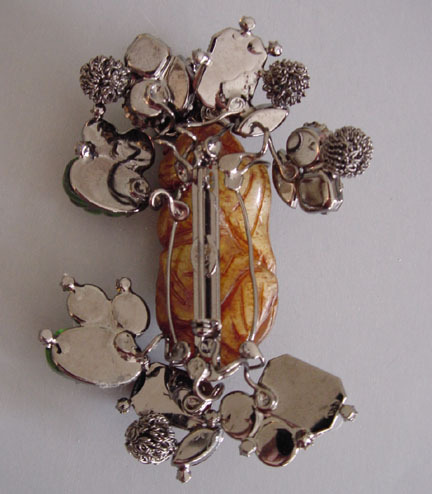 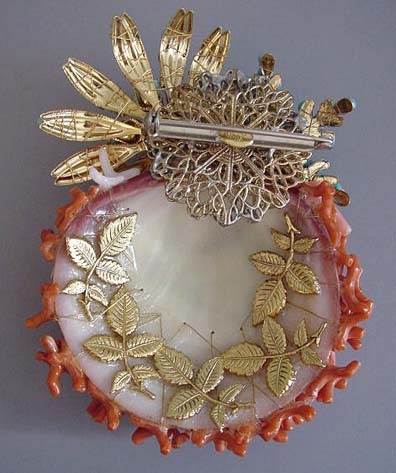 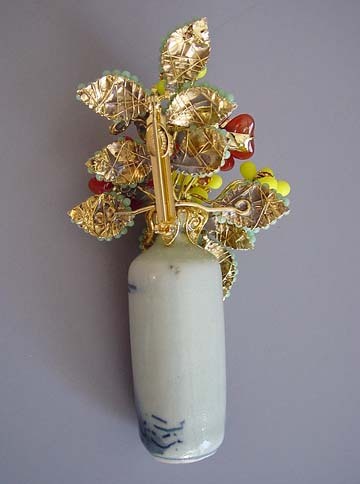 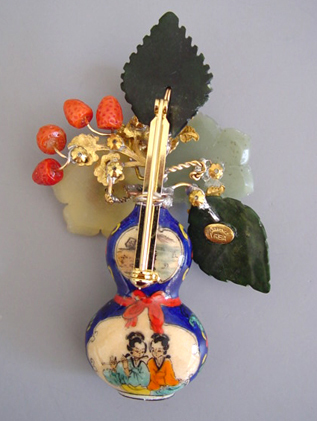 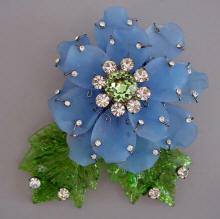 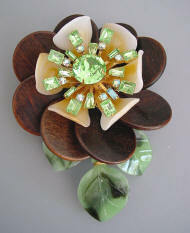 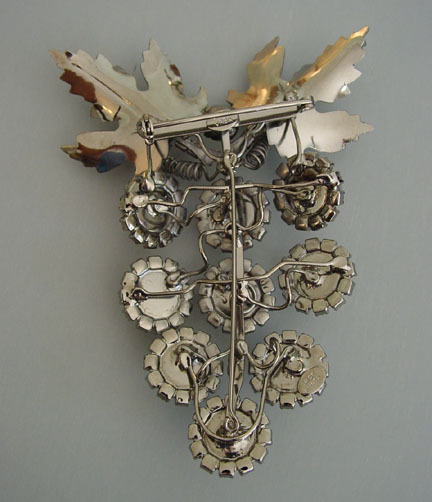 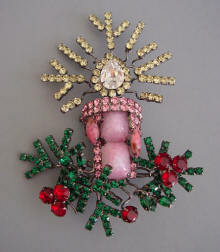 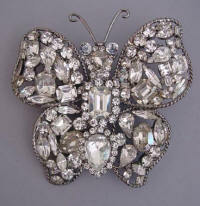 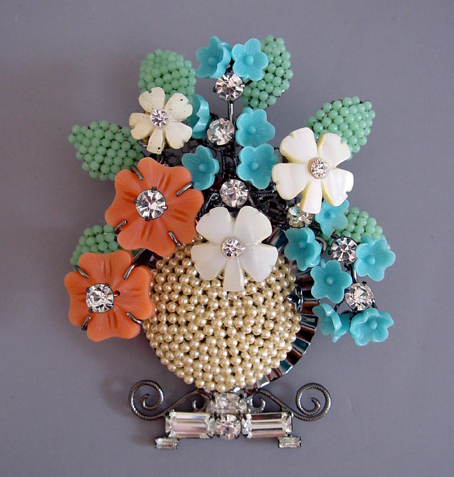 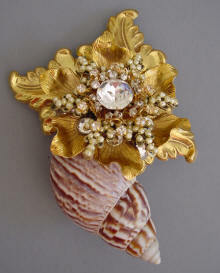 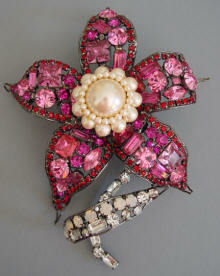 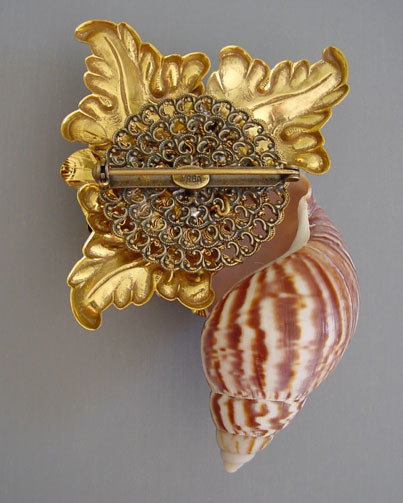 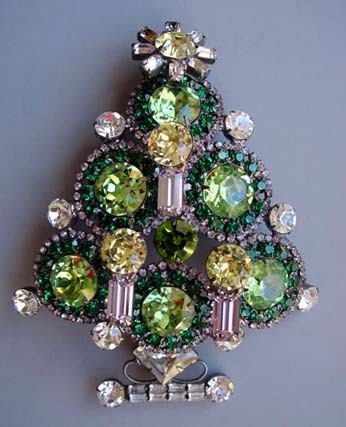 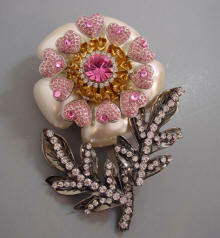 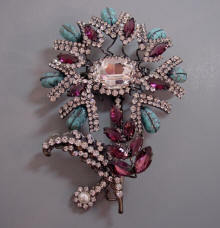 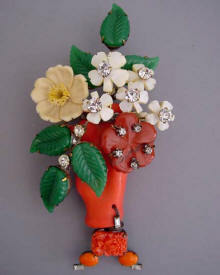 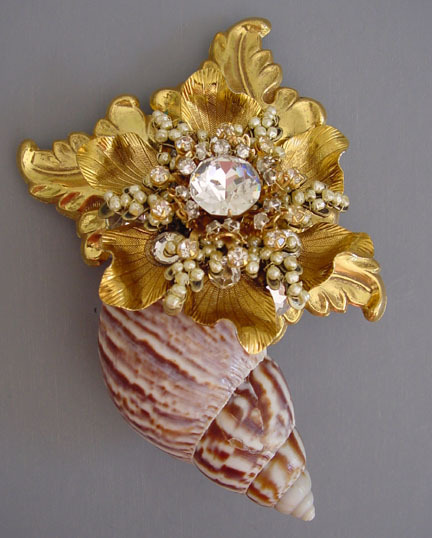 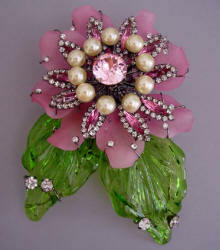 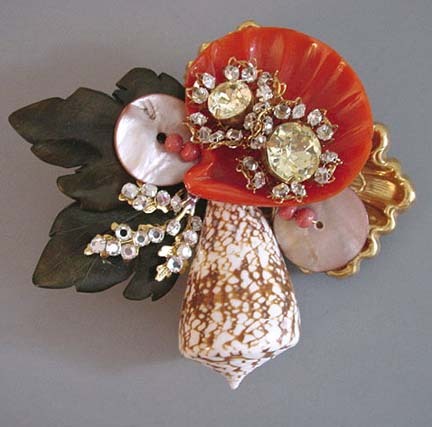 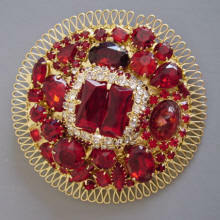 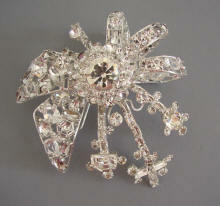 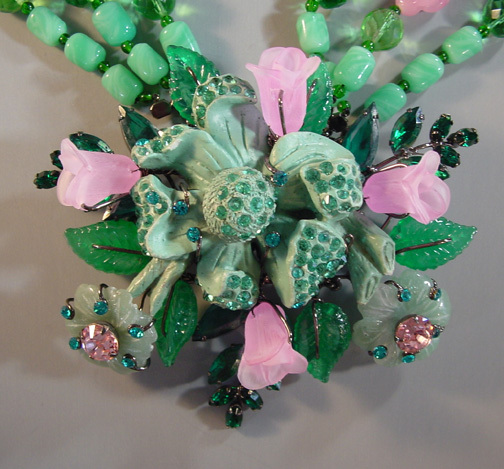 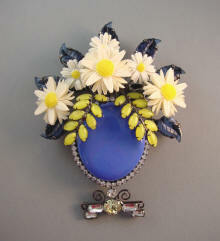 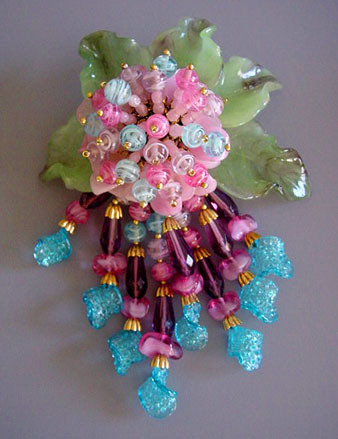 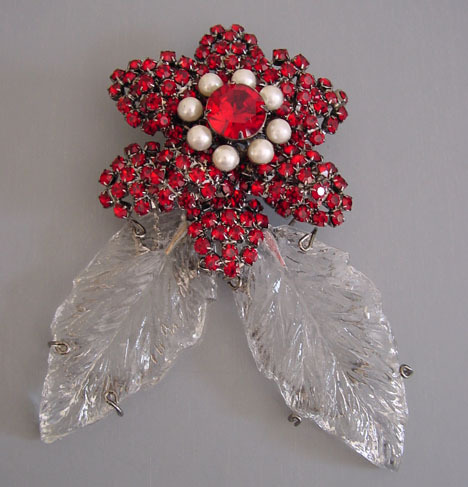 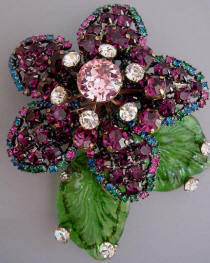 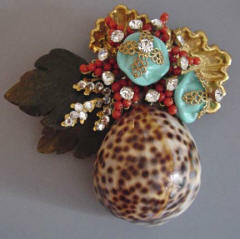 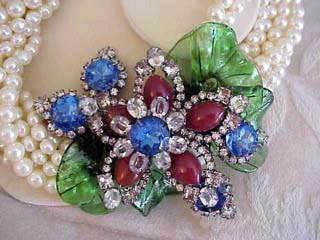 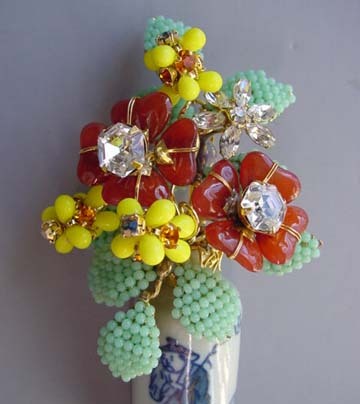 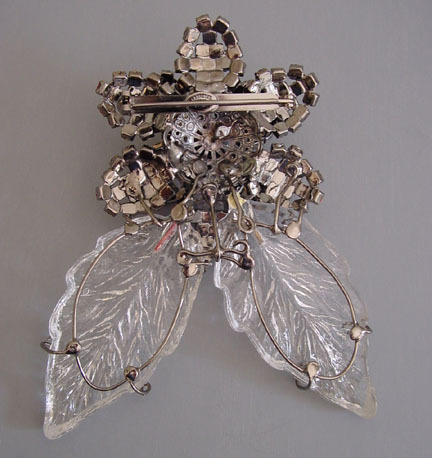 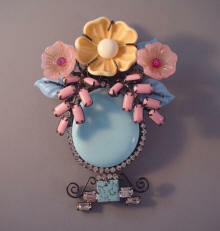 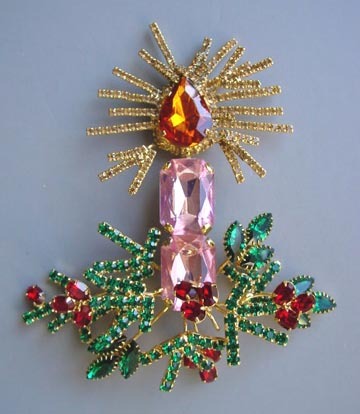 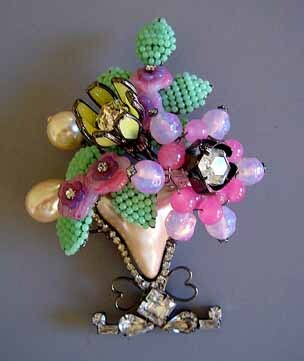 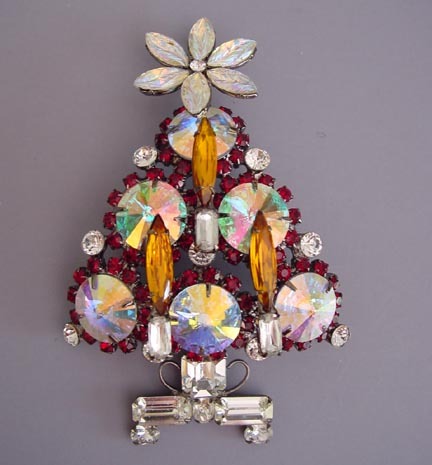 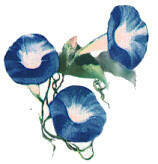 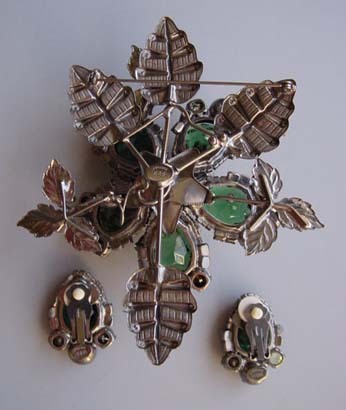 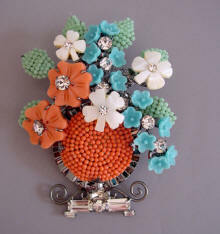 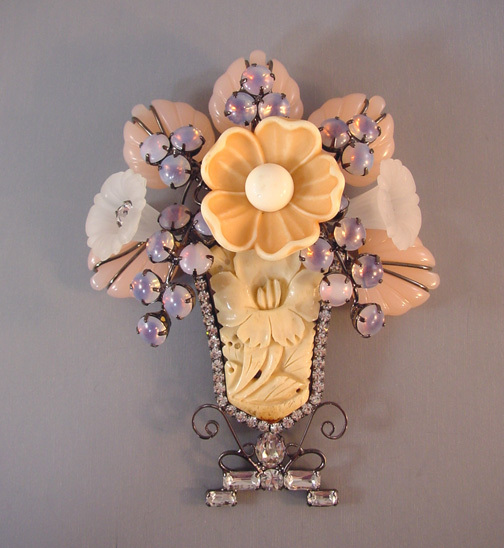 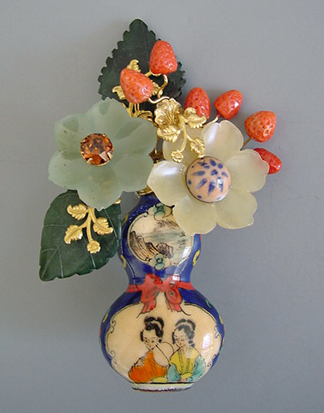 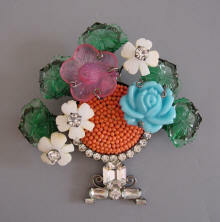 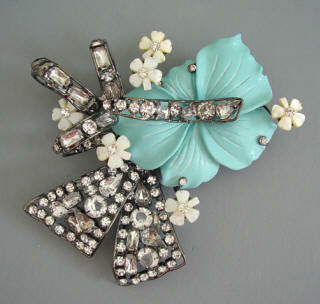 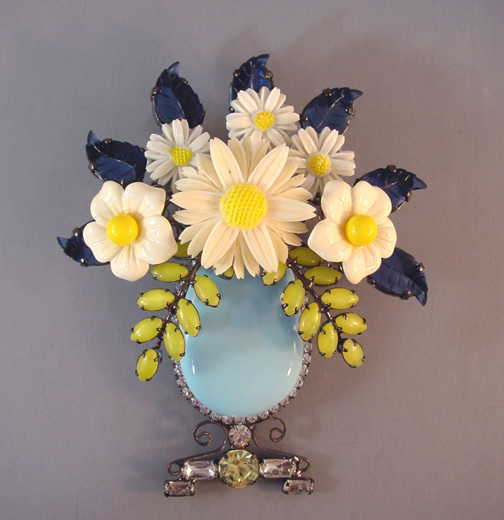 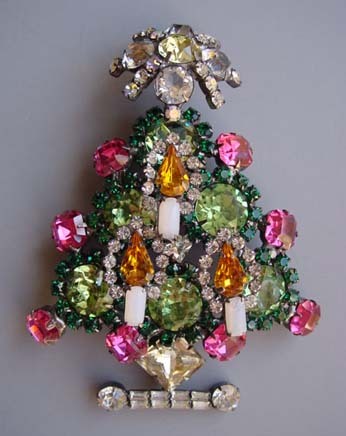 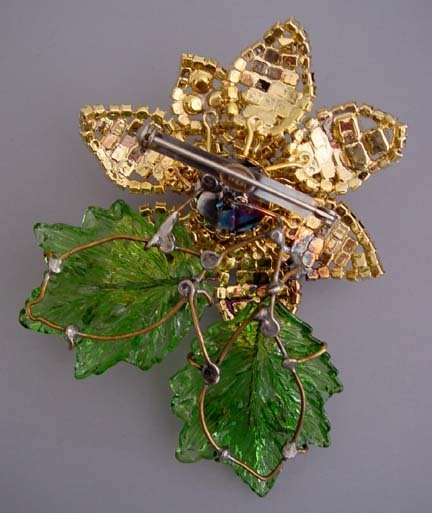 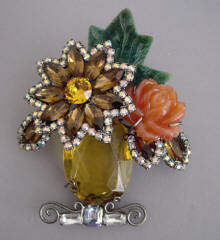 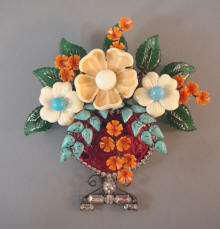 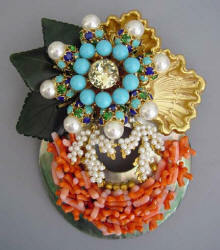 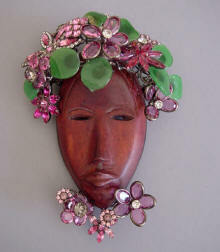 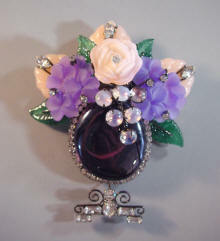 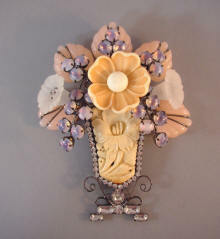 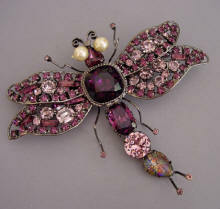 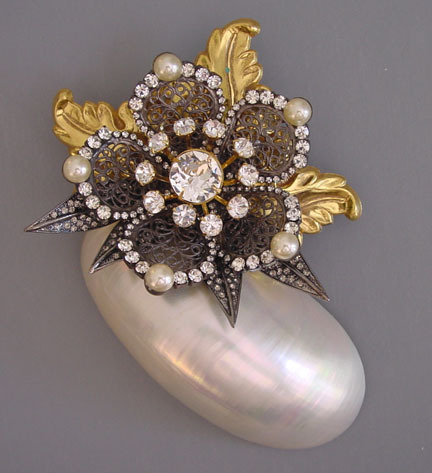 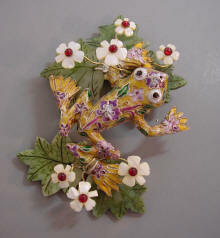 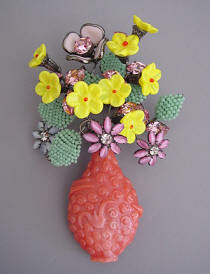 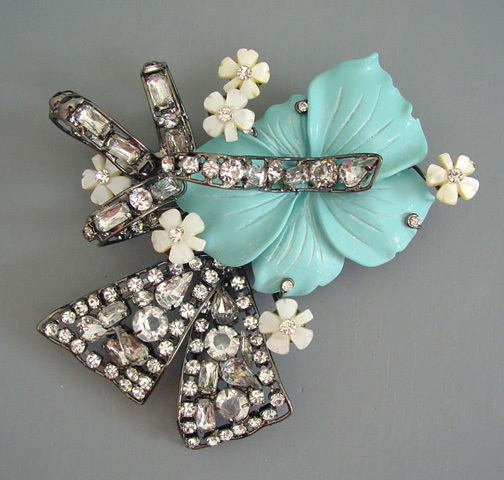 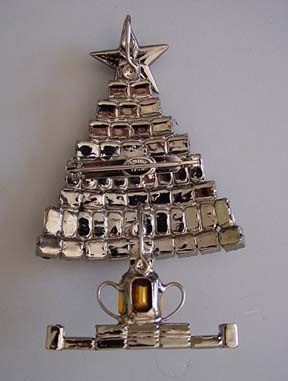 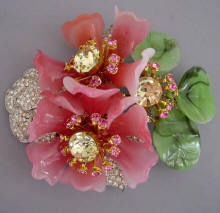 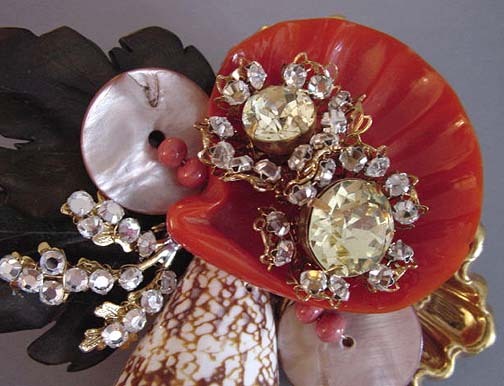 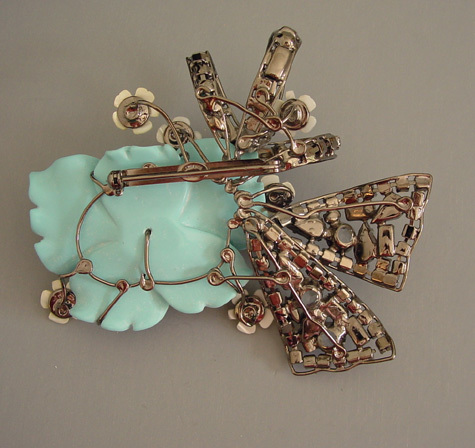 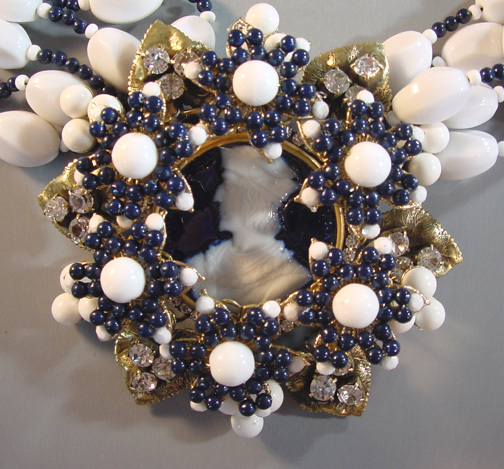 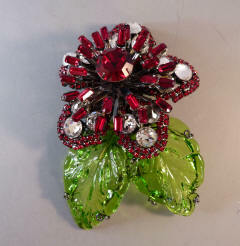 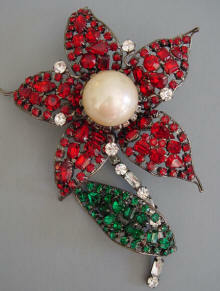 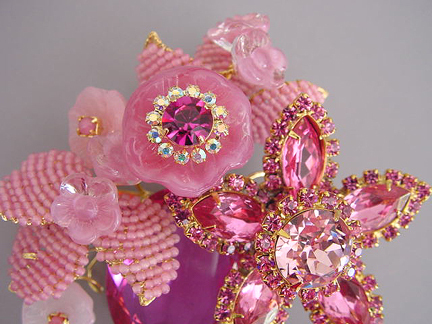 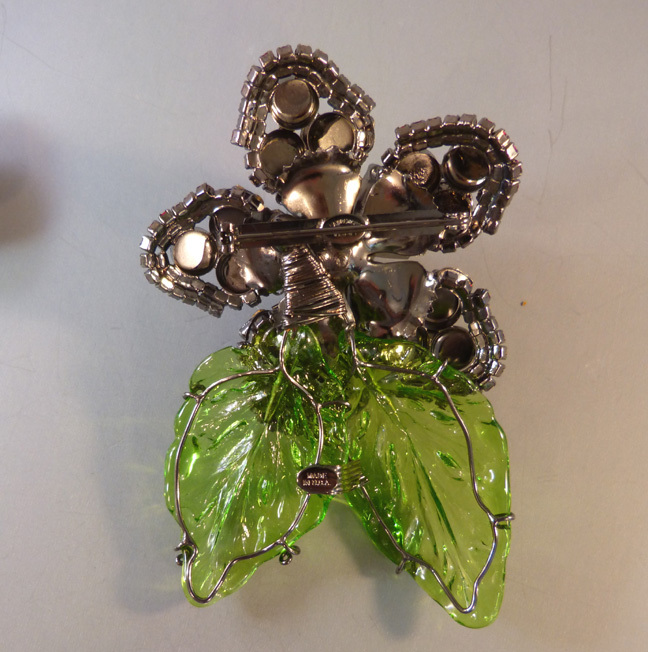 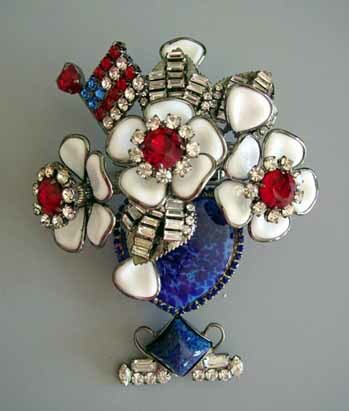 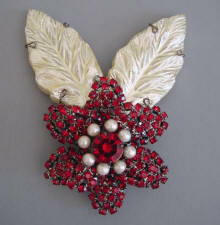 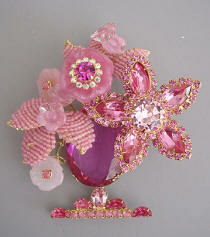 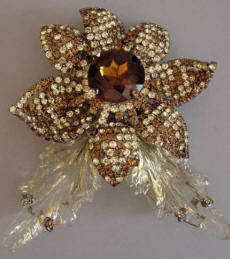 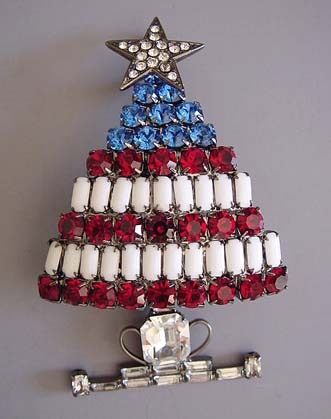 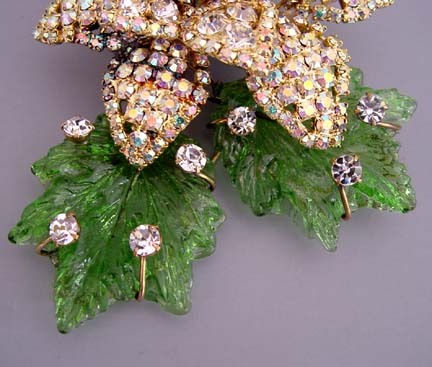 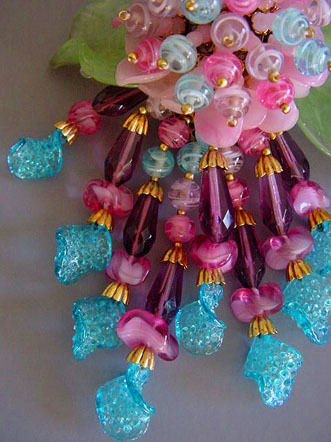 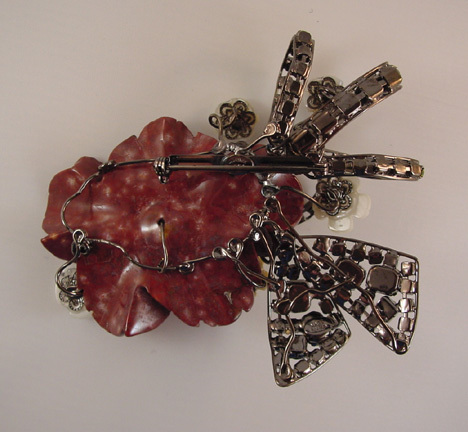 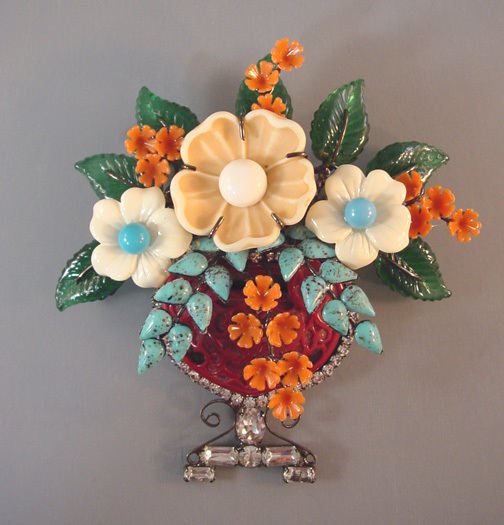 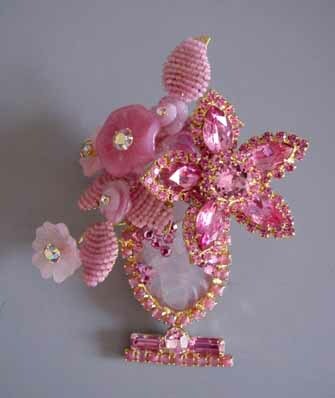 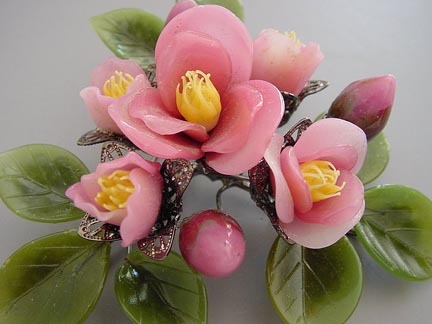 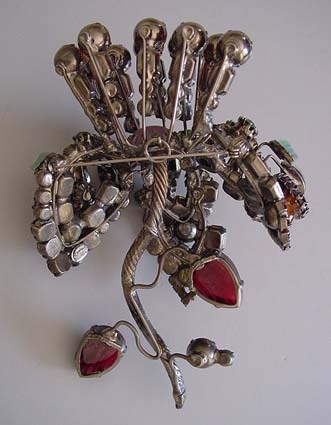 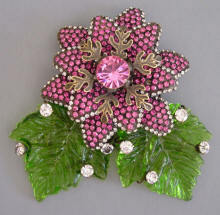 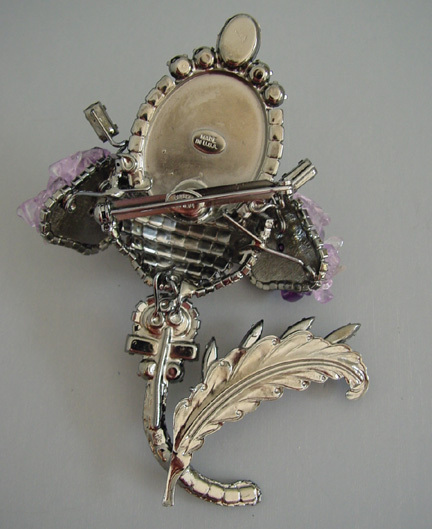 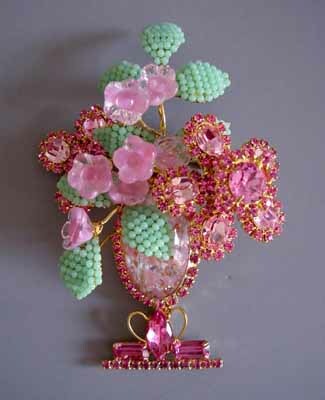 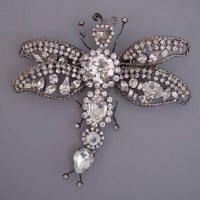 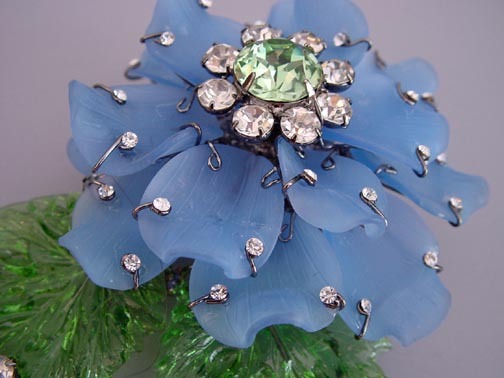 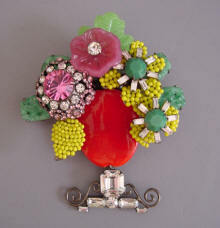 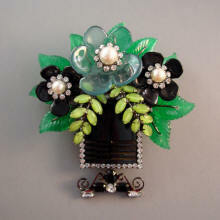 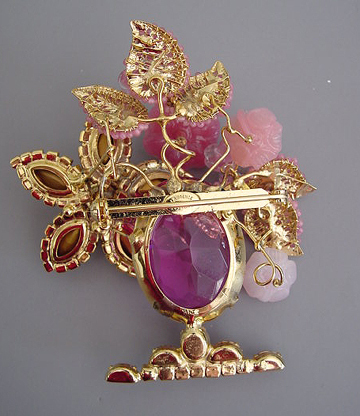 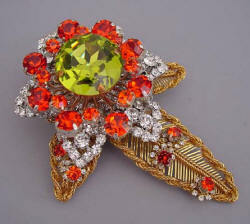 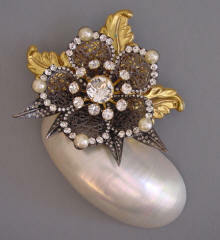 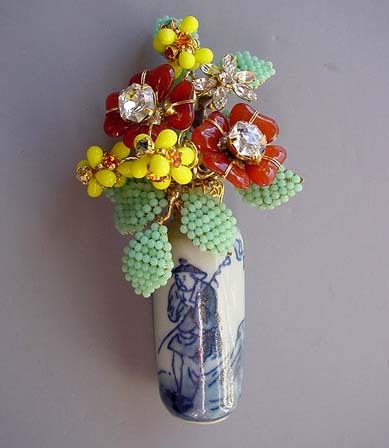 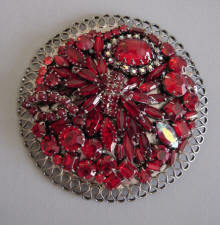 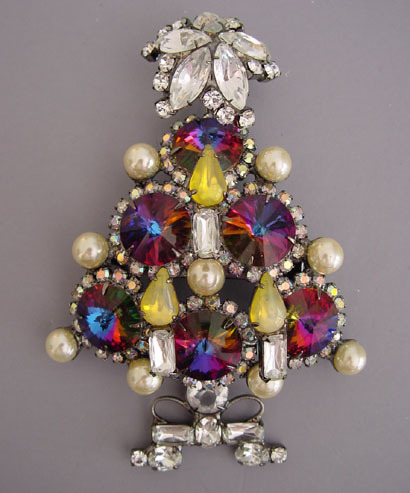 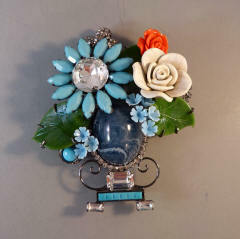 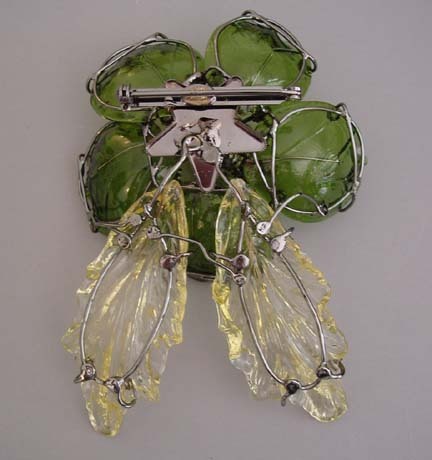 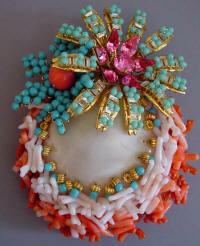 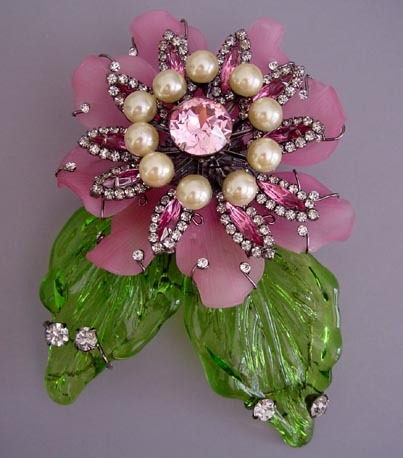 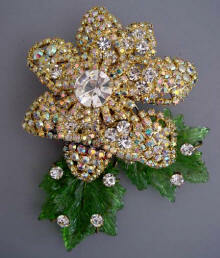 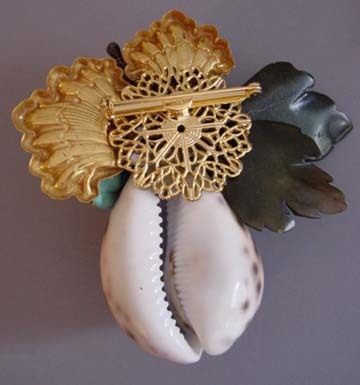 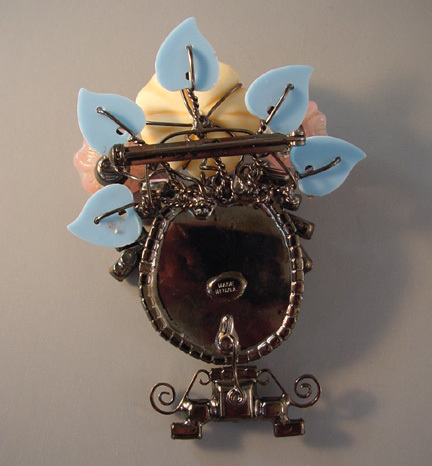 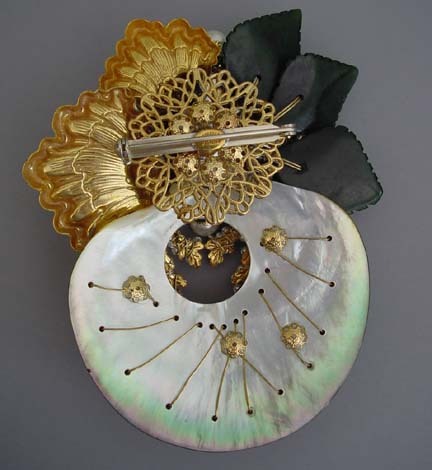 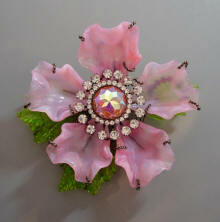 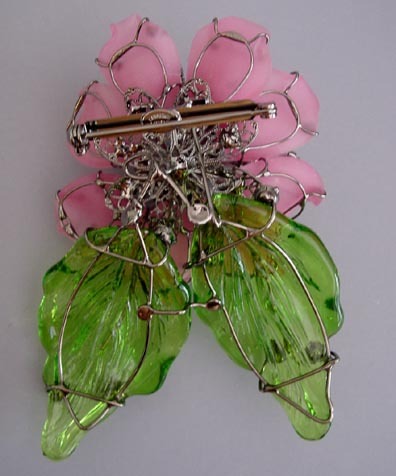 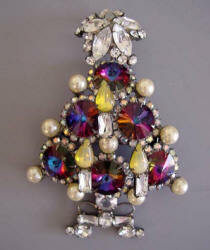 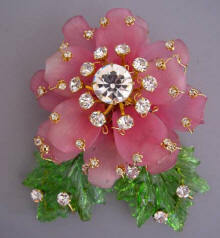 His glass petal bouquets, vase and basket brooches and Christmas tree brooches are favorites. 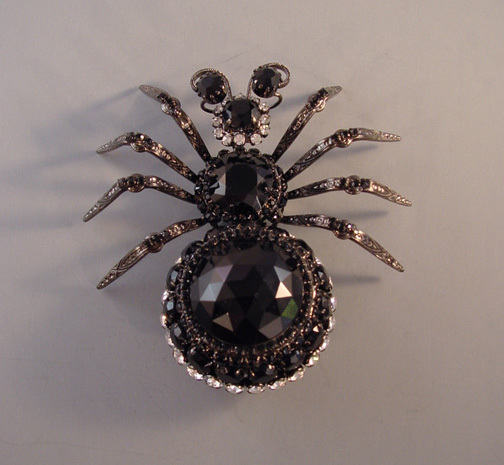 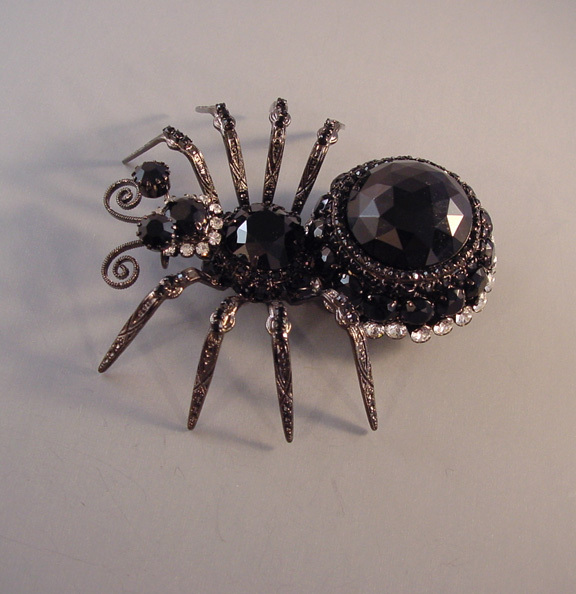 VRBA Halloween black spider brooch with black and clear rhinestones set in gun metal gray colored metal, 4" by 4". 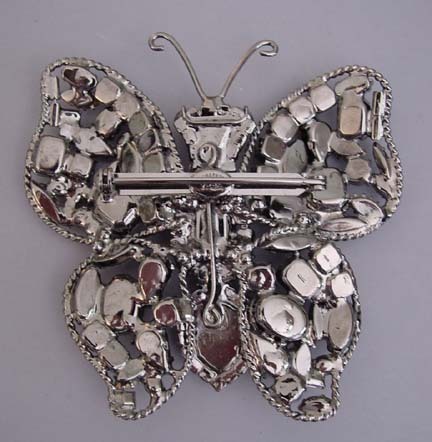 After a stint in the Army, Larry moved from his home in Lincoln, Nebraska, to New York City in June 1969. 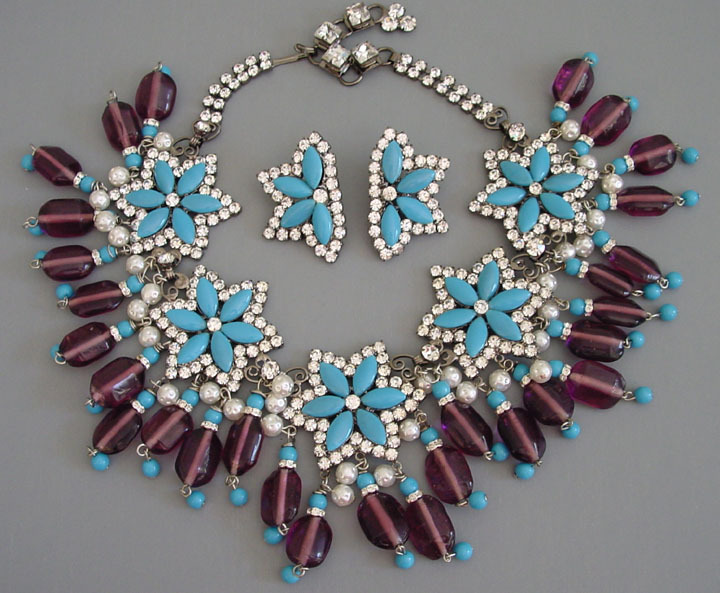 Looking for work and being a fan of Miriam Haskell jewelry, Vrba repeatedly went to the Haskell offices asking for a job. 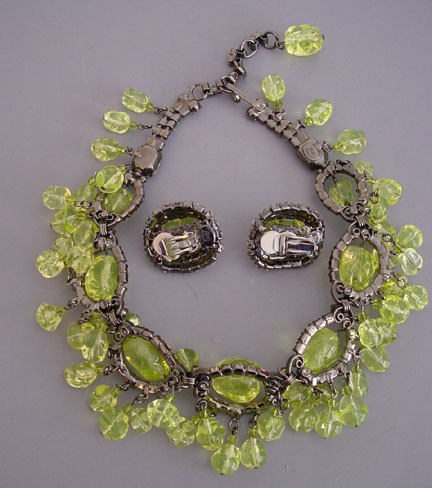 By pure luck he ran into the then-owner of Haskell Jewelry, Sandy Moss, and Moss hired Vrba as a counter. 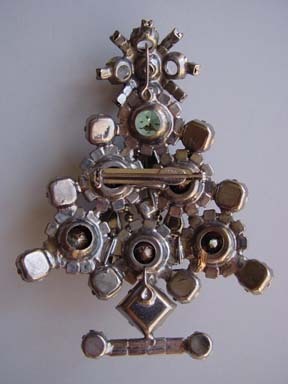 A counter assembles the pieces for each piece of jewelry, preparing it for the jewelry makers. 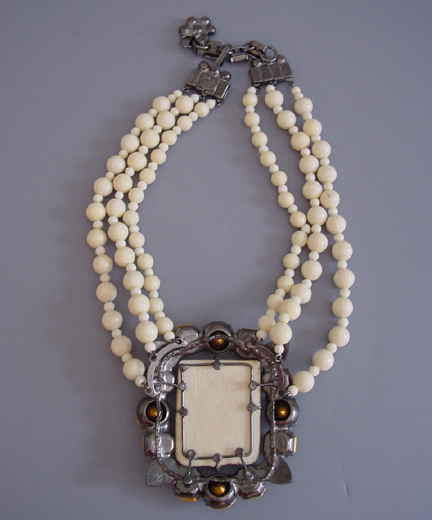 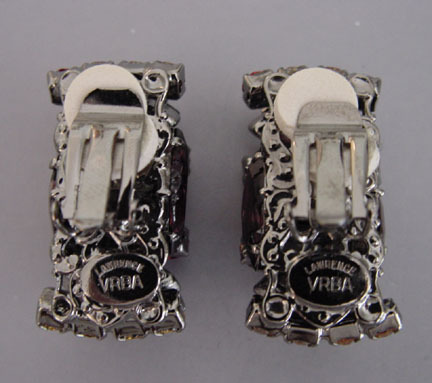 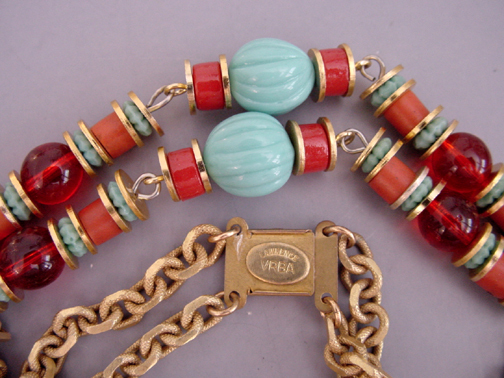 Within six weeks of being hired, Vrba was a designer making jewelry each Friday, a position he held for about 1-1/2 years. 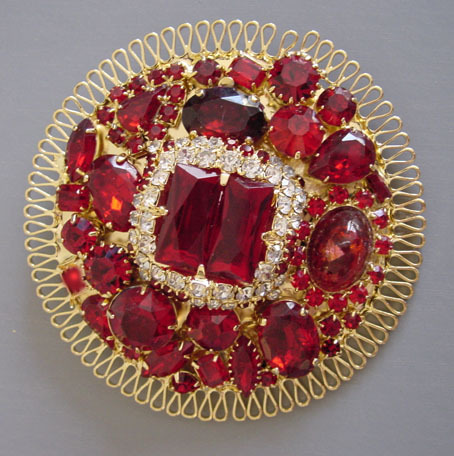 When Bob Clark, the head designer, left to partner with William De Lillo, Larry went with him. 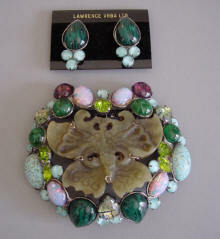 Meanwhile back at Haskell, another head designer left and Larry came back home, becoming head designer from 1973 to 1981. 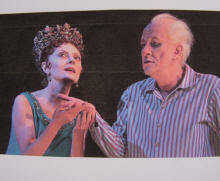 He was young, talented, creative and an asset to every company he ever worked for. 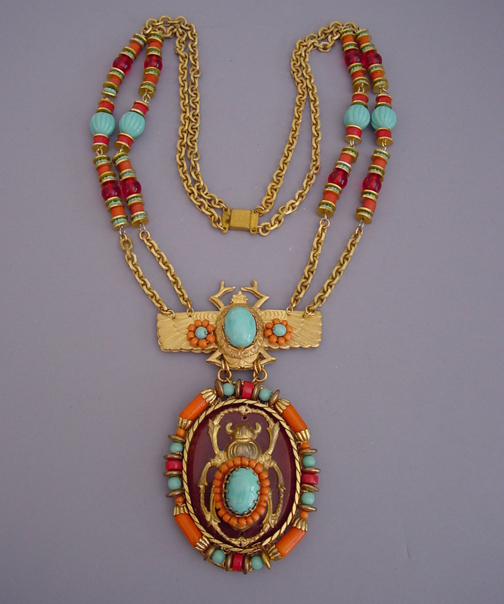 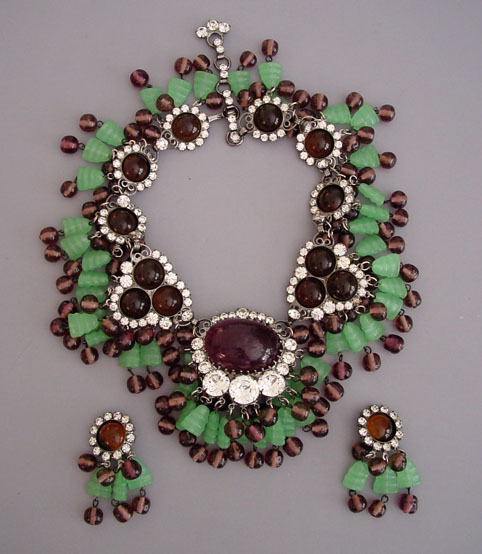 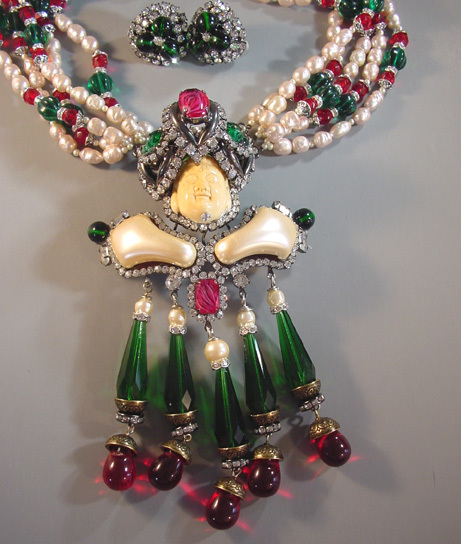 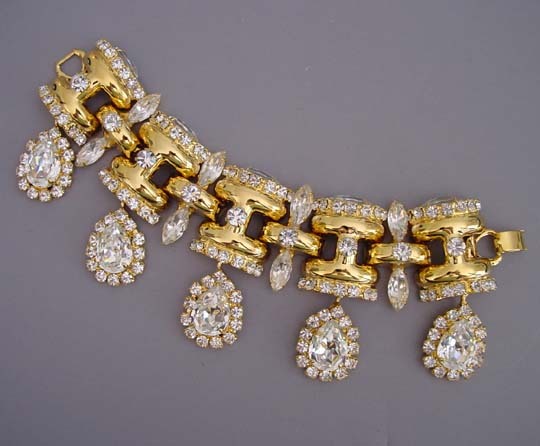 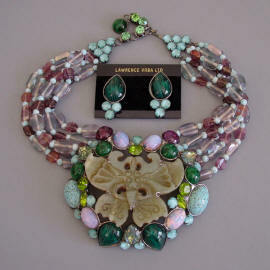 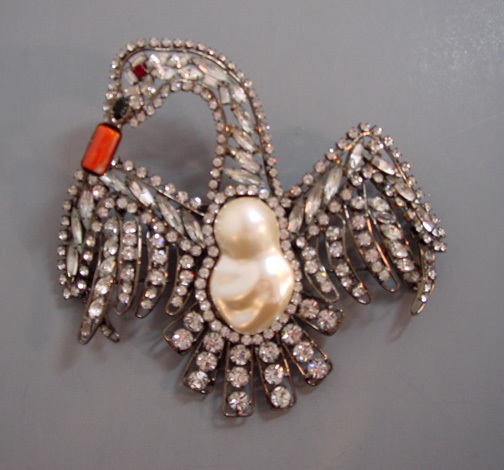 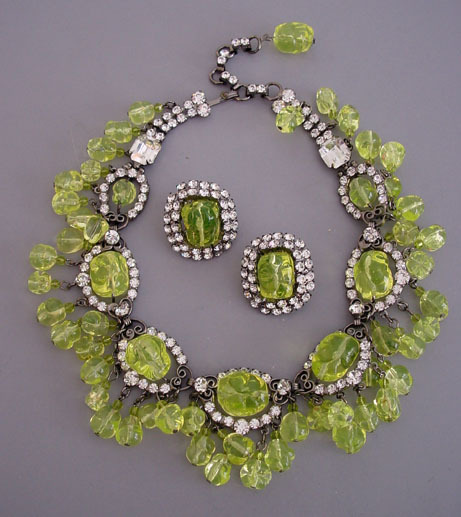 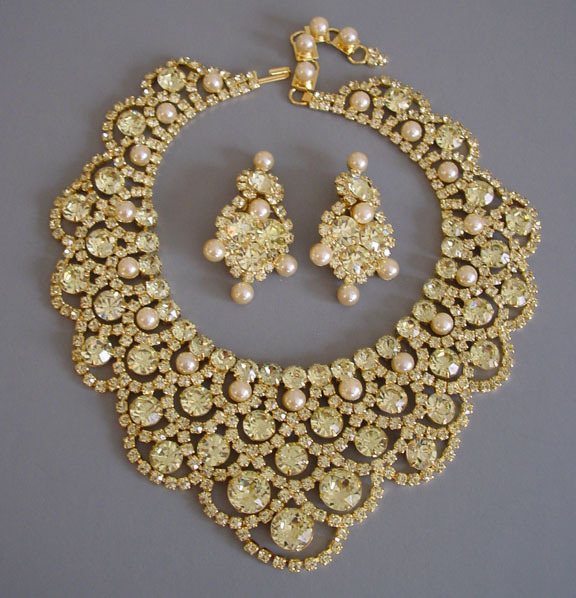 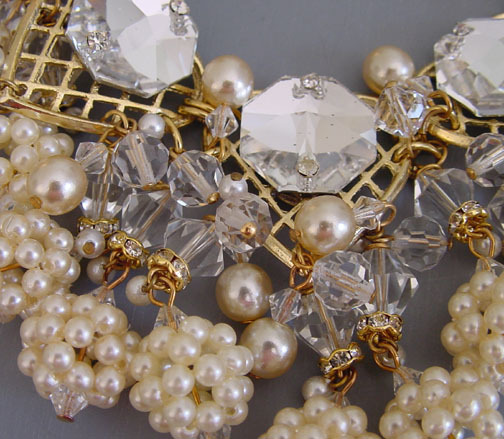 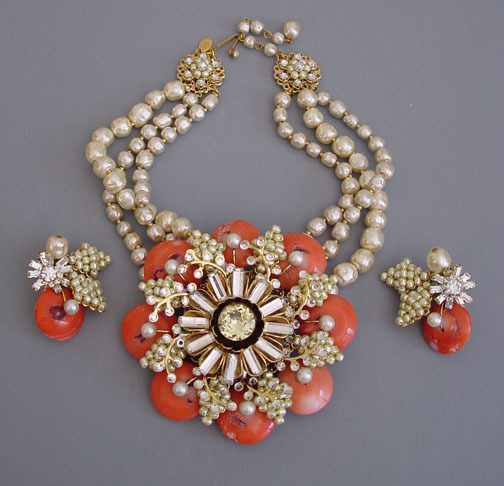 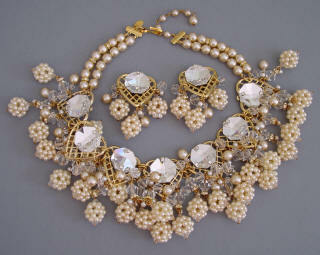 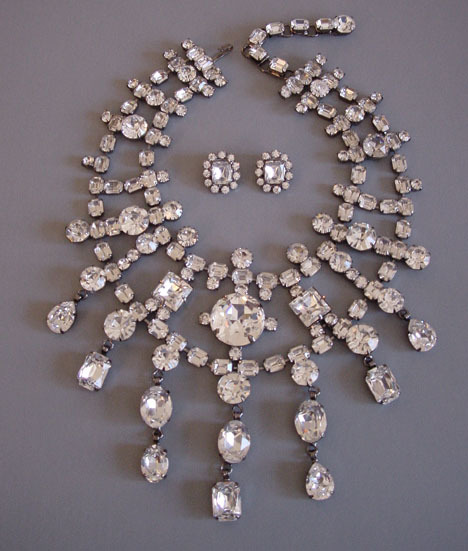 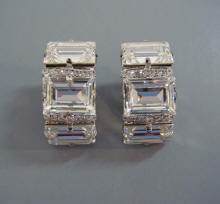 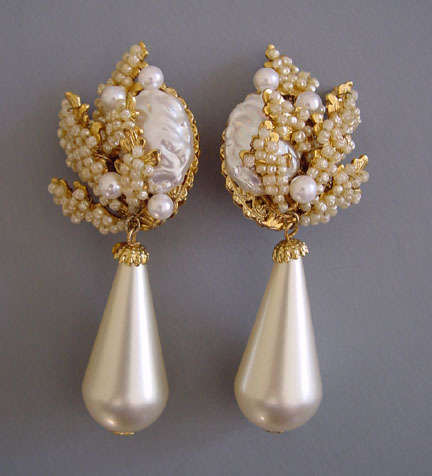 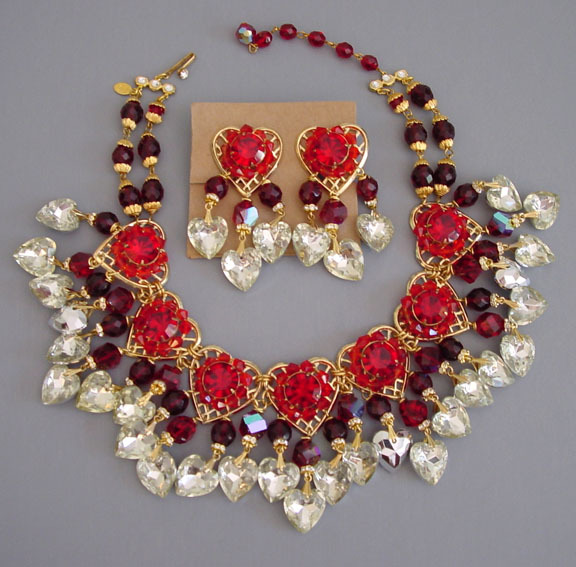 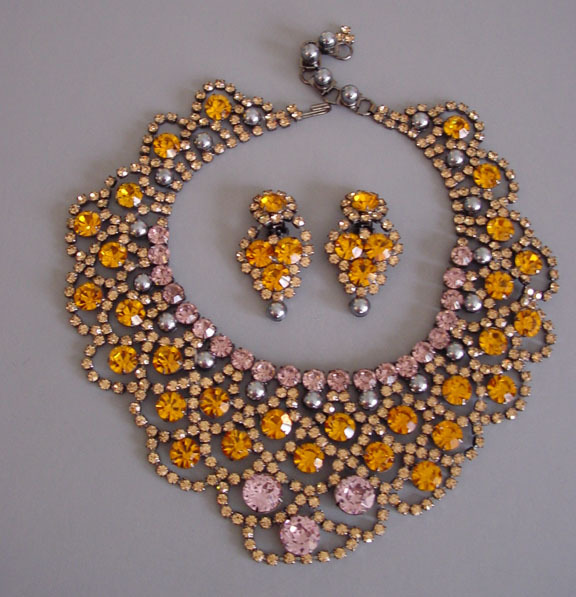 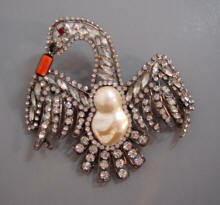 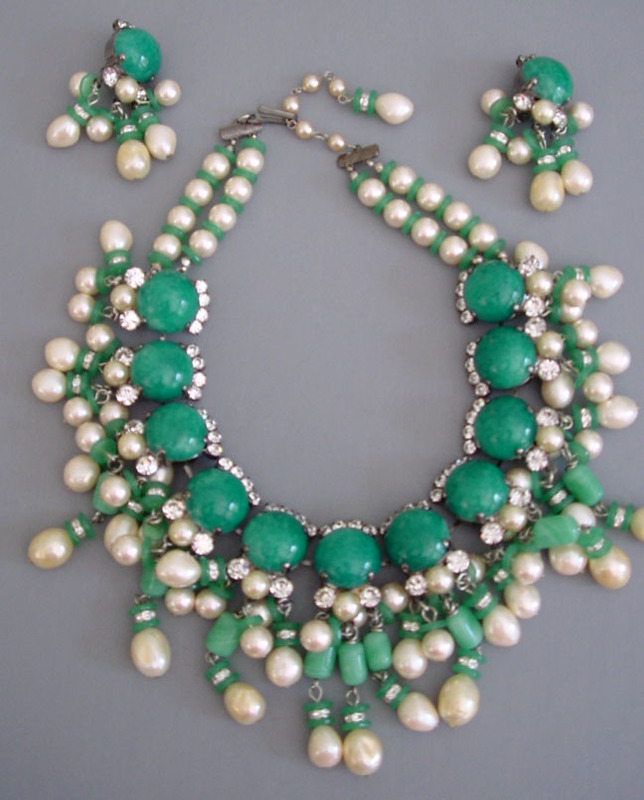 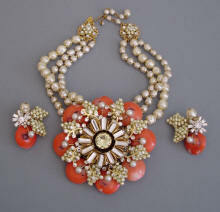 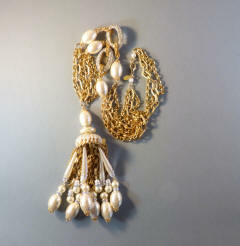 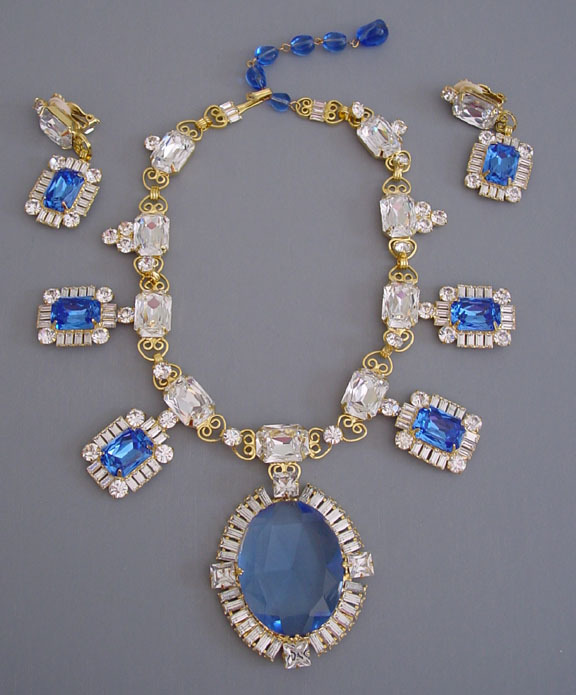 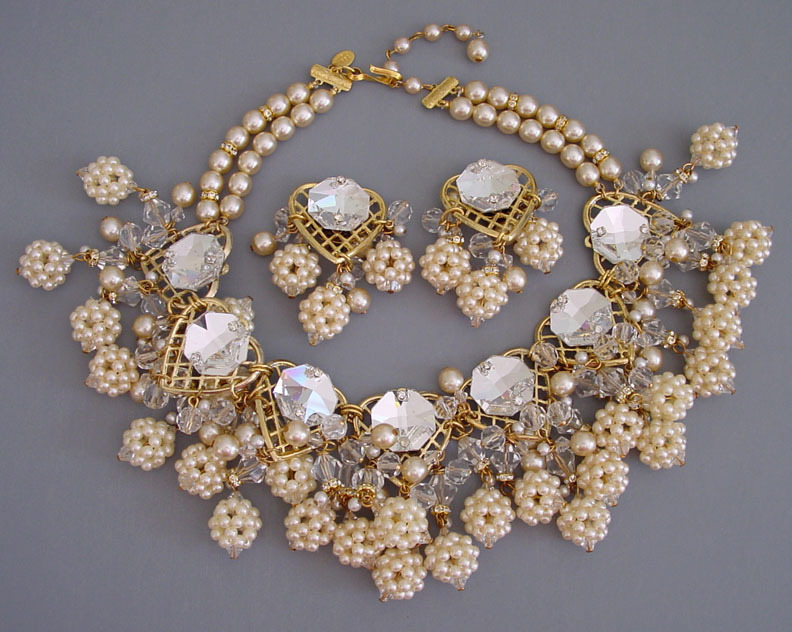 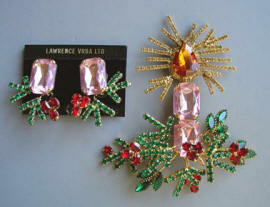 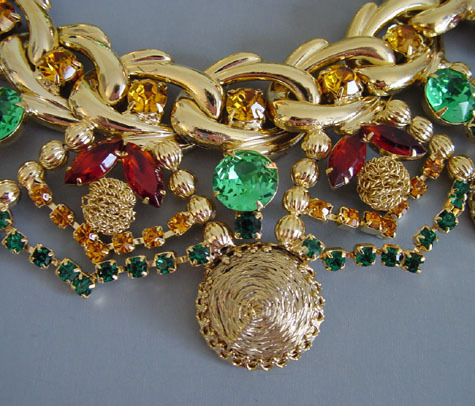 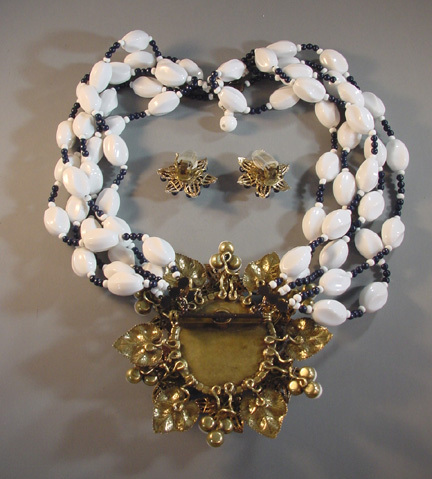 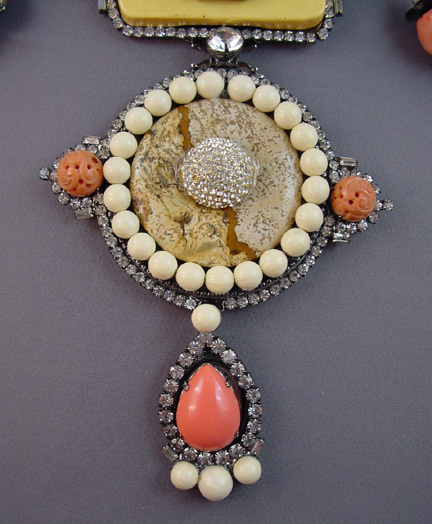 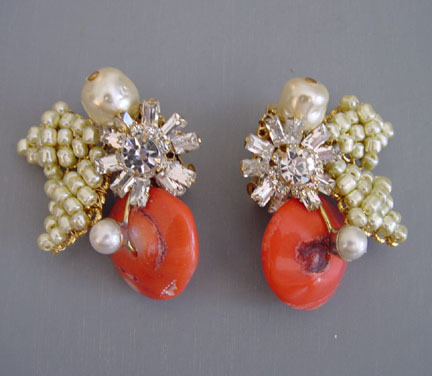 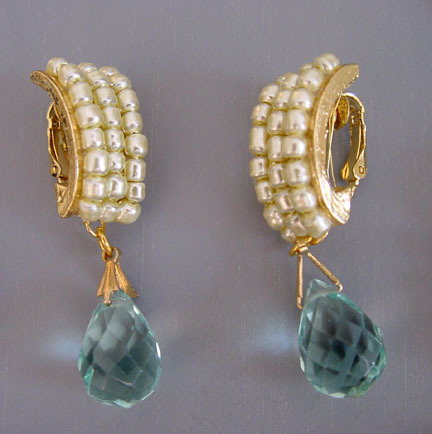 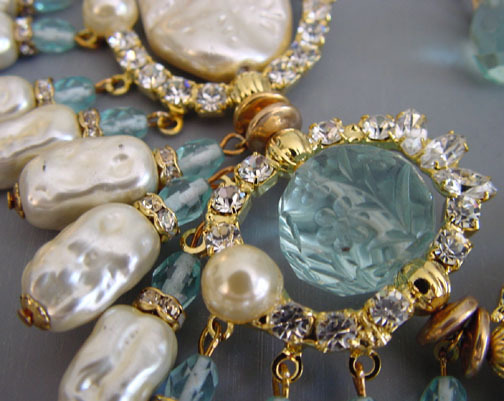 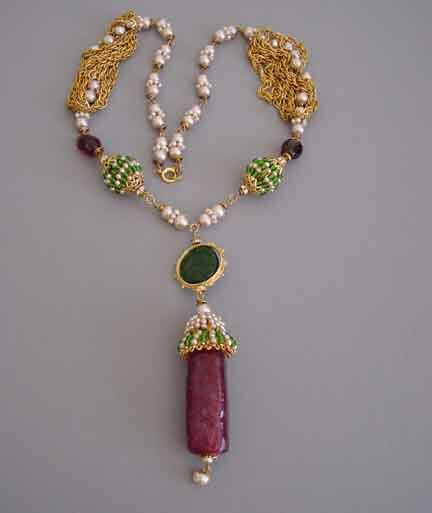 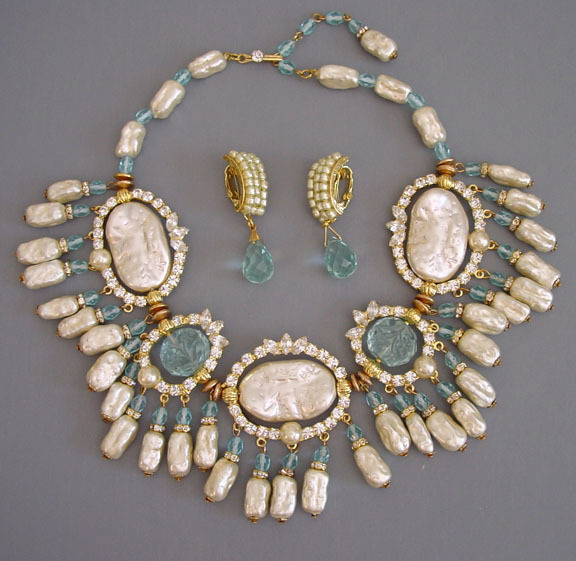 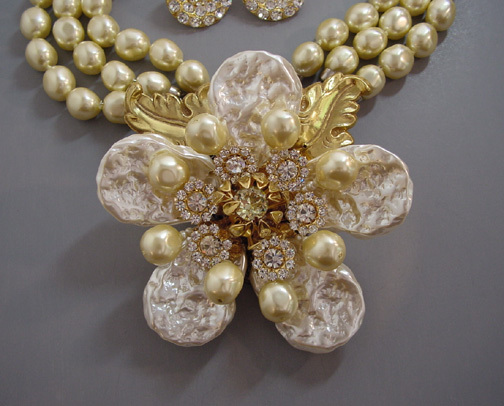 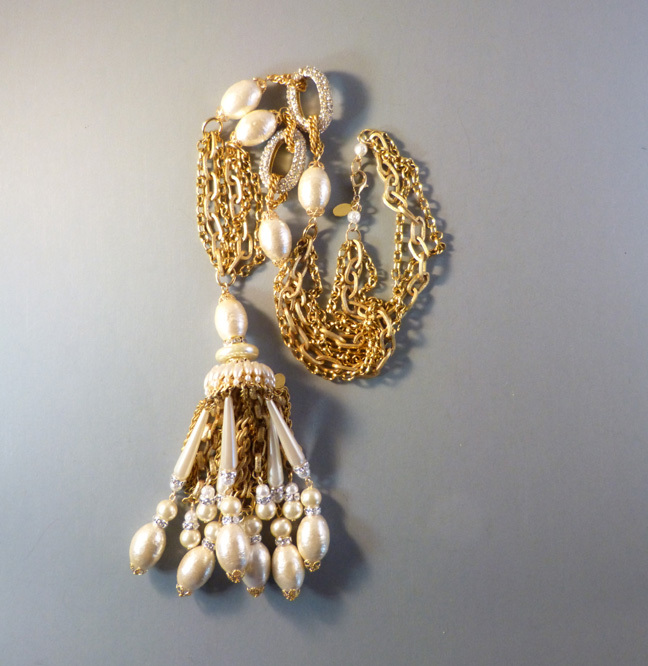 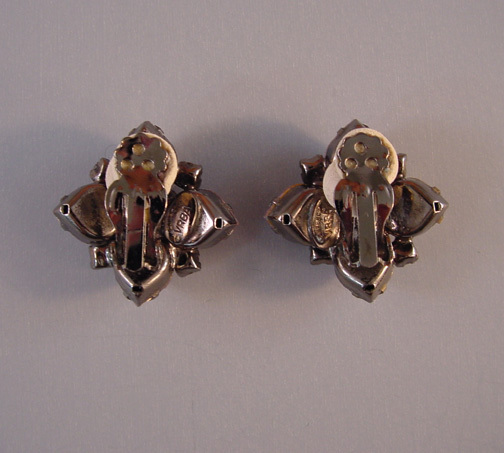 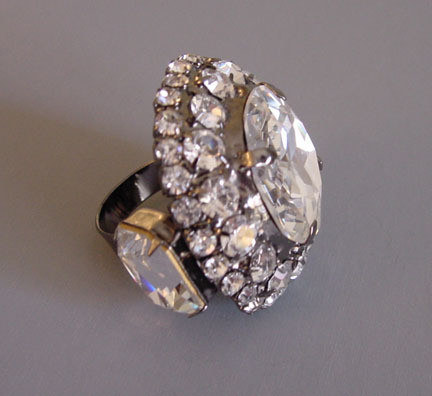 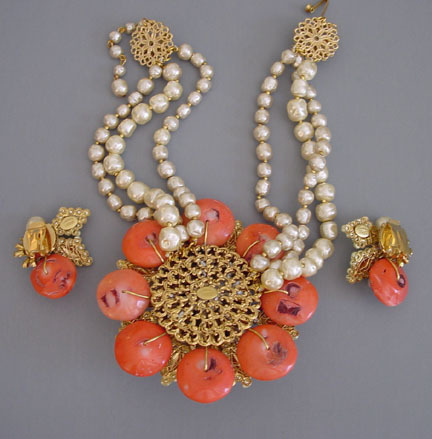 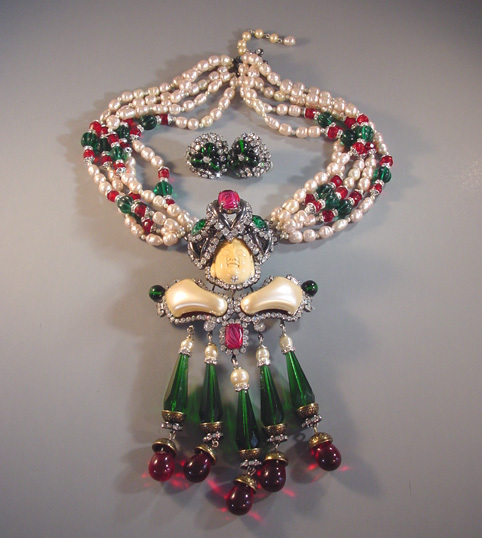 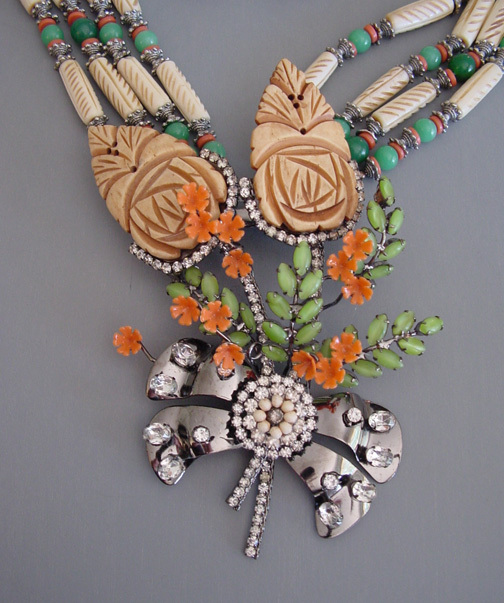 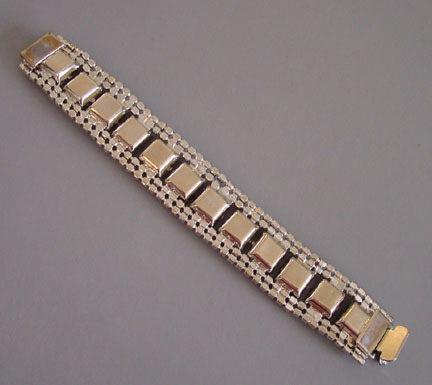 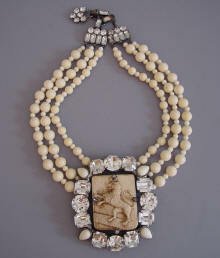 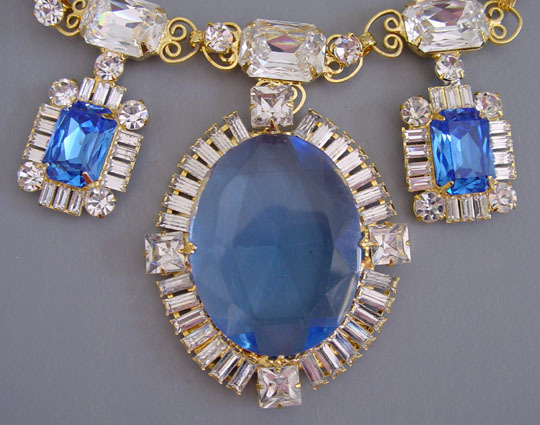 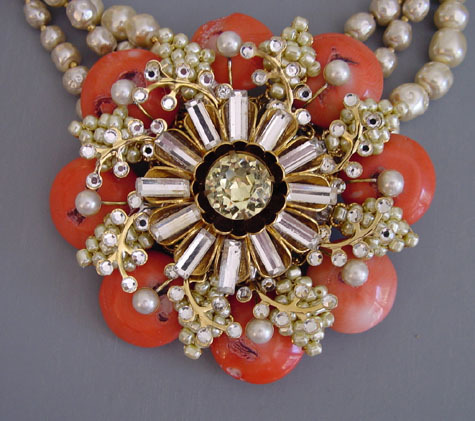 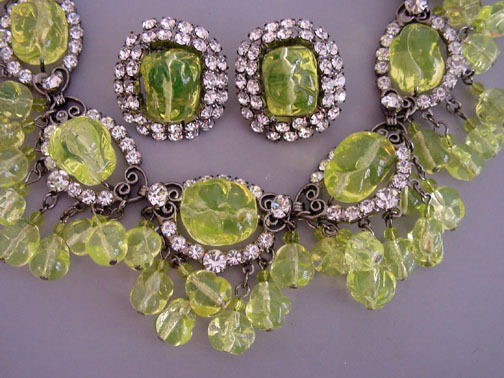 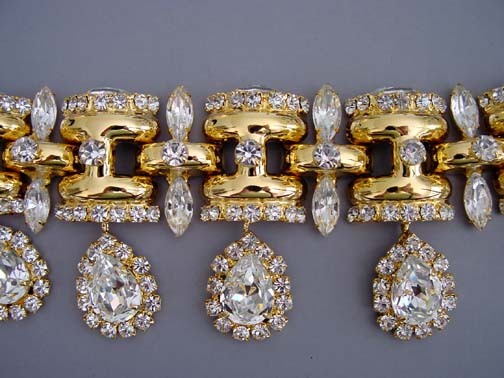 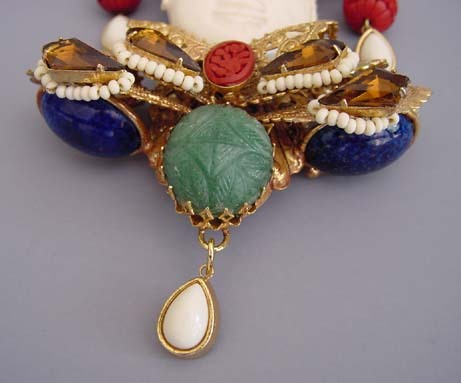 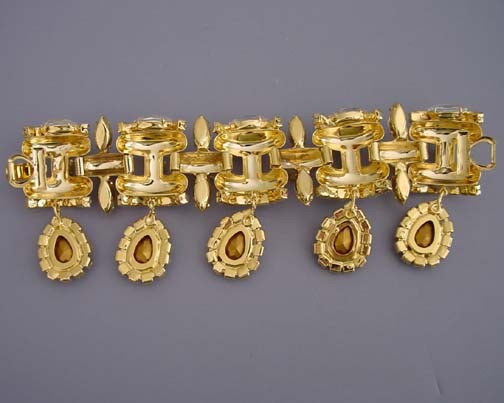 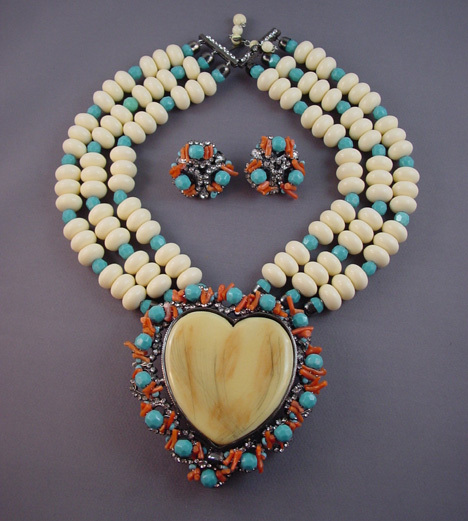 In 1981 Larry Vrba left Miriam Haskell Jewelry, working for Les Bernard Jewelry. Larry Vrba had goods in Dillard's for 3 seasons in the 1980's, too. 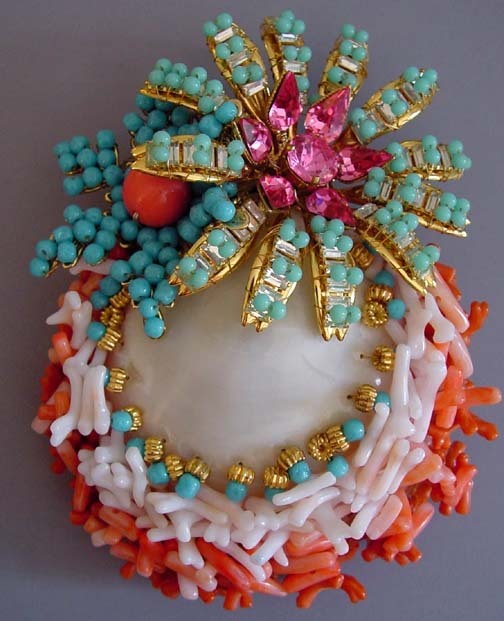 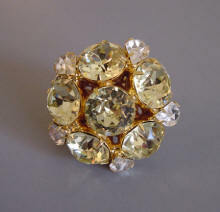 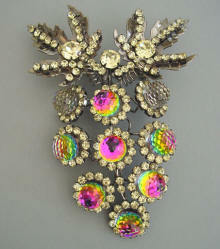 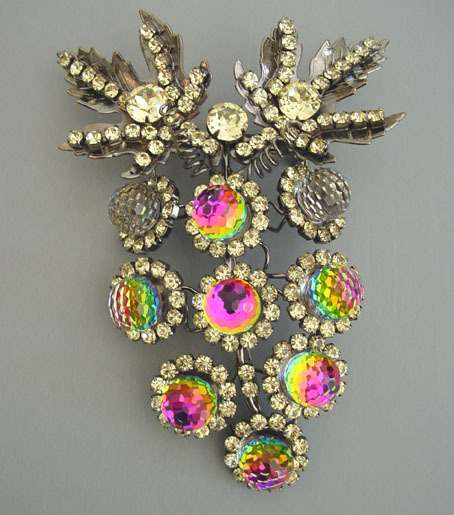 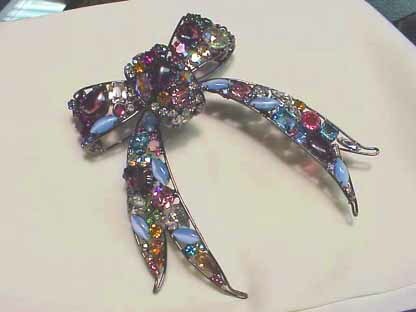 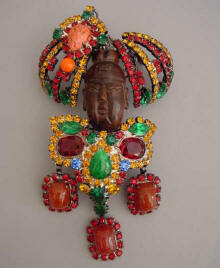 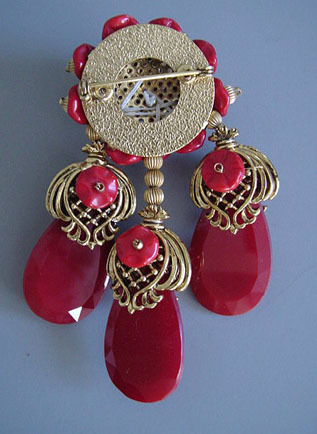 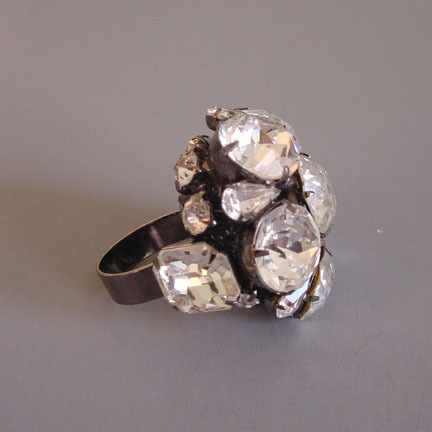 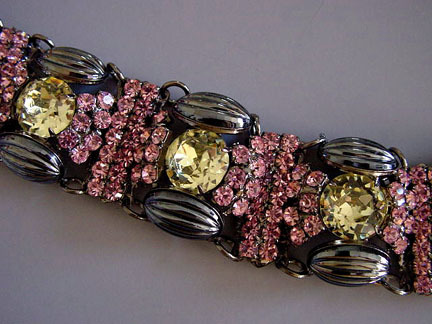 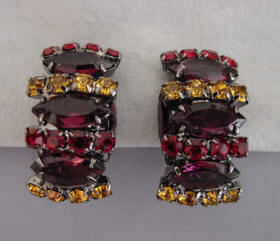 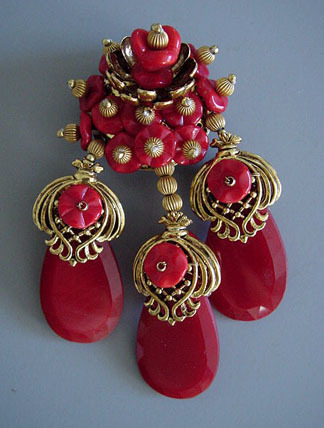 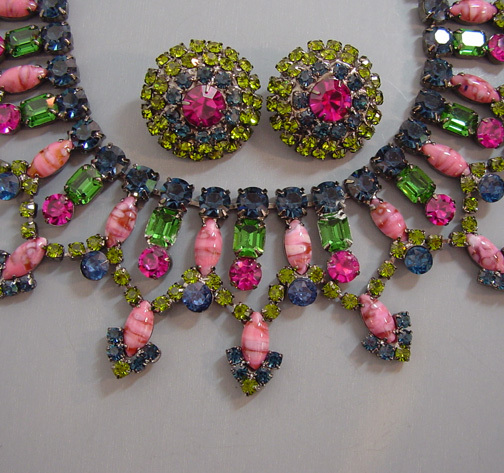 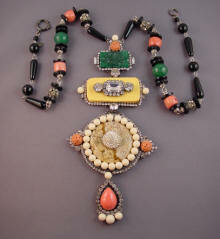 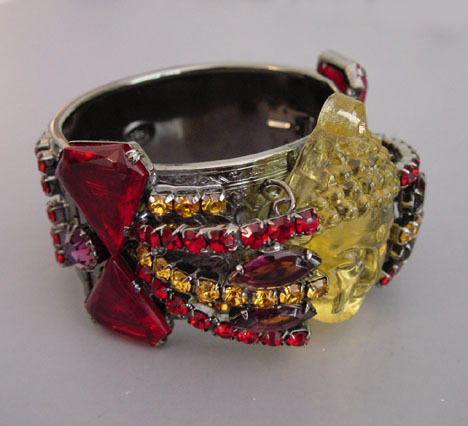 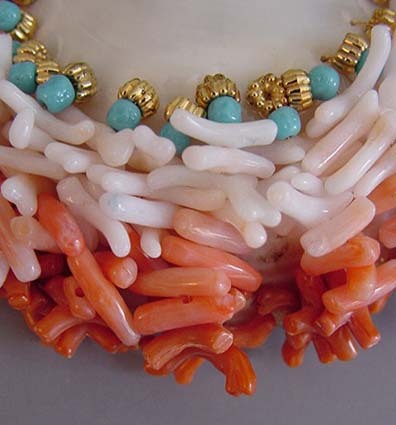 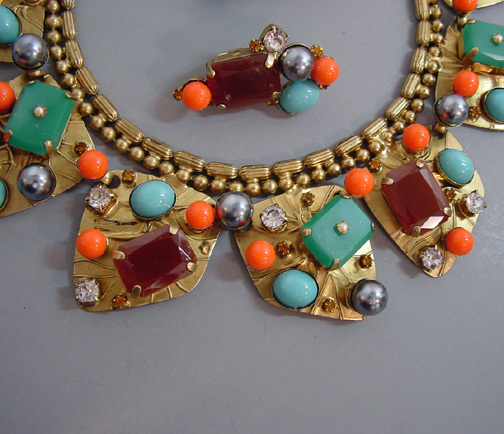 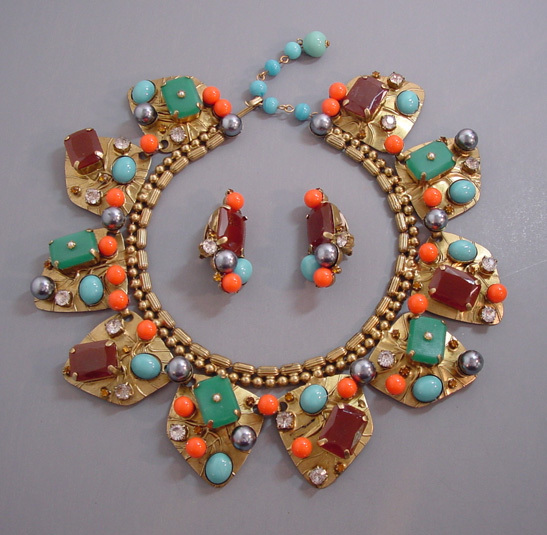 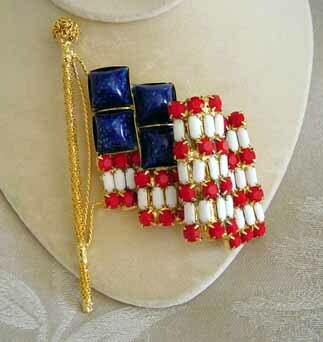 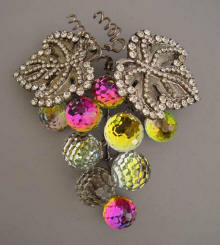 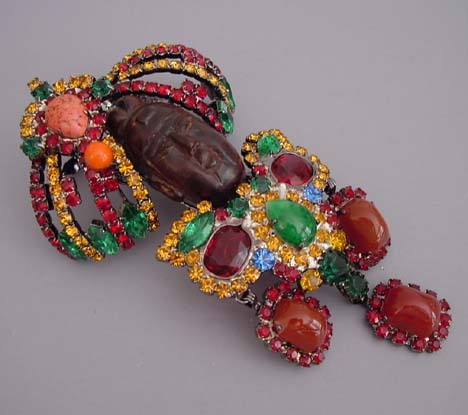 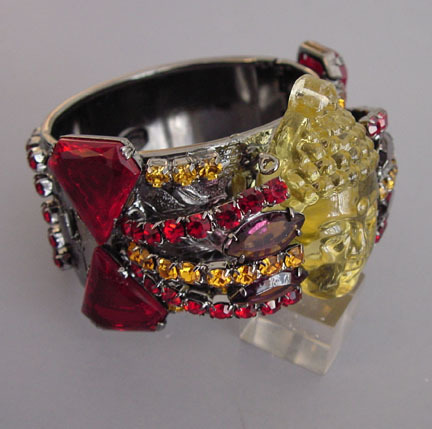 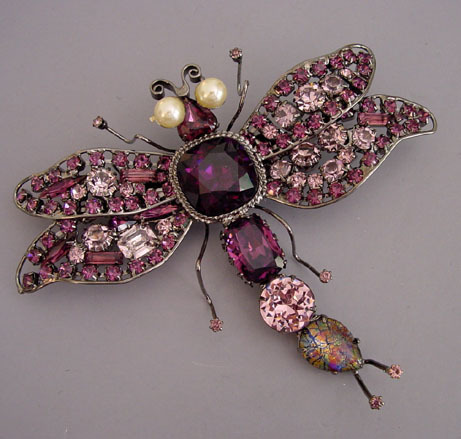 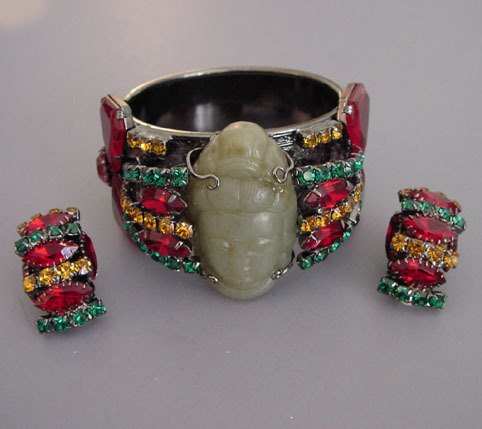 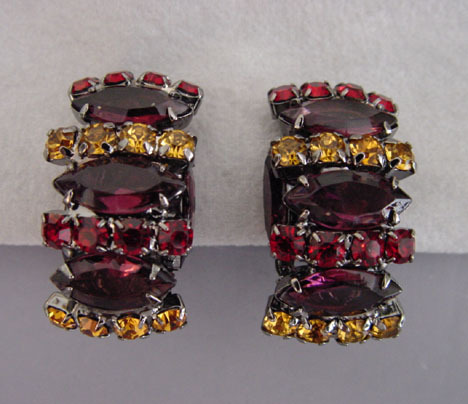 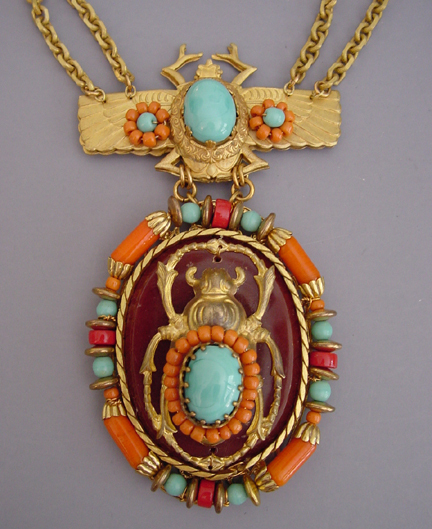 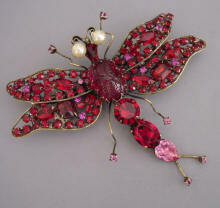 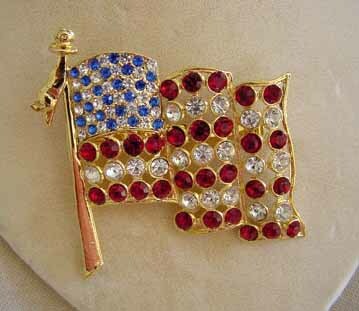 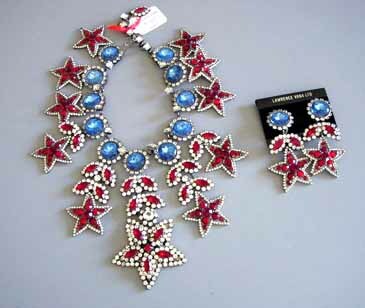 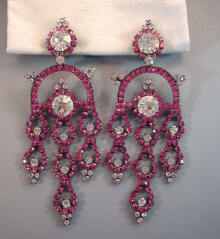 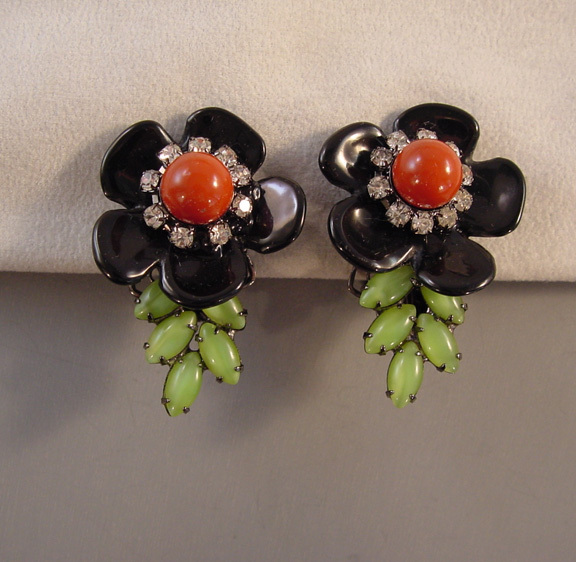 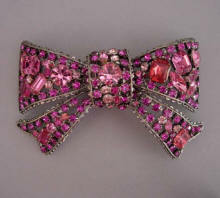 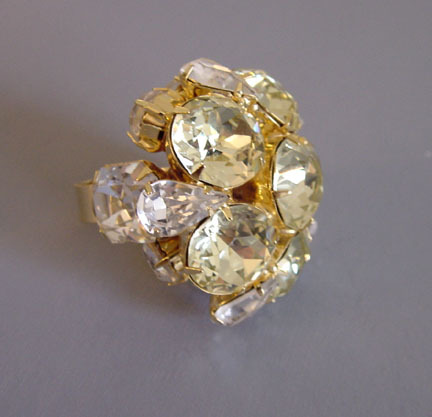 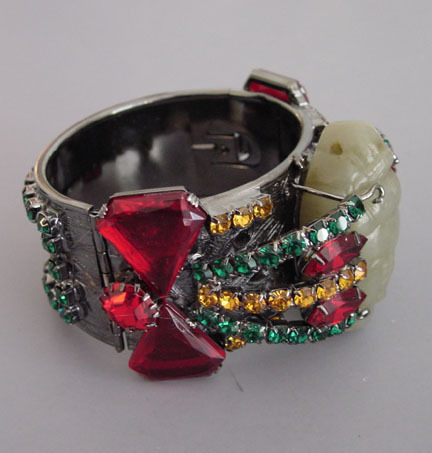 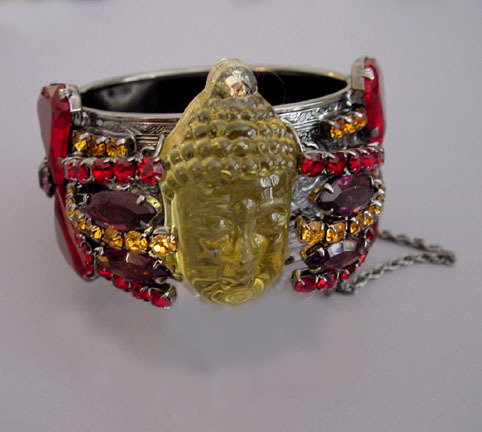 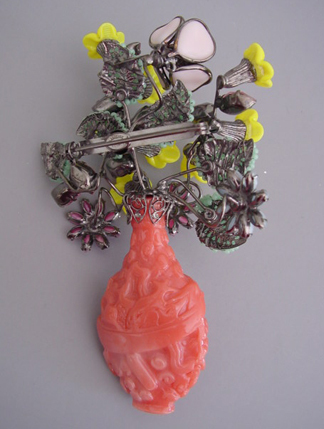 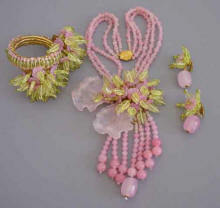 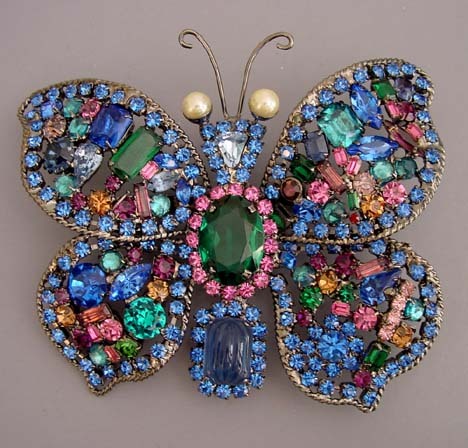 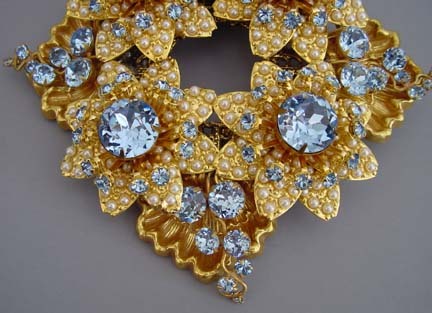 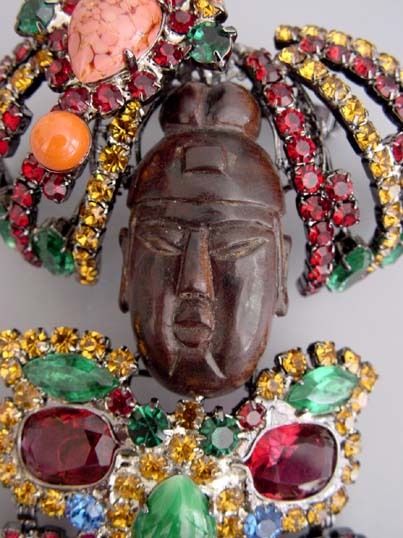 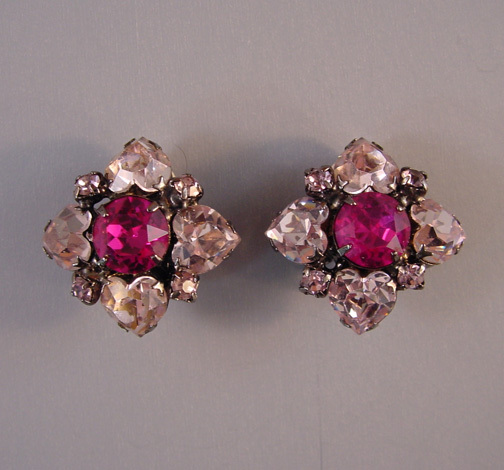 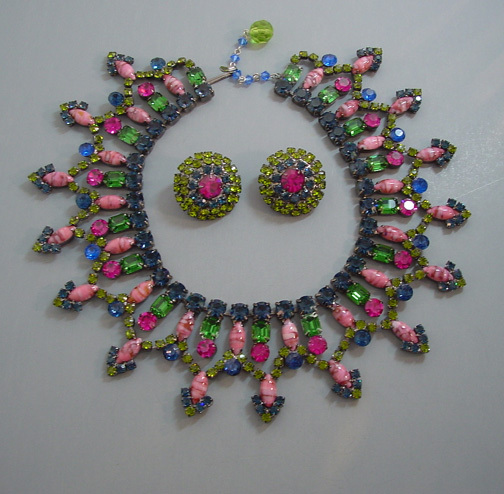 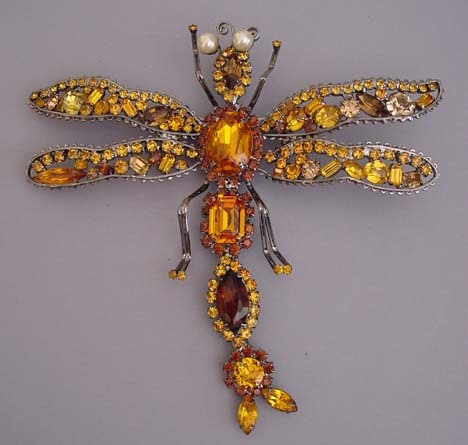 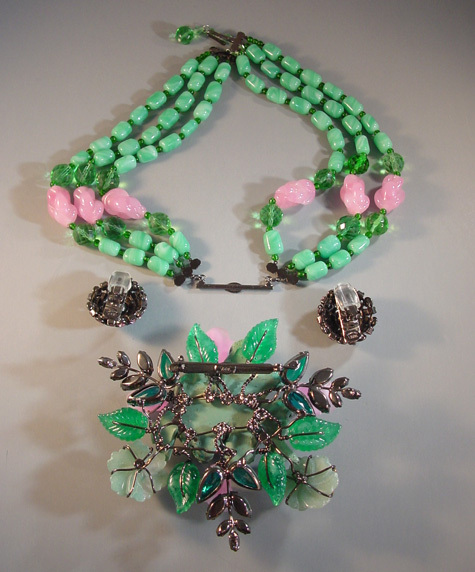 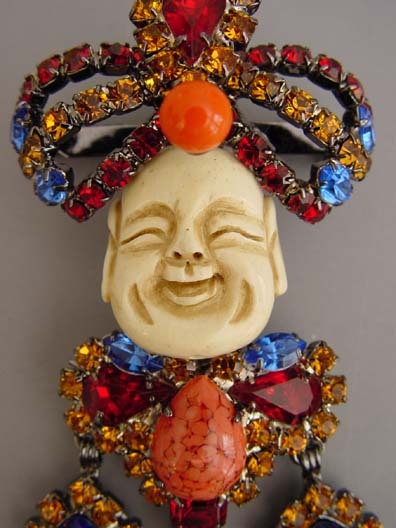 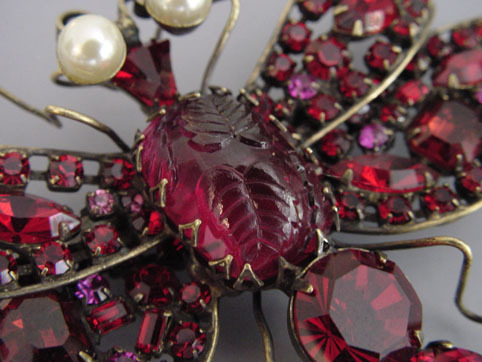 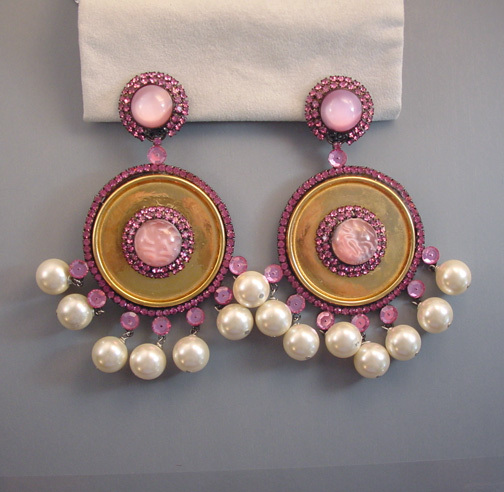 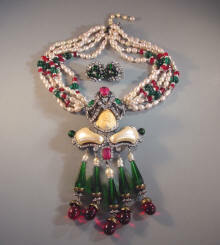 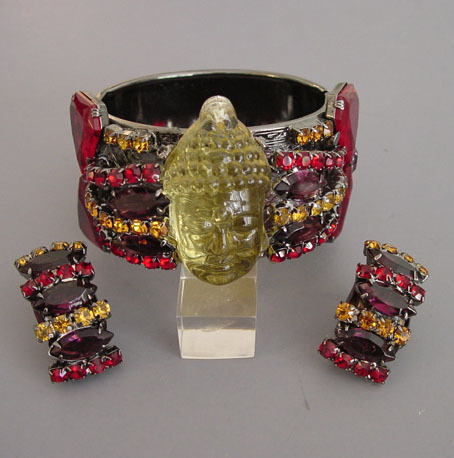 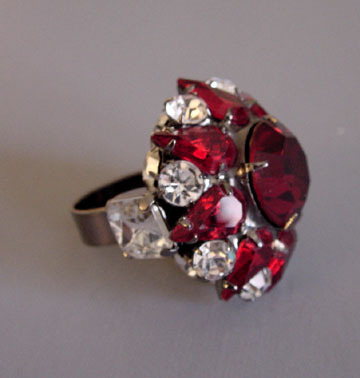 In about 1983 began his own jewelry line, creating strong three-dimensional, colorful and large pieces. 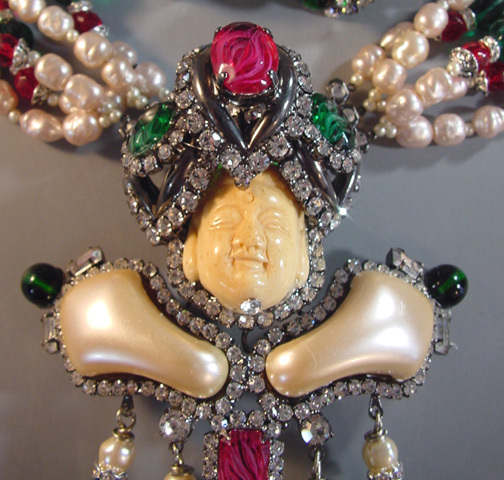 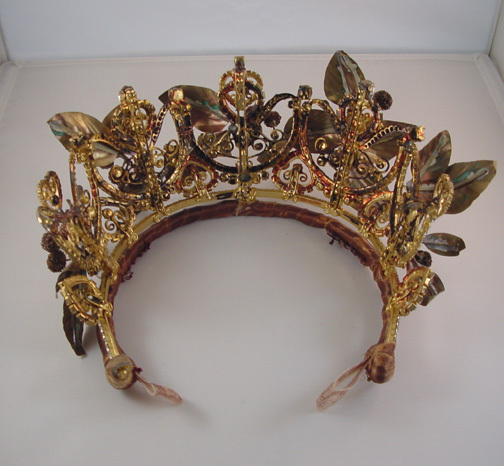 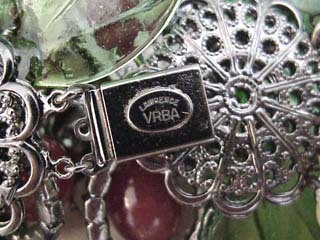 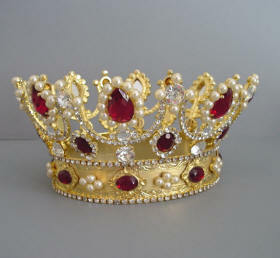 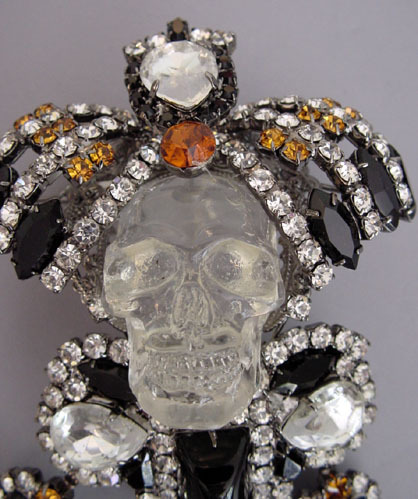 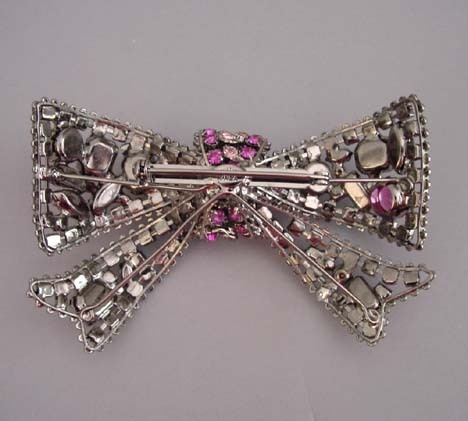 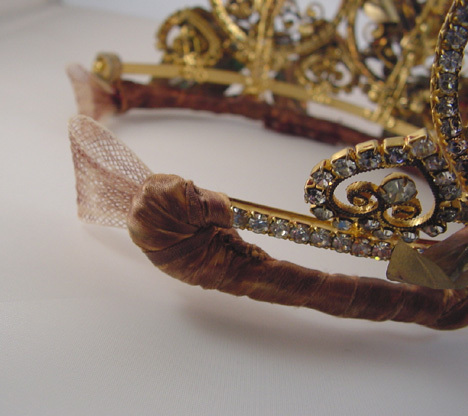 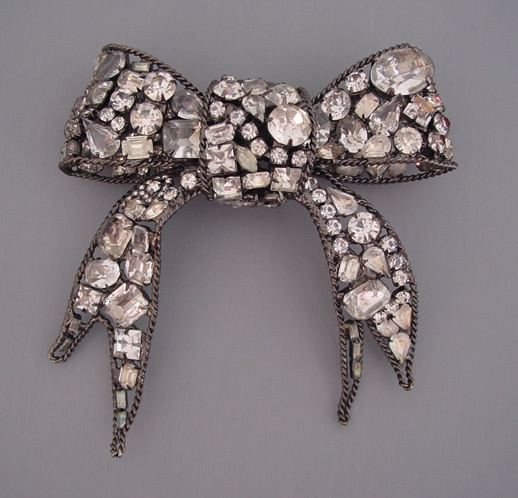 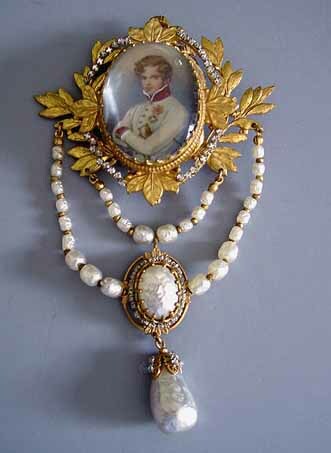 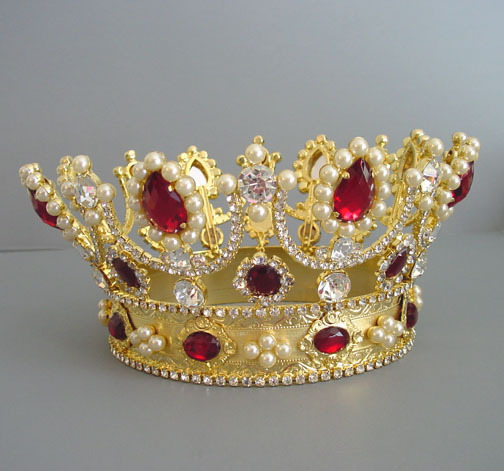 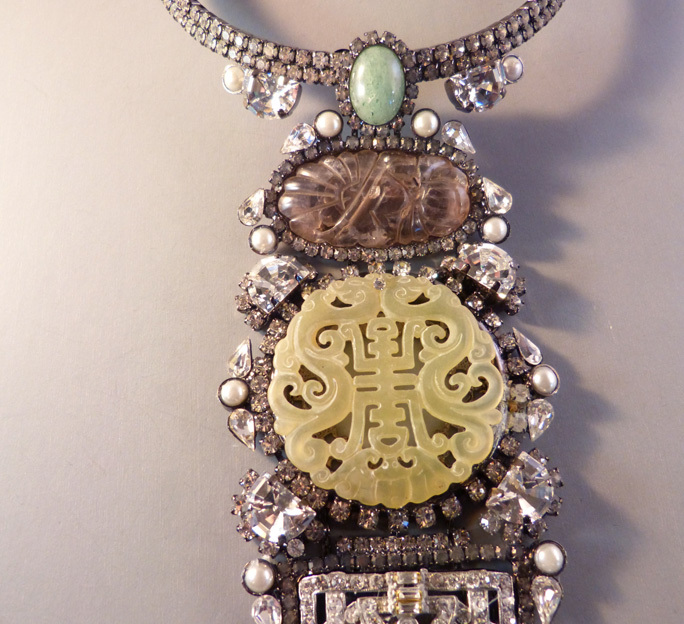 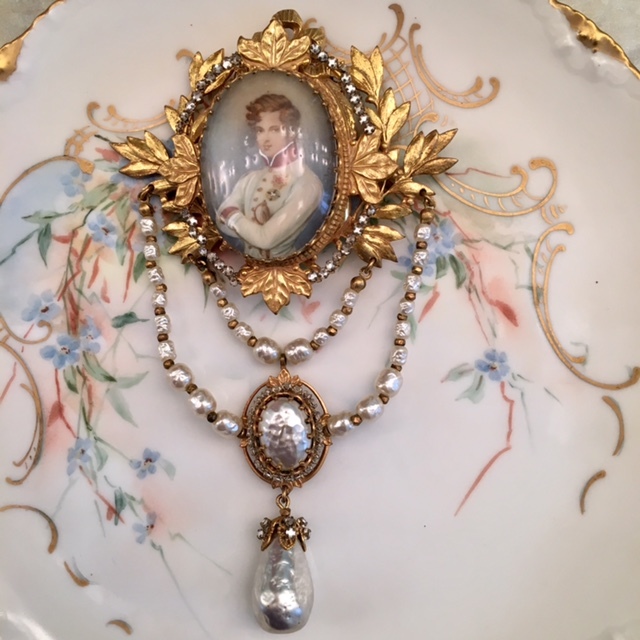 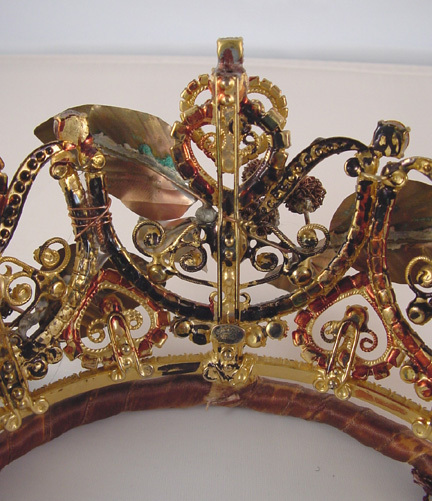 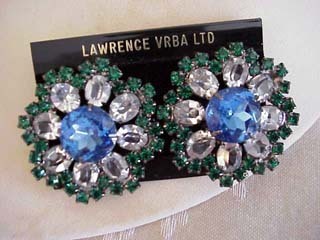 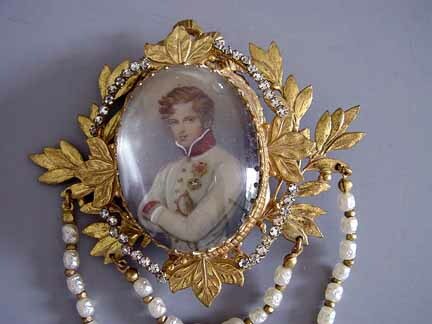 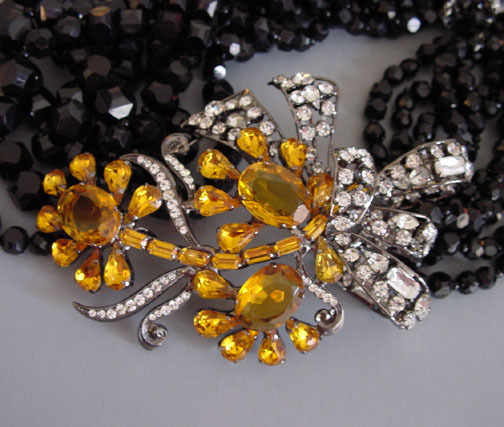 Among the customers for his own "Lawrence Vrba" jewelry can be counted the Broadway theater (jewelry for Hairspray, tiaras and scepters for Wicked and many more), Metropolitan Opera, shops, boutiques and collectors. 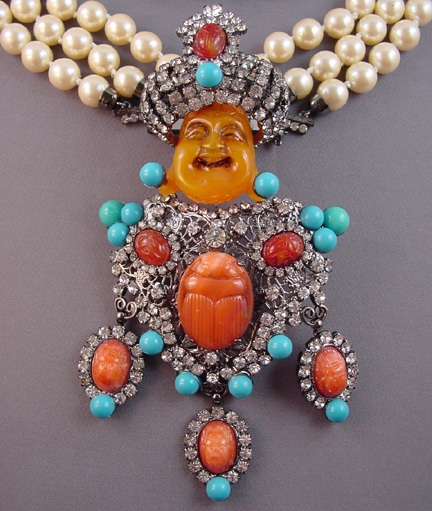 His line is being shown at Bergdorf Goodman, and the most recent Broadway shows for which he has made jewelry are "Hairspray", "Exit the King", "Blythe Spirit" with Jessica Lansbury and the revival of "Lend Me a Tenor". 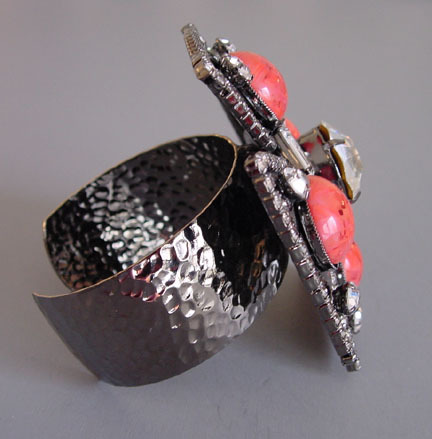 As one of the most respected contemporary jewelry makers around, his line has remained successful and in demand for over 50 years. 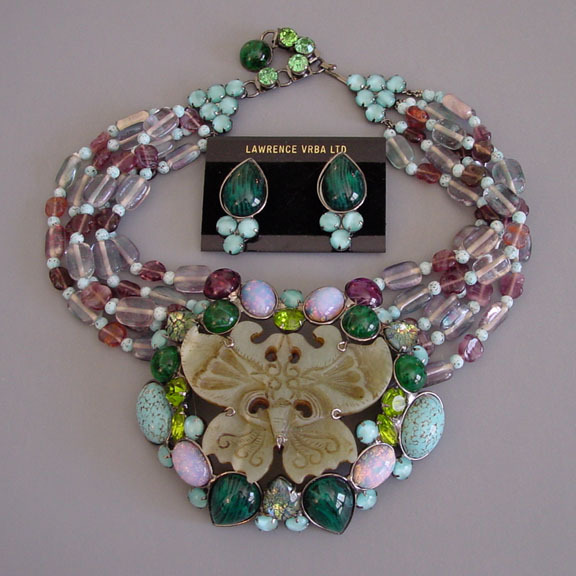 Larry is that unusual combination of the creative talent and a great mind for business. 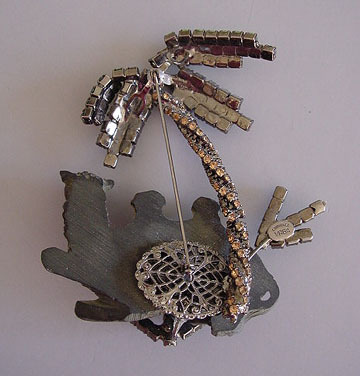 He now works in his own studio creating on a daily basis. 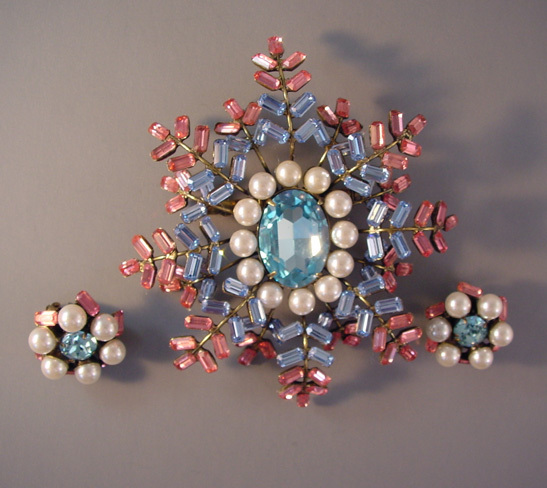 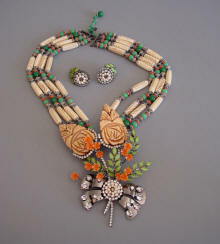 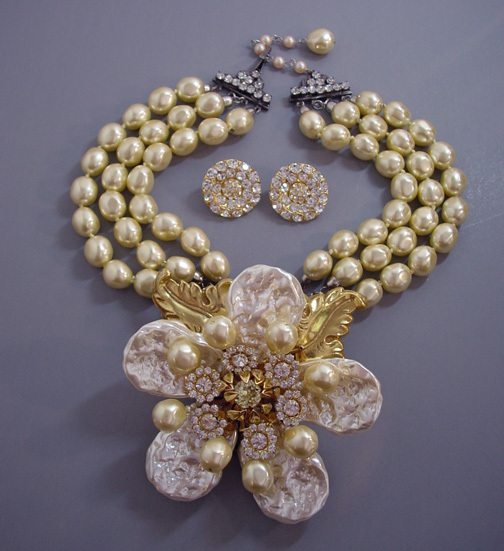 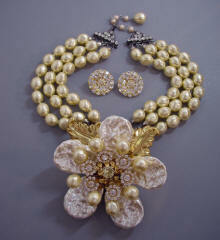 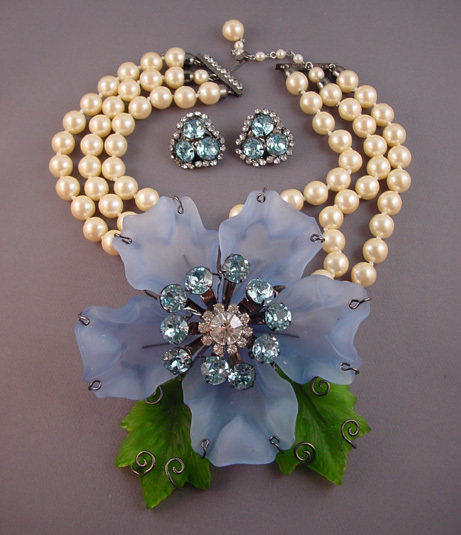 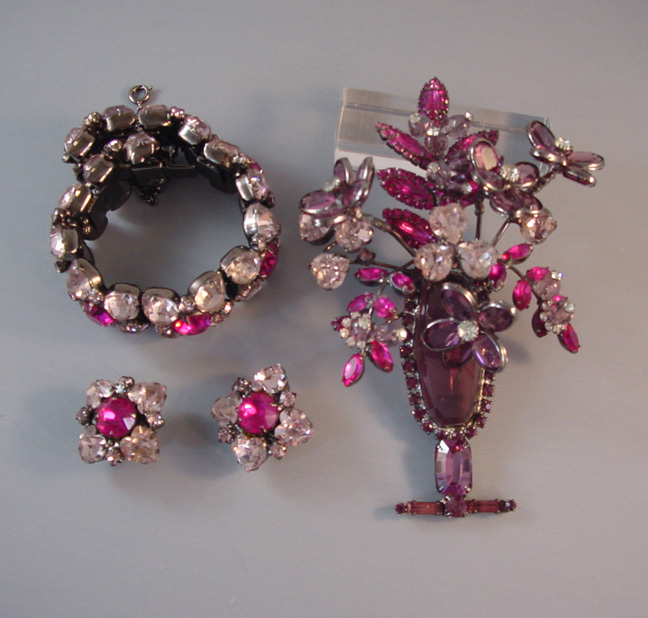 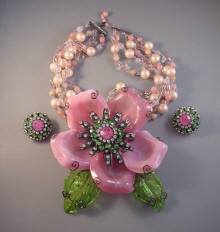 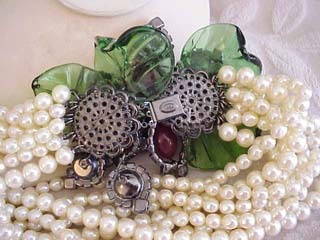 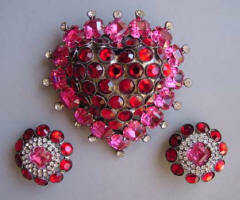 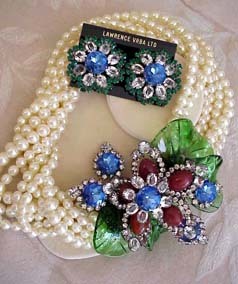 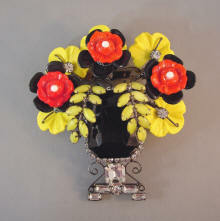 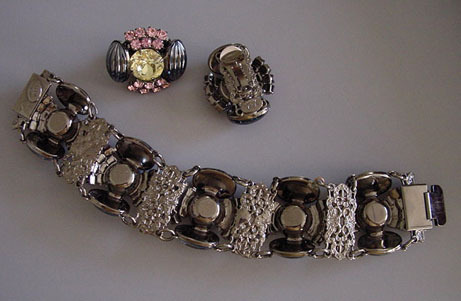 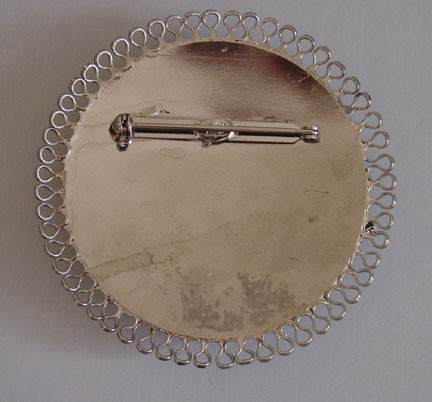 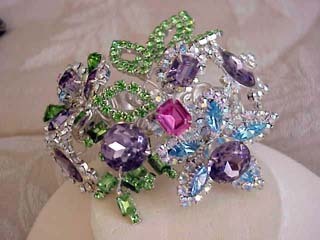 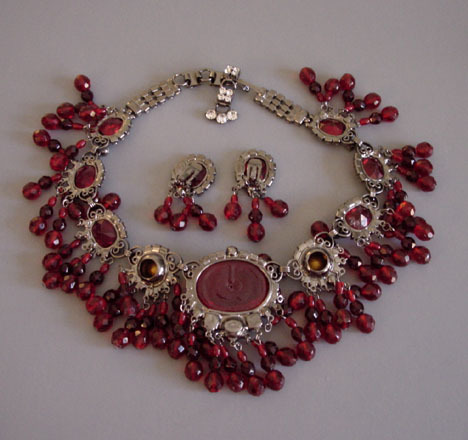 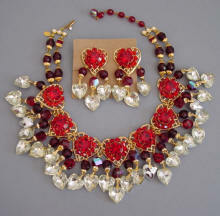 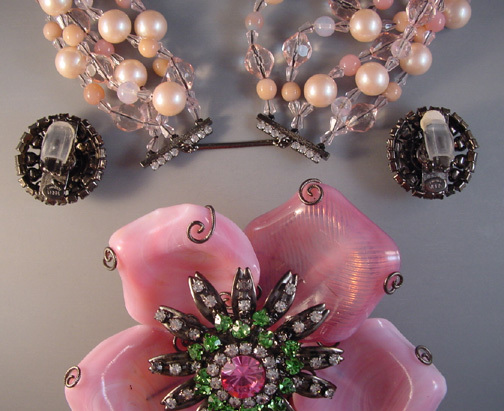 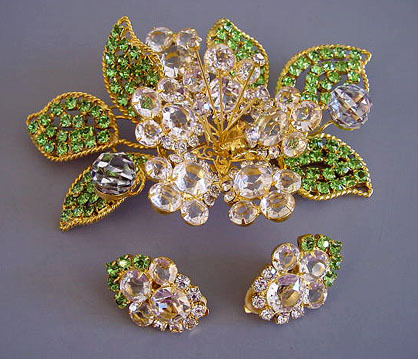 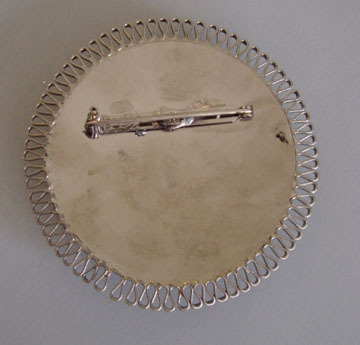 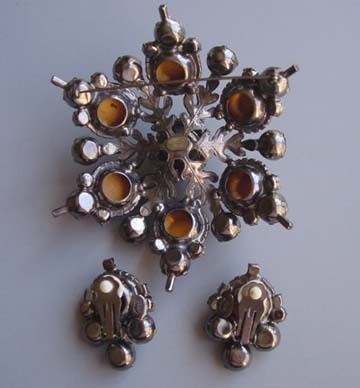 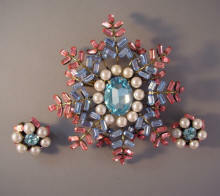 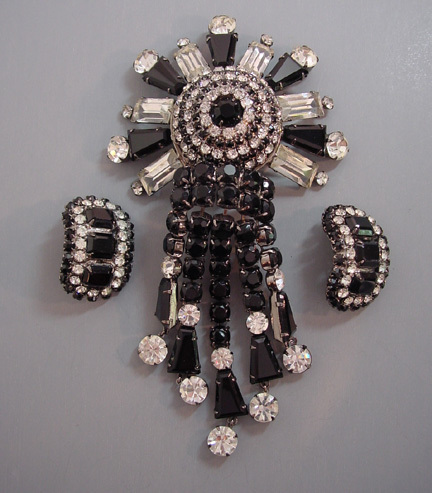 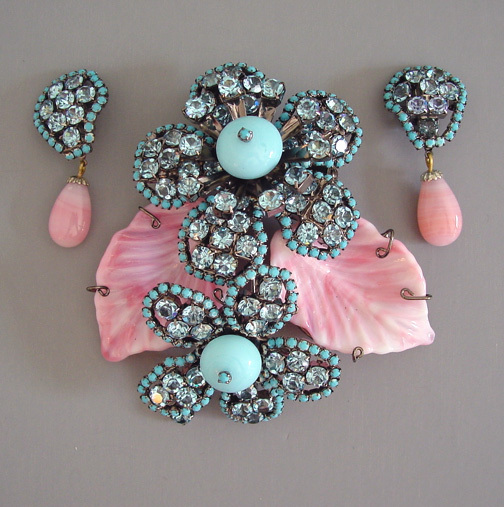 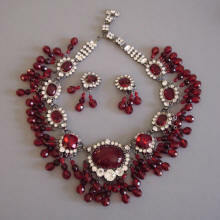 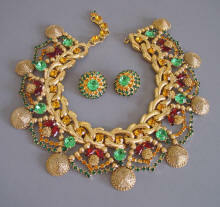 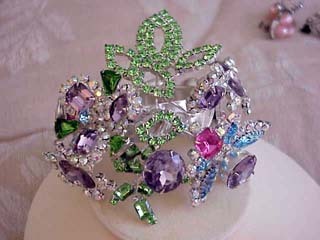 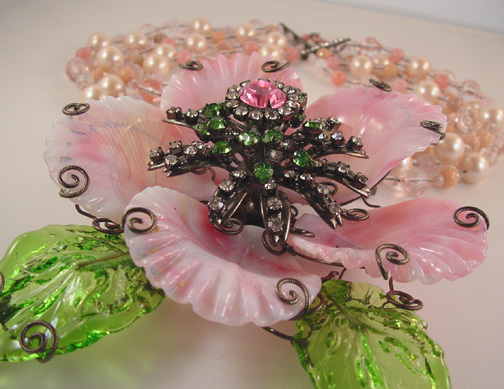 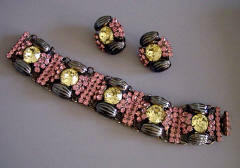 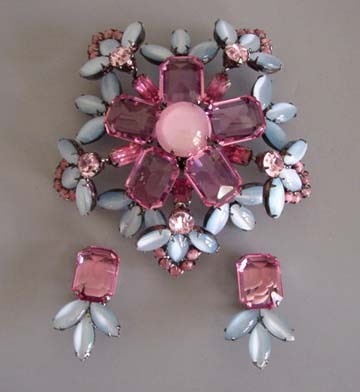 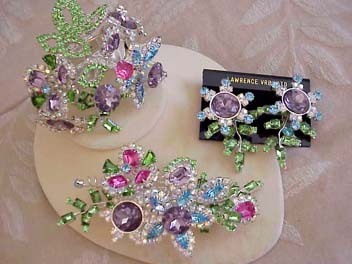 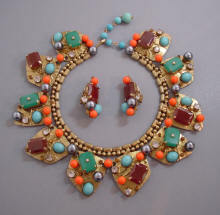 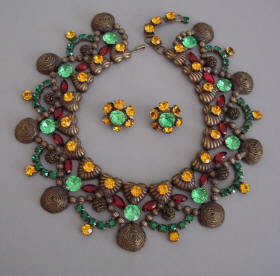 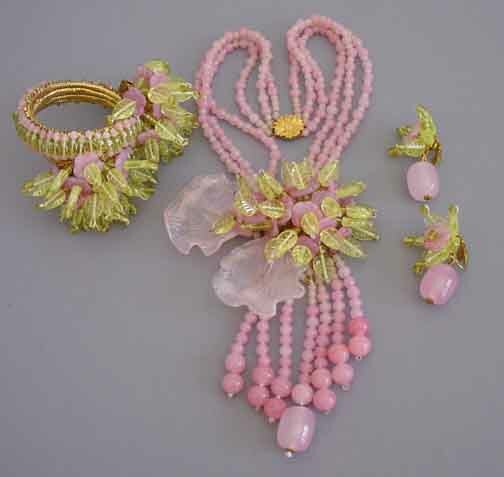 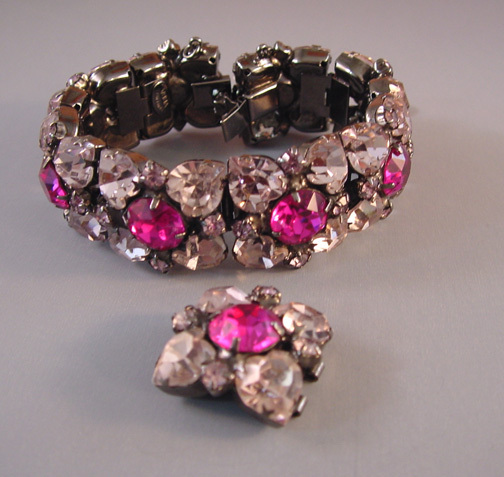 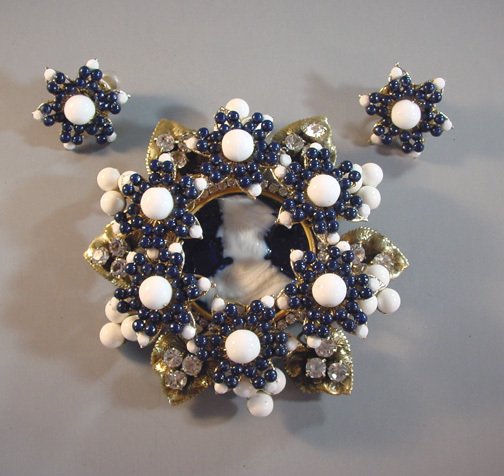 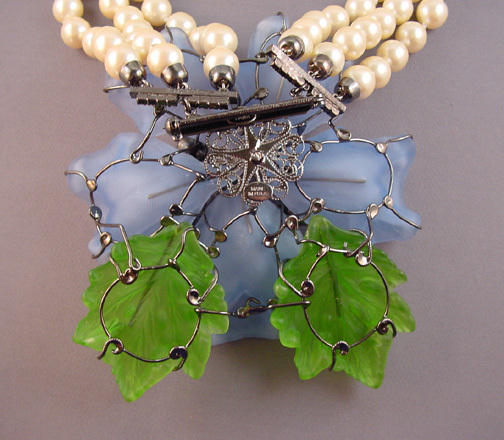 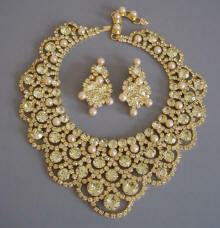 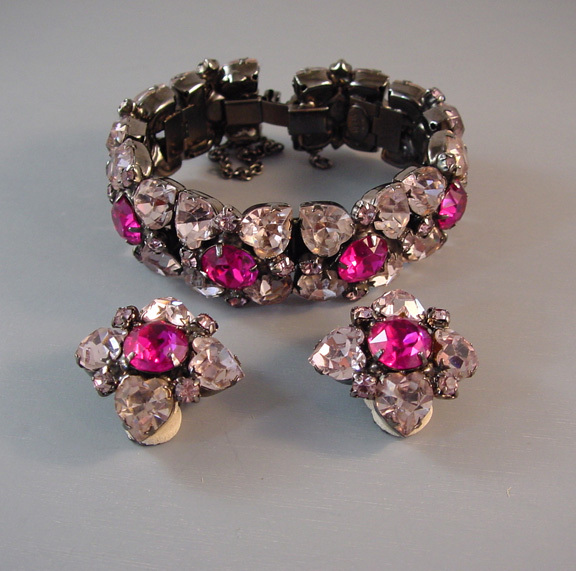 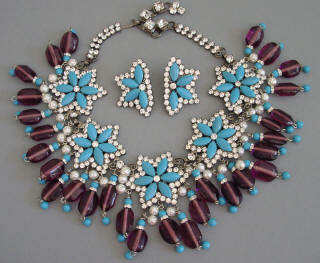 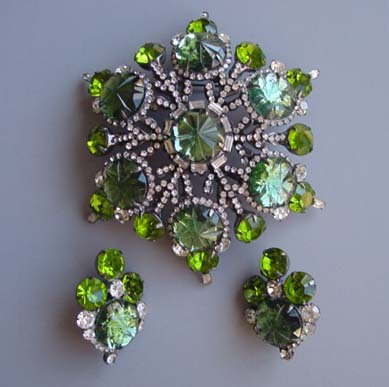 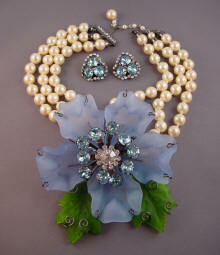 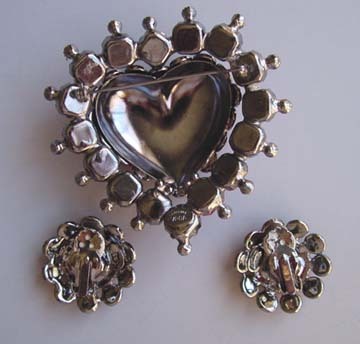 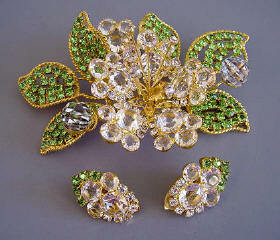 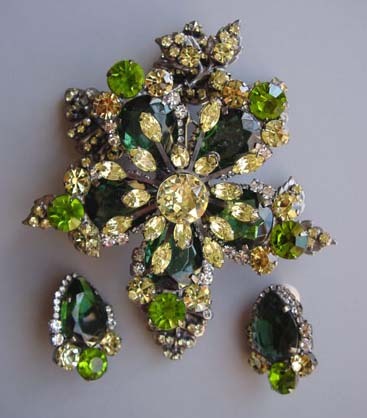 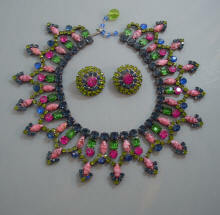 This set is quite large, with an 8" hinged bangle, a 5" bouquet brooch and 2-1/2" earrings. 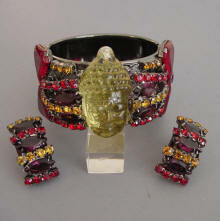 I am 5'3" and can wear them all, but I do need to wear the bangle over a shirt cuff so that it remains upright. 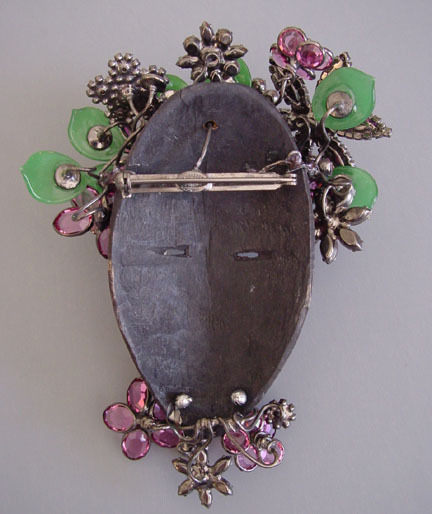 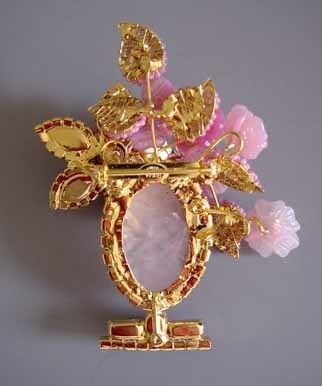 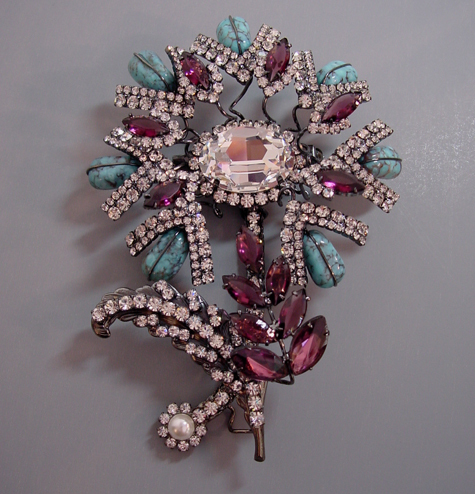 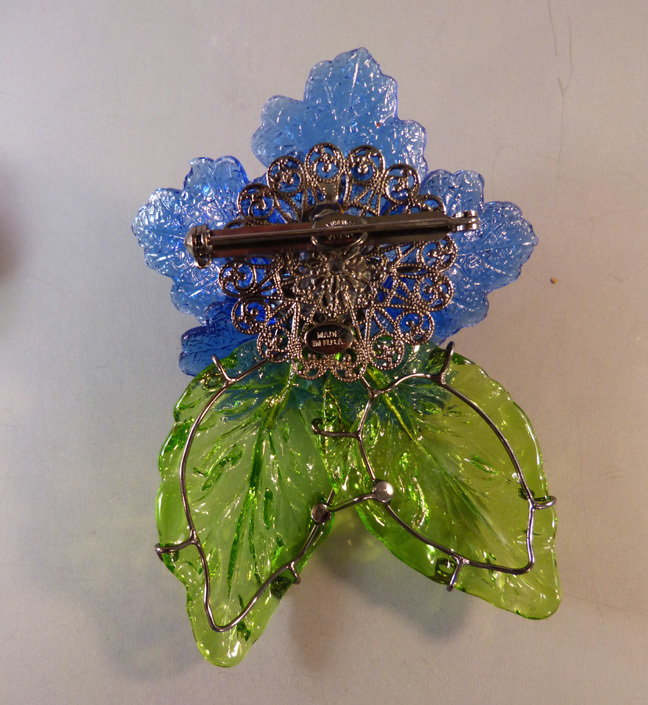 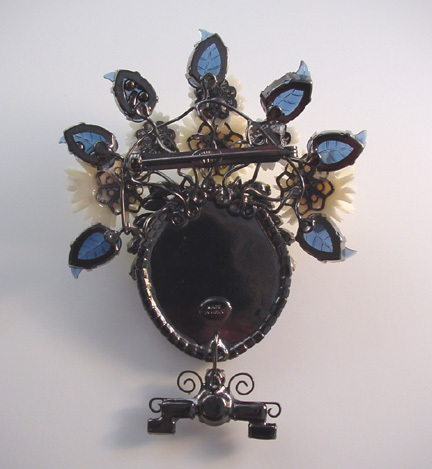 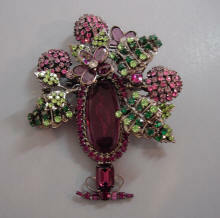 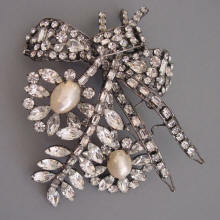 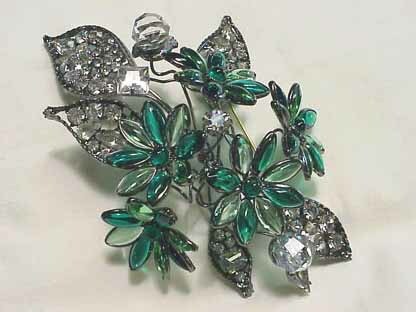 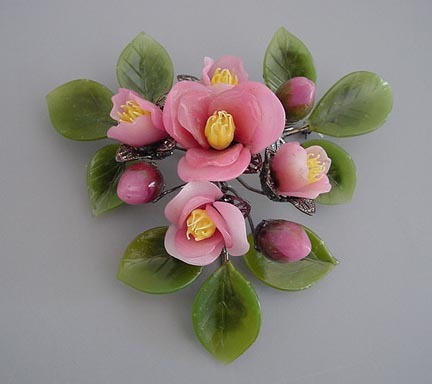 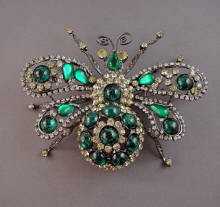 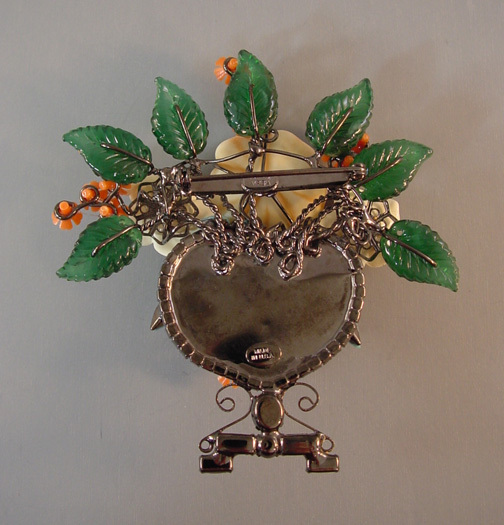 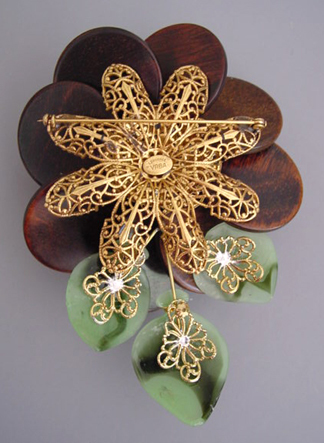 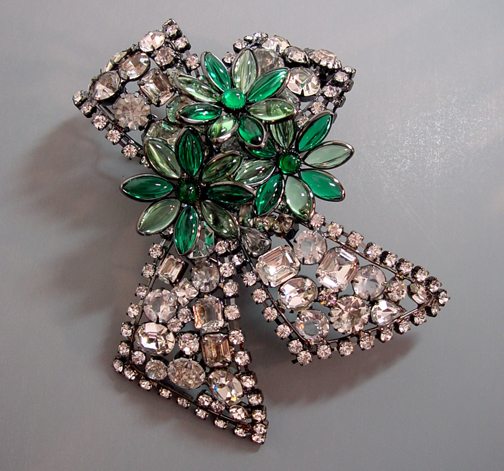 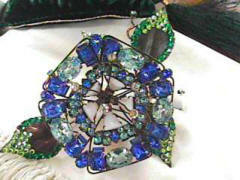 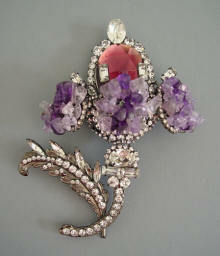 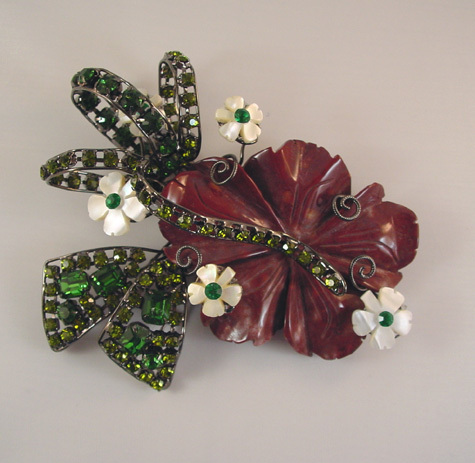 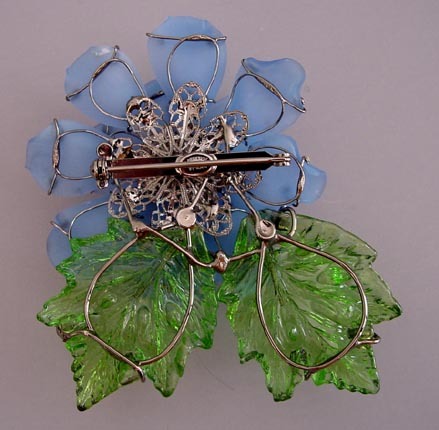 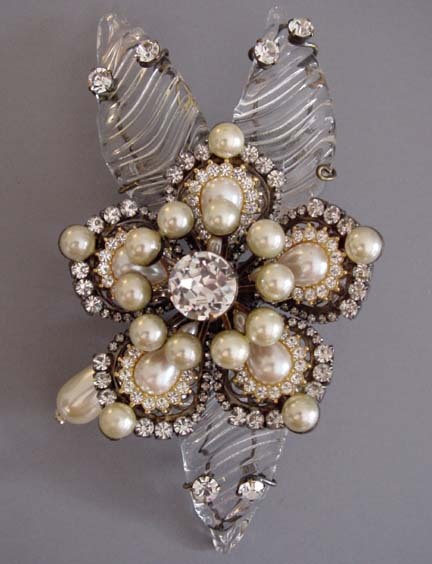 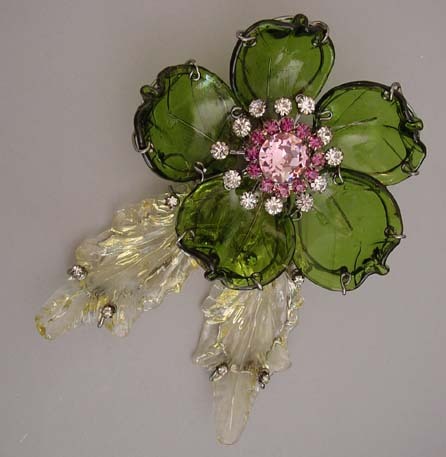 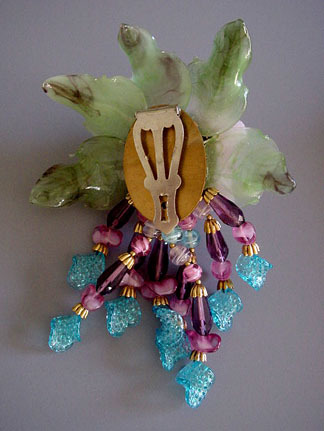 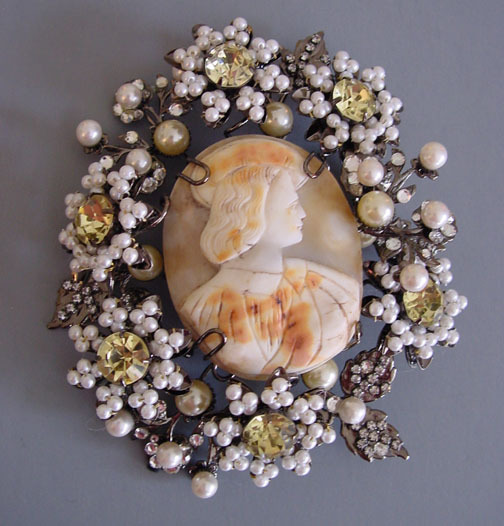 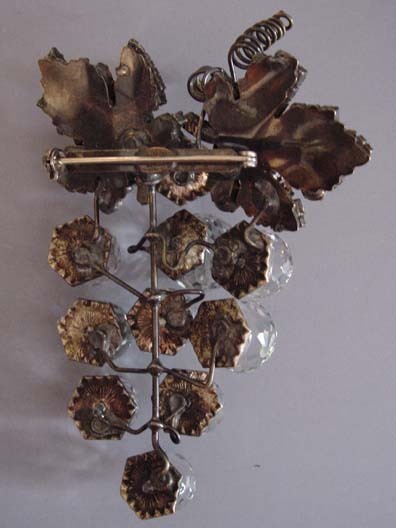 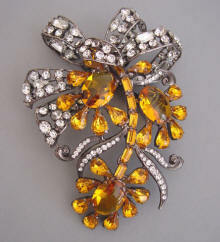 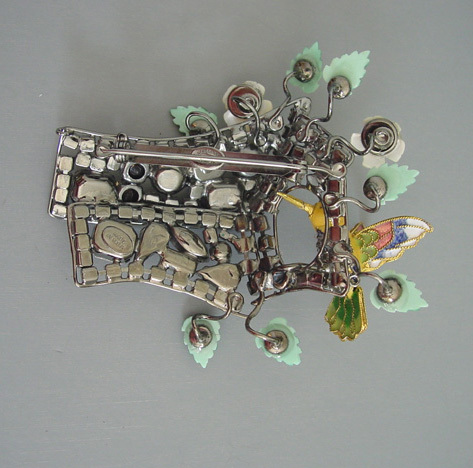 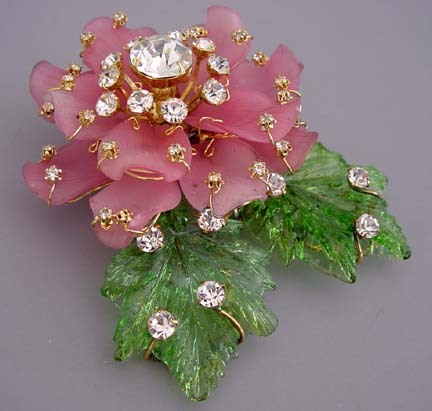 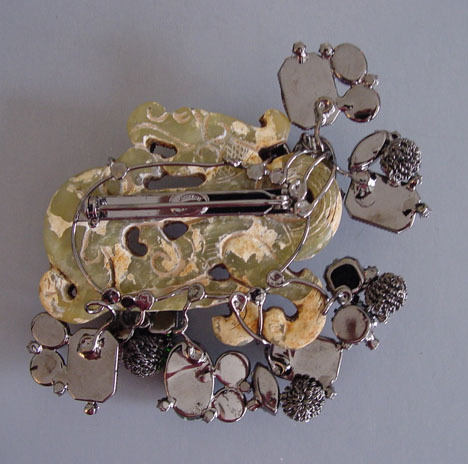 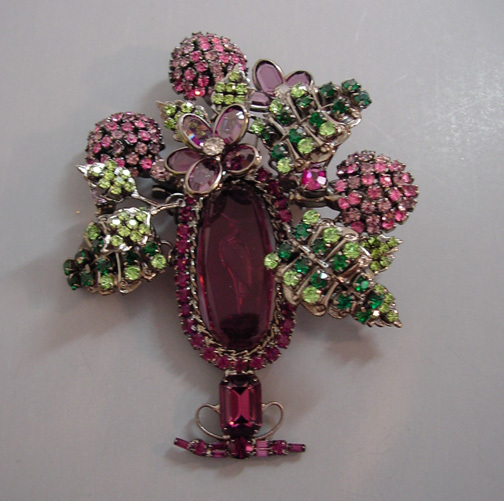 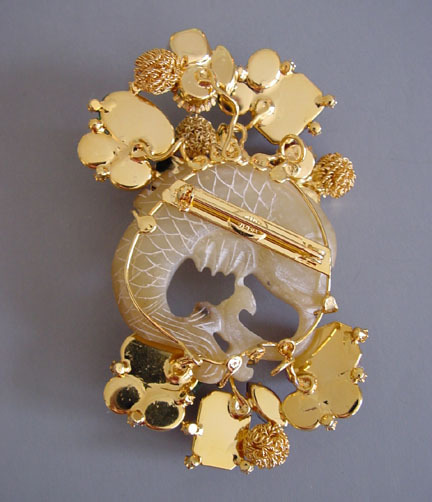 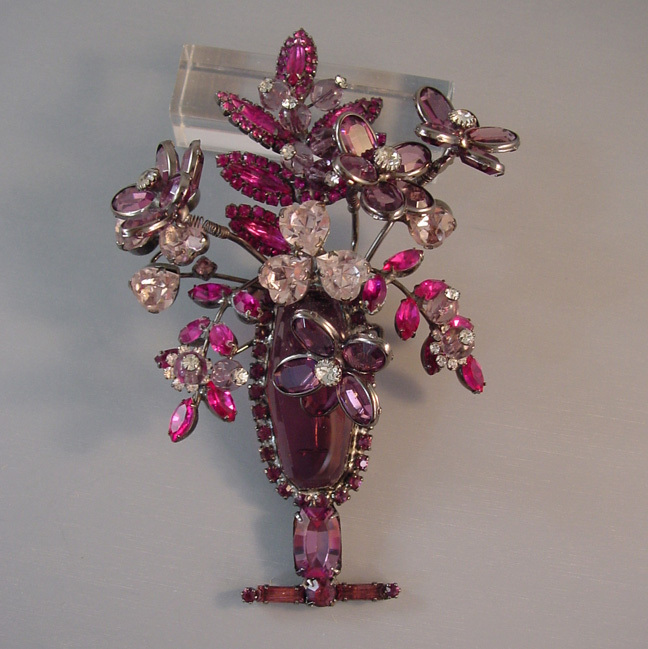 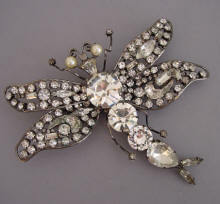 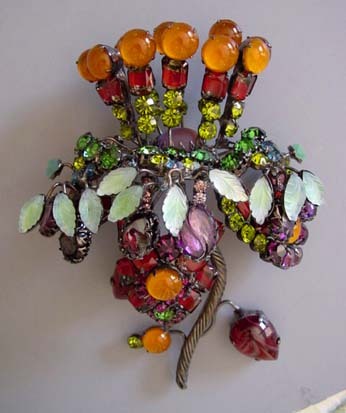 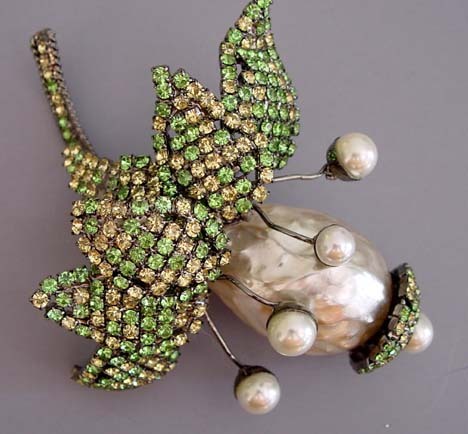 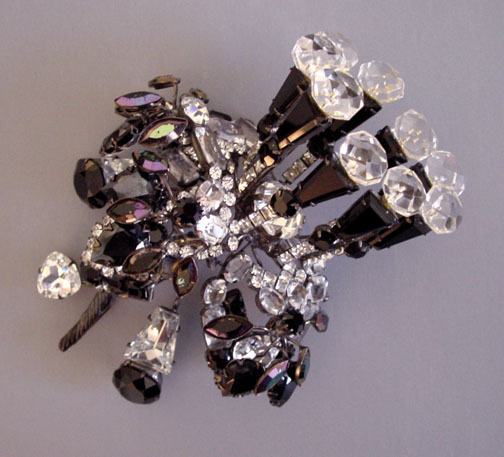 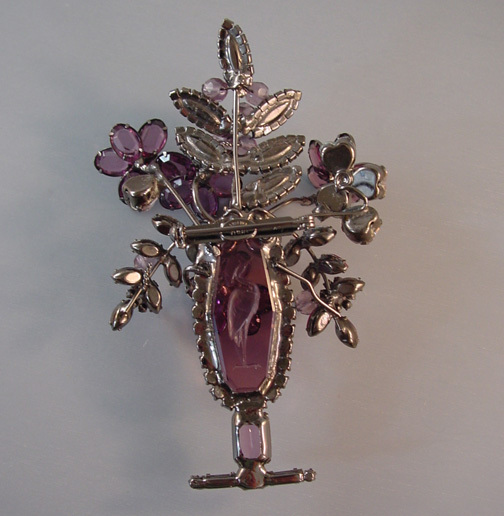 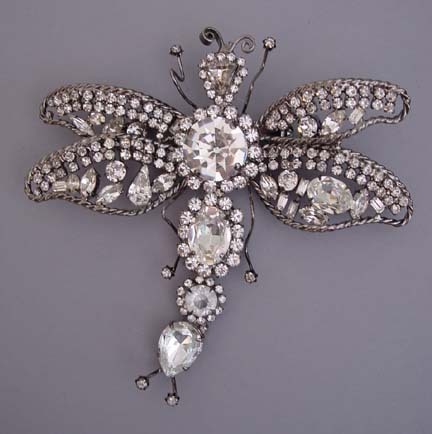 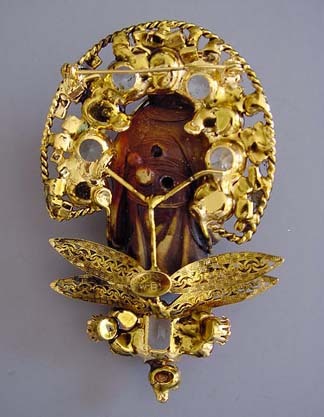 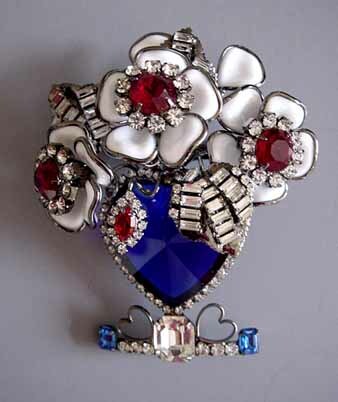 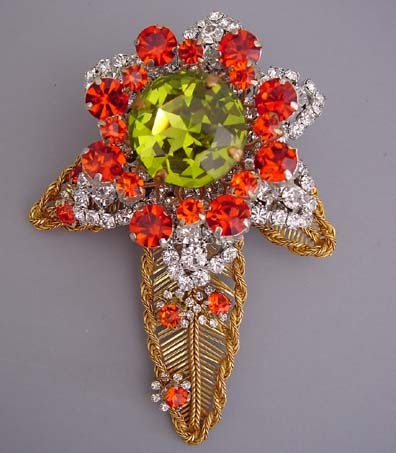 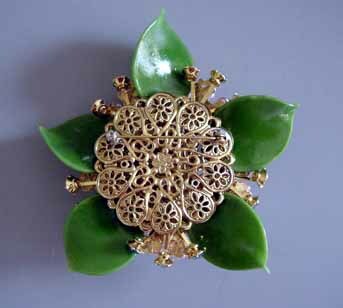 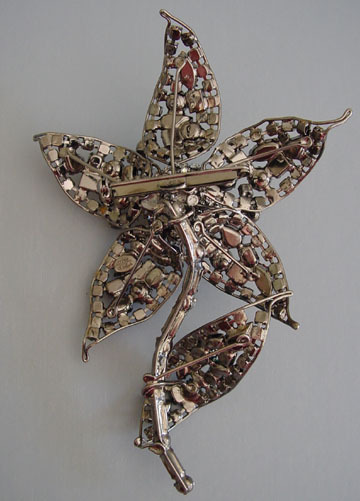 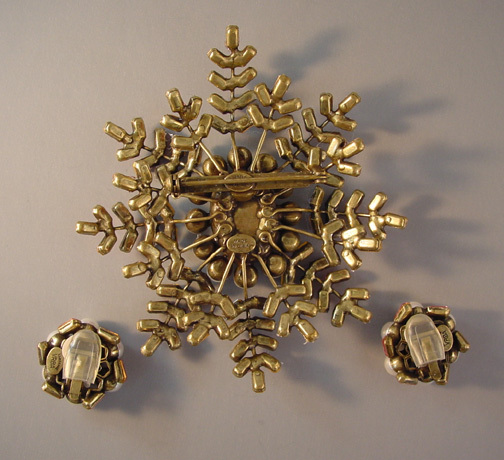 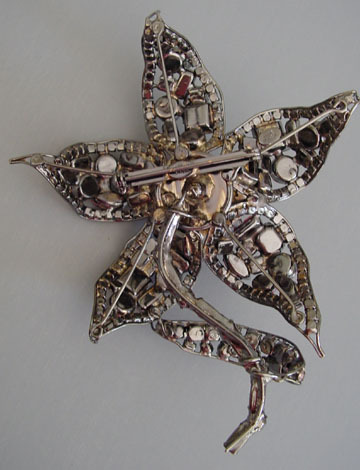 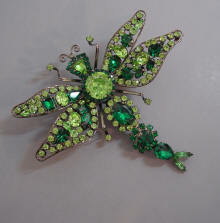 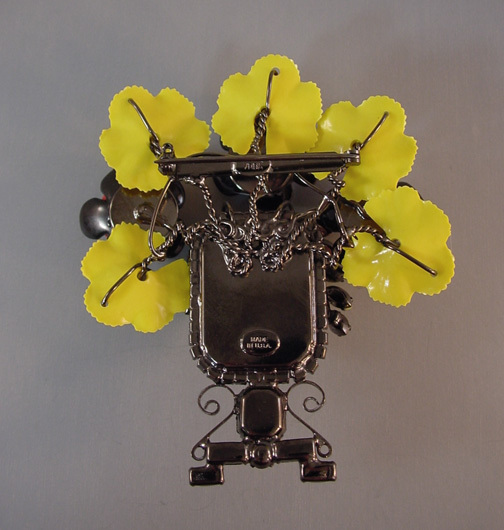 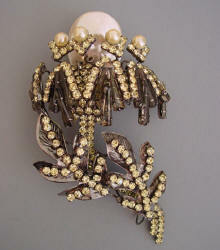 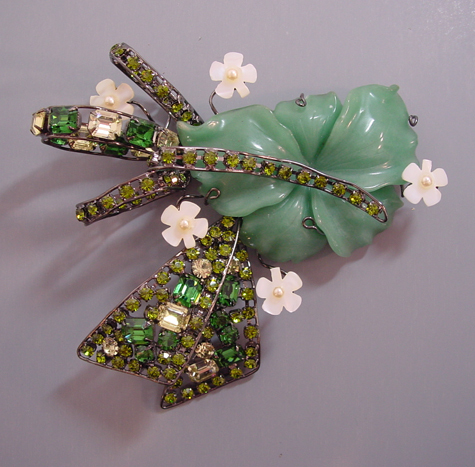 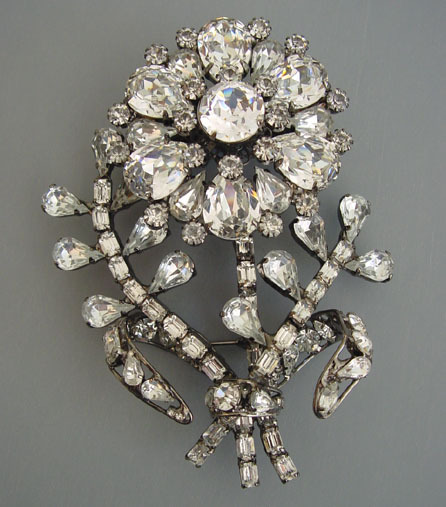 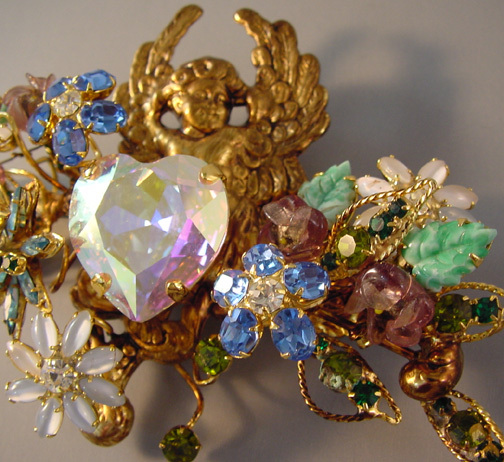 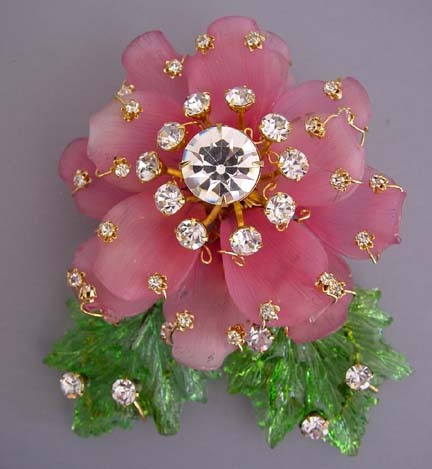 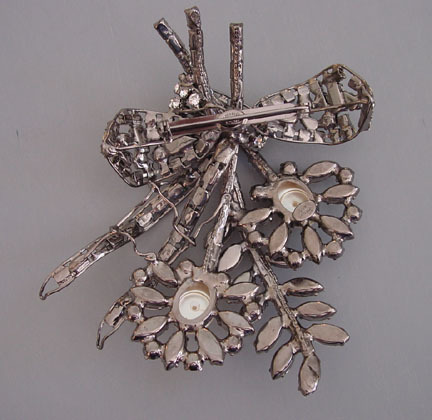 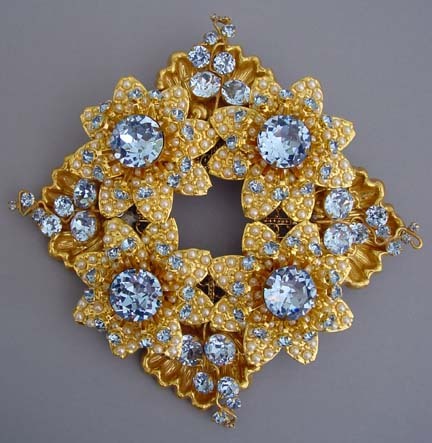 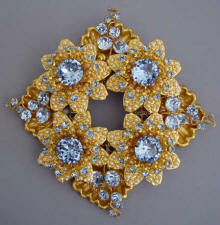 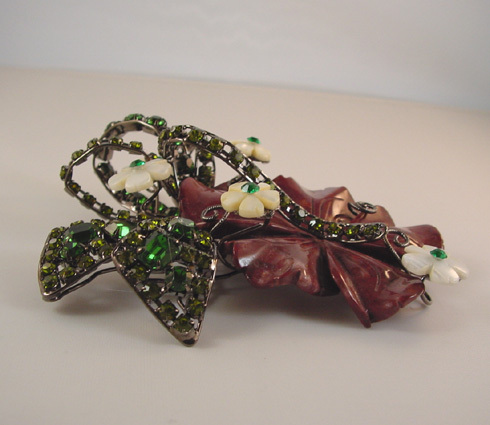 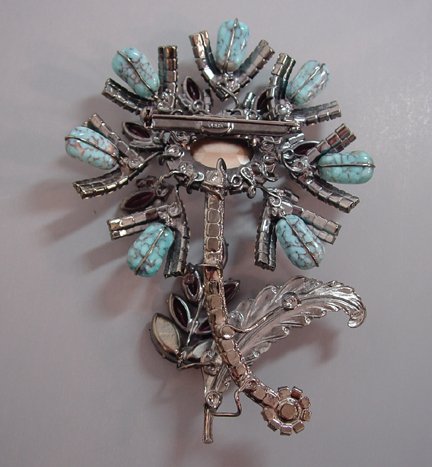 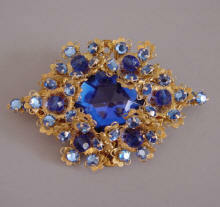 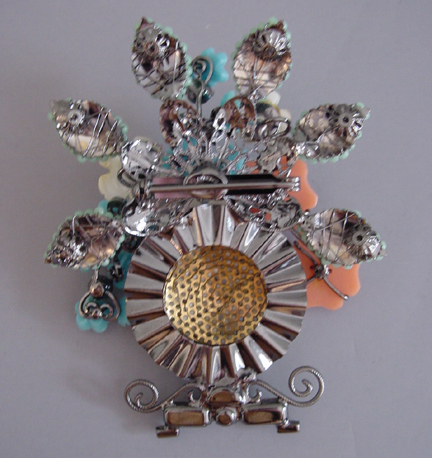 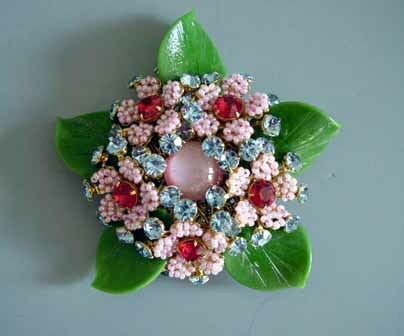 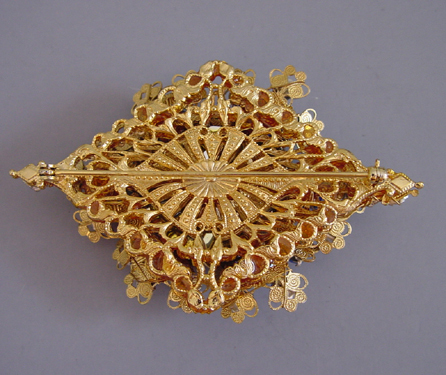 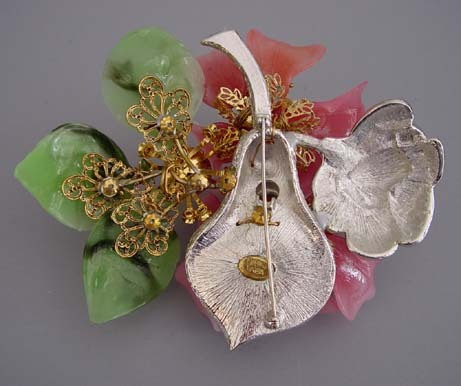 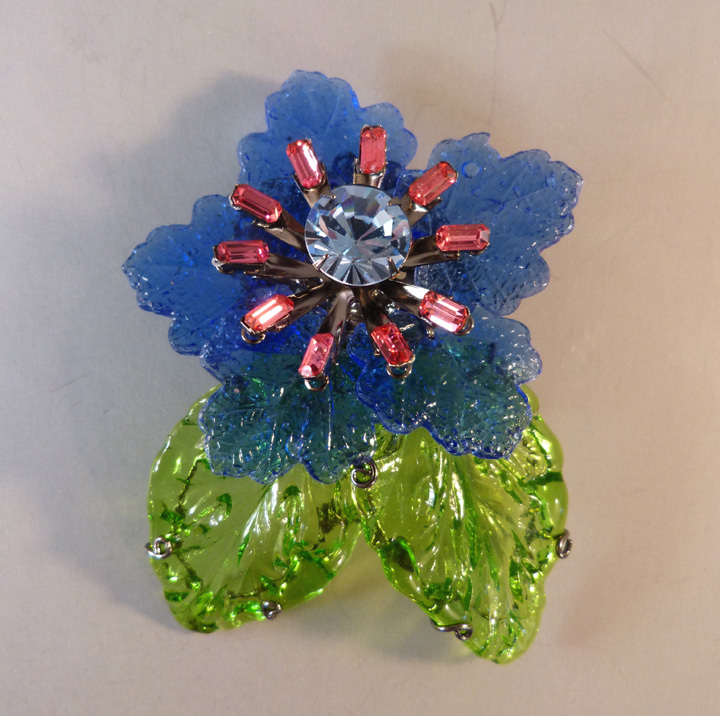 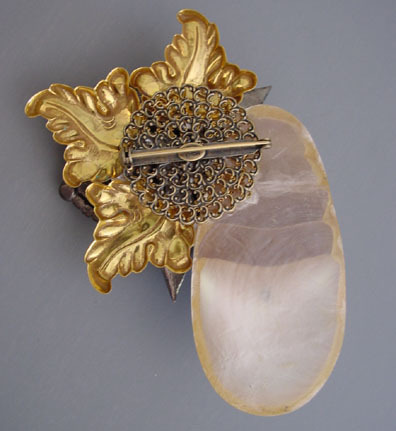 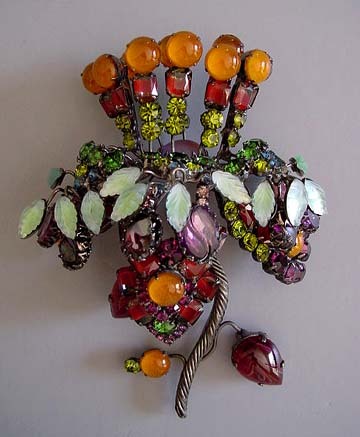 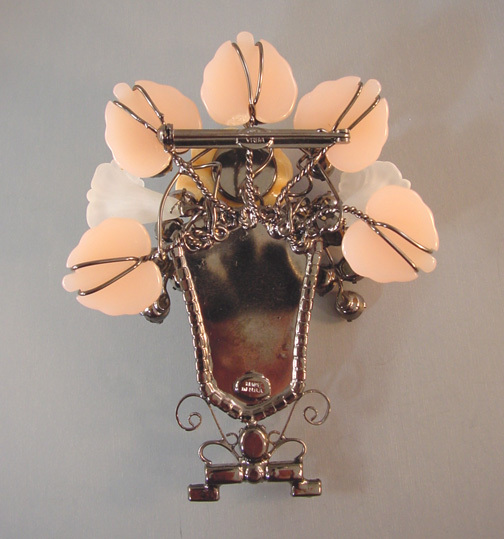 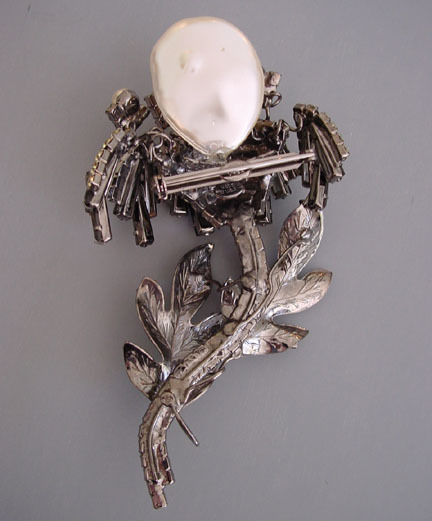 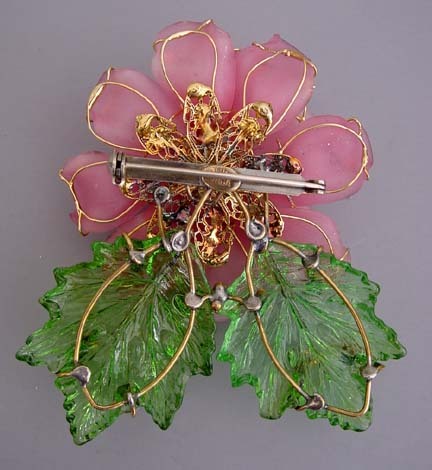 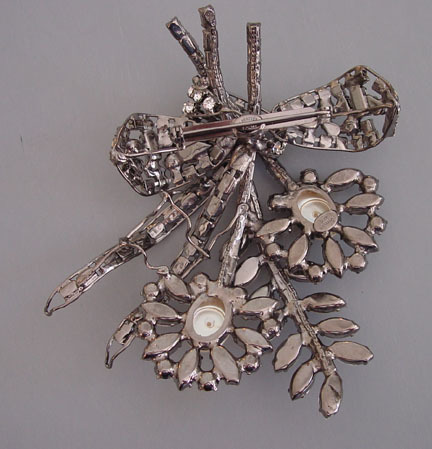 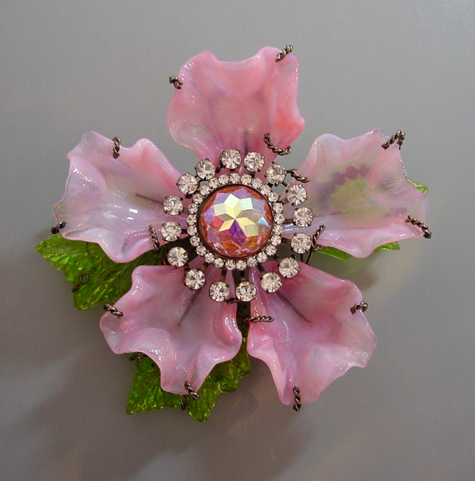 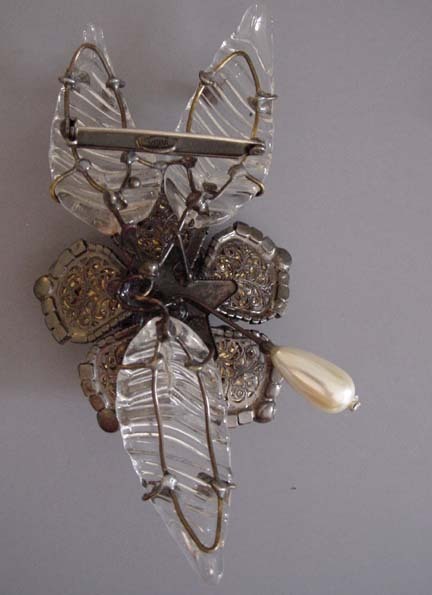 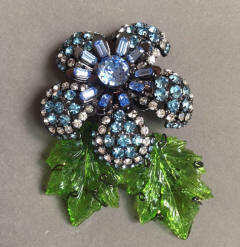 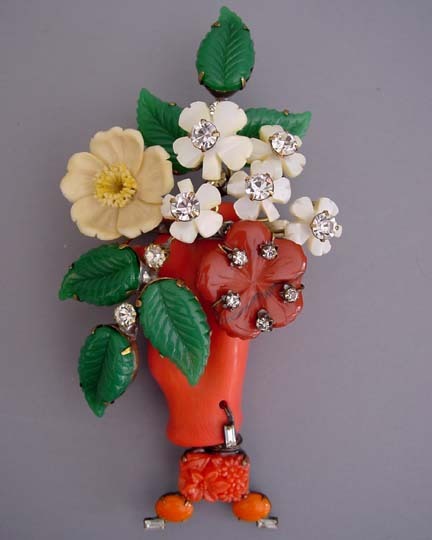 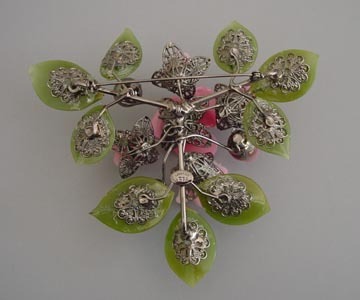 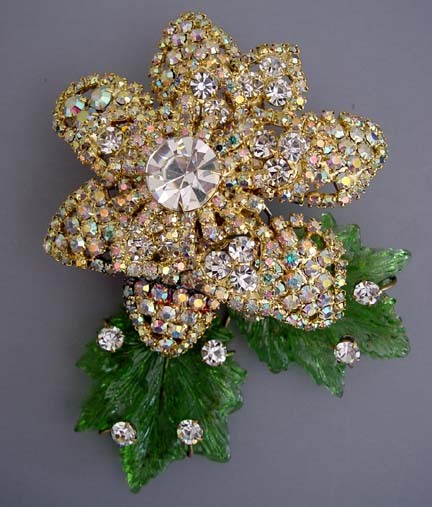 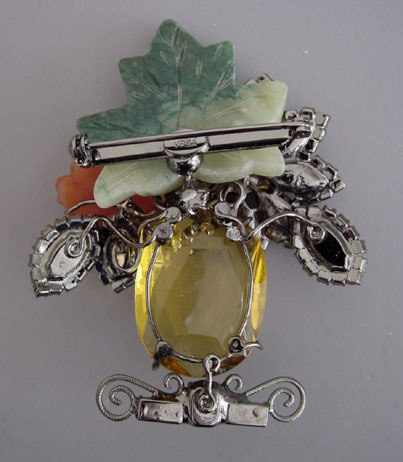 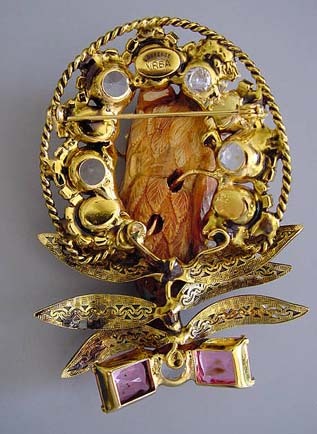 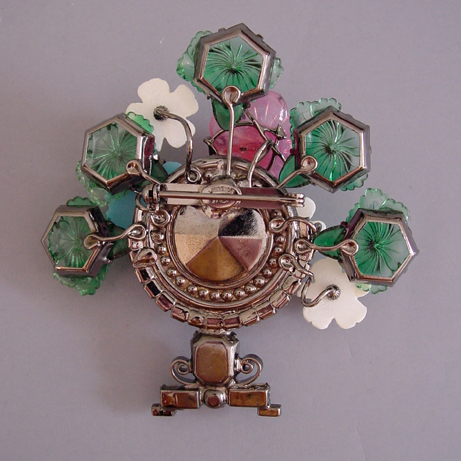 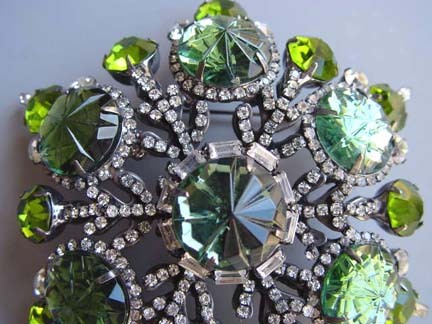 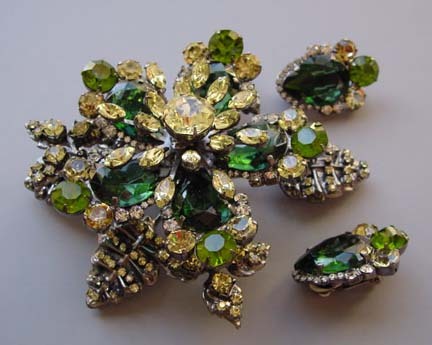 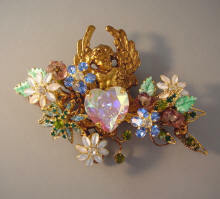 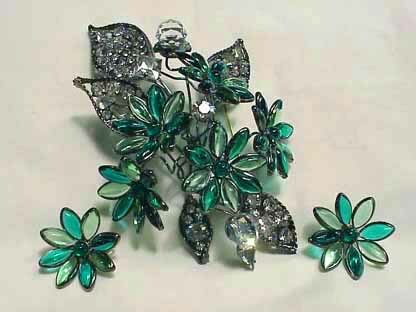 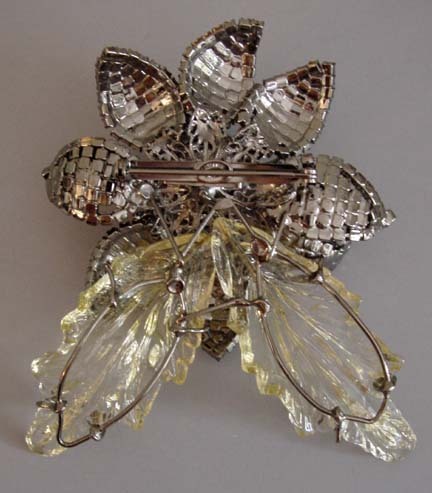 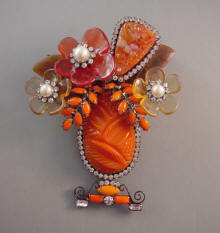 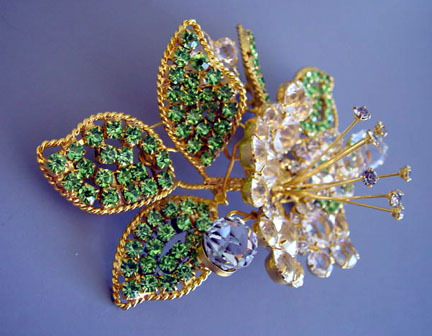 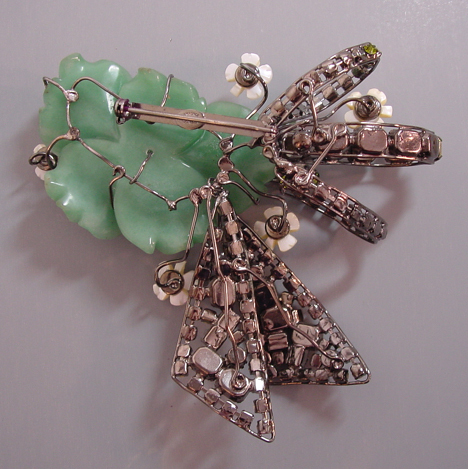 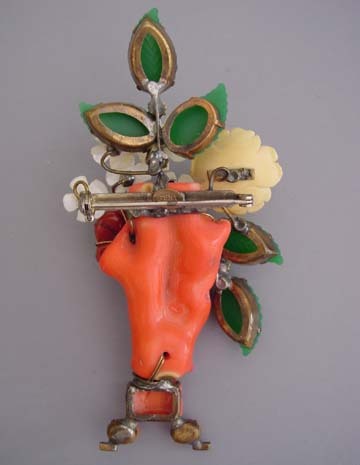 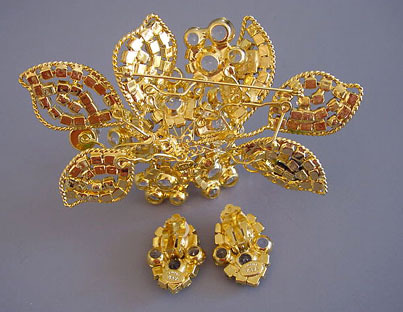 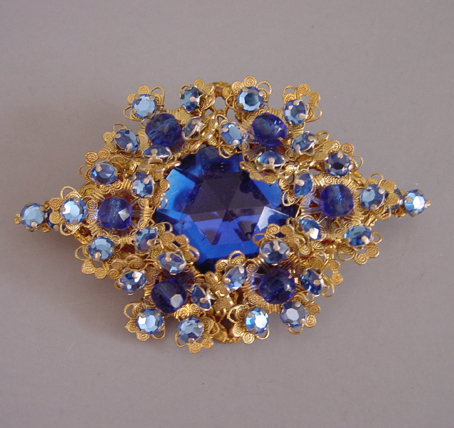 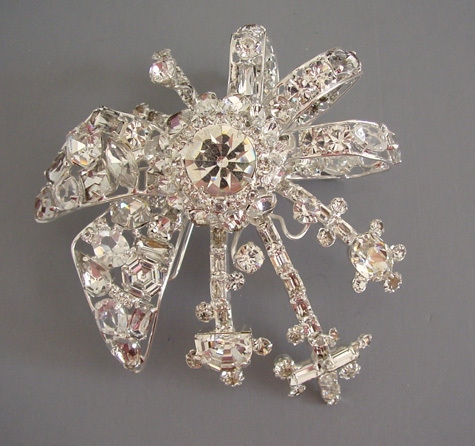 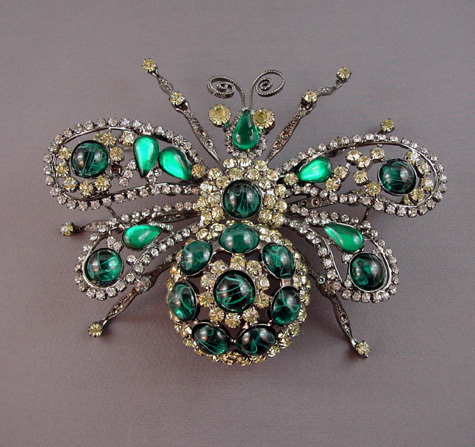 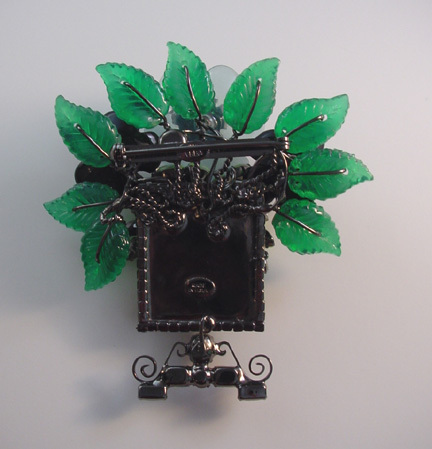 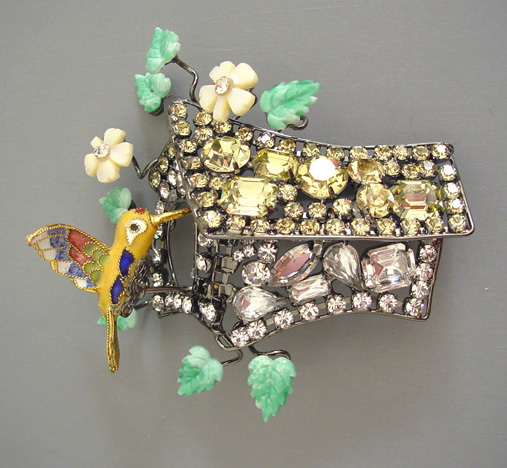 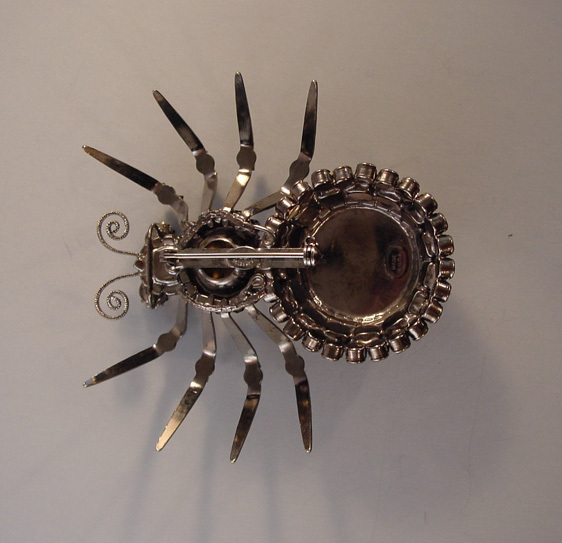 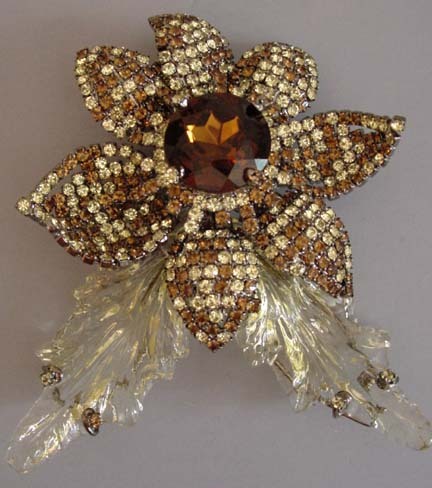 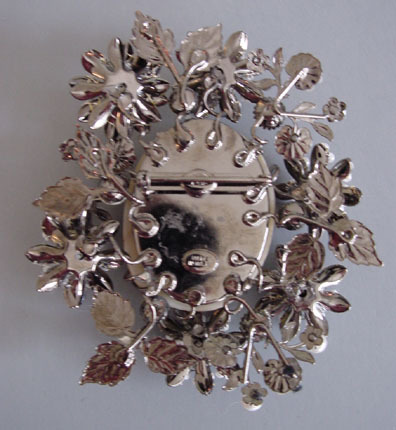 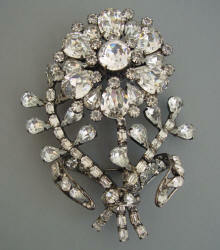 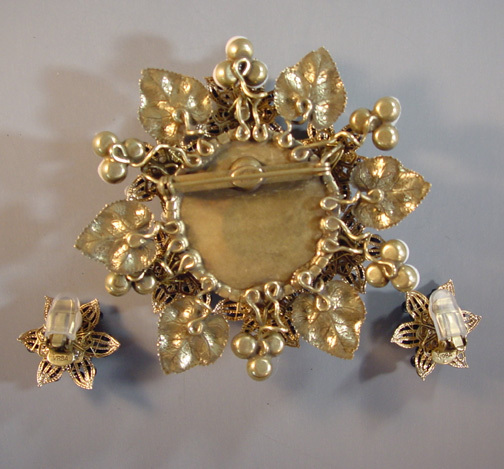 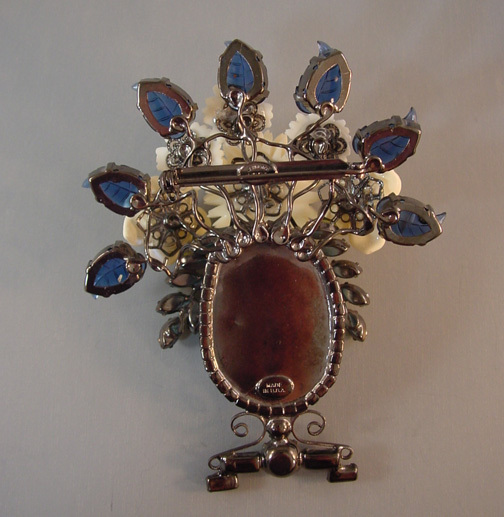 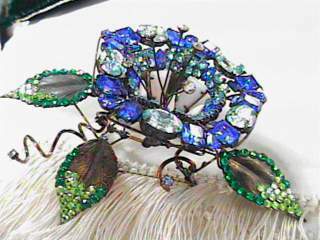 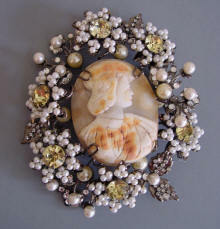 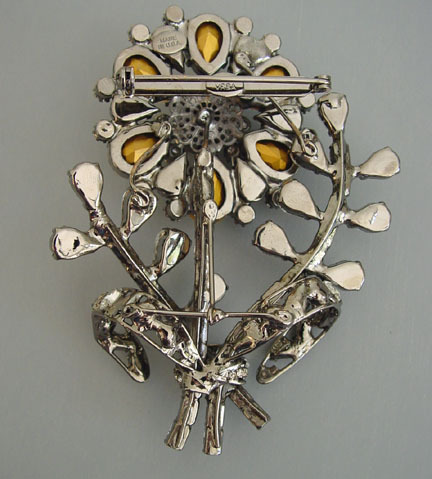 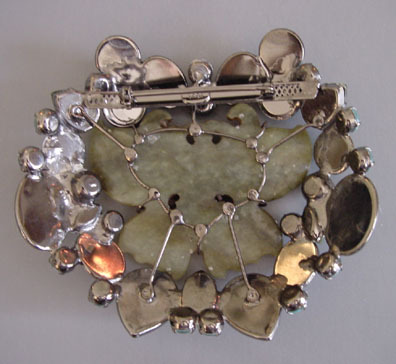 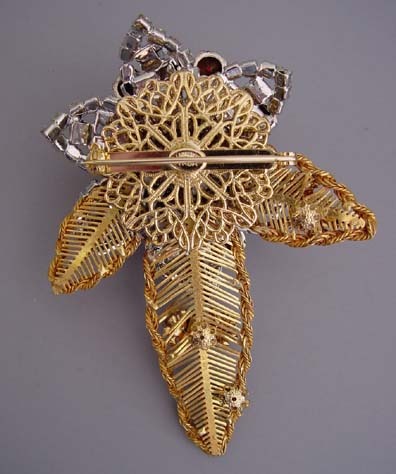 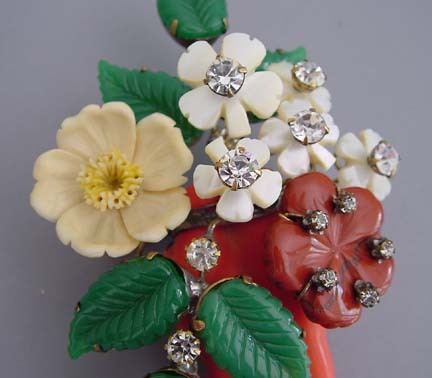 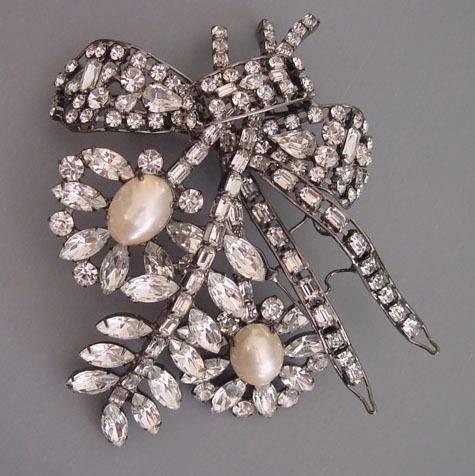 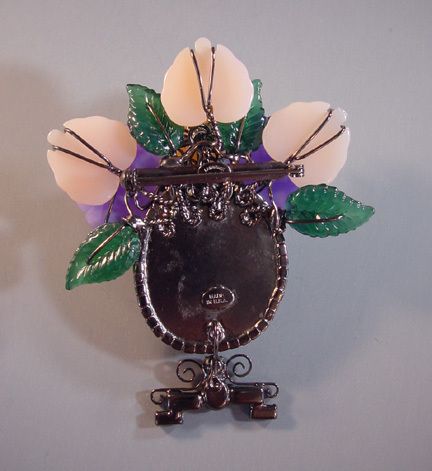 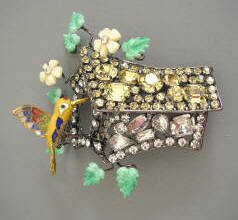 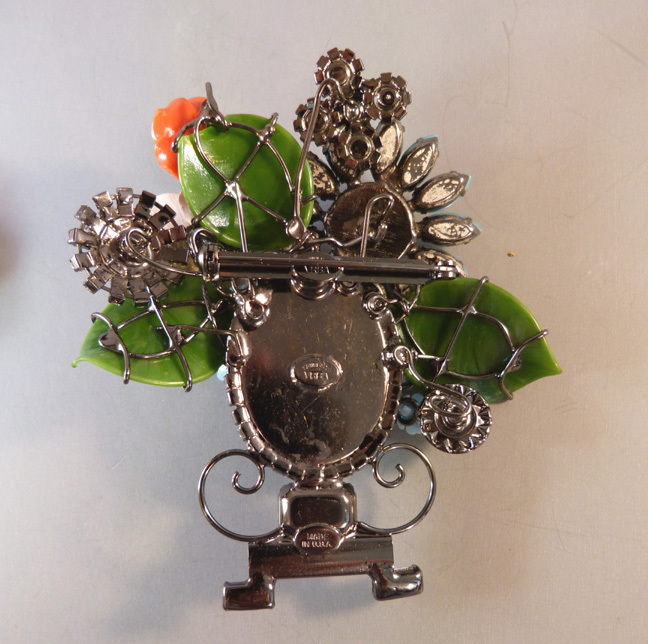 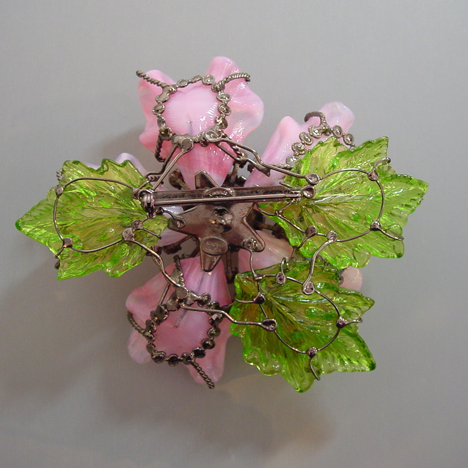 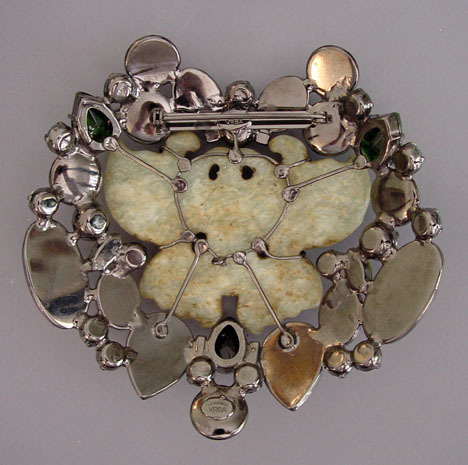 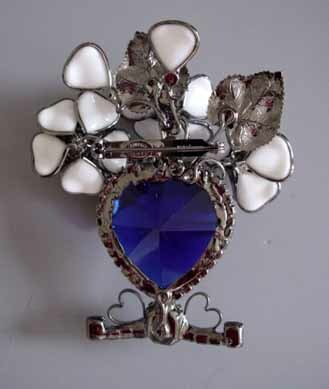 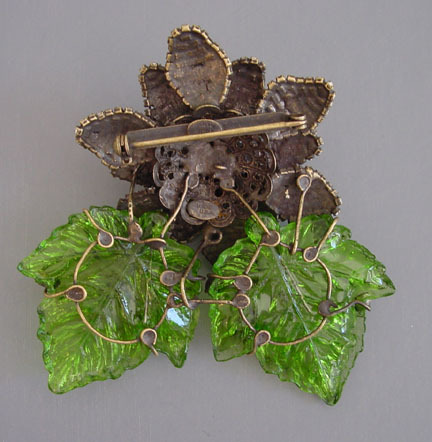 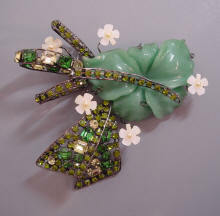 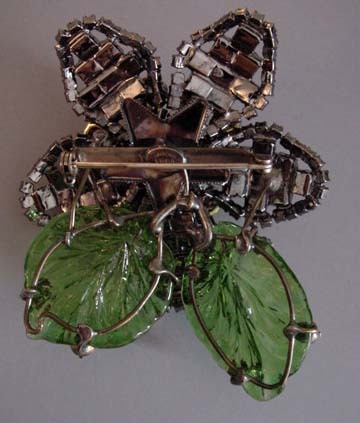 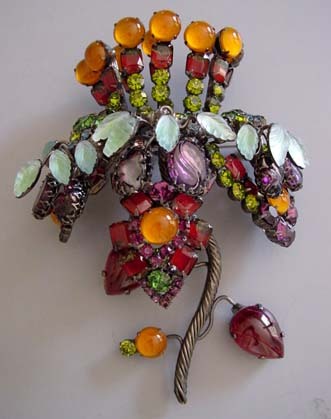 VRBA floral brooch with glass leaves. 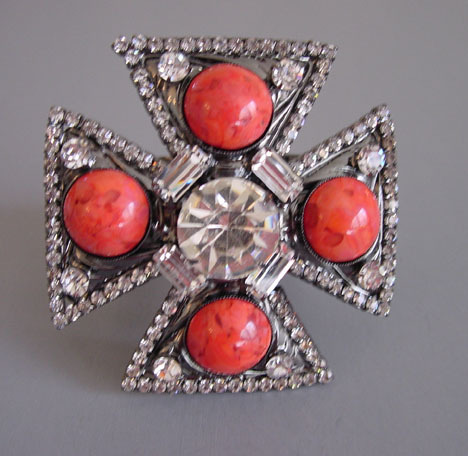 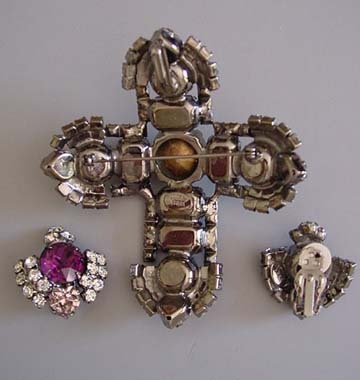 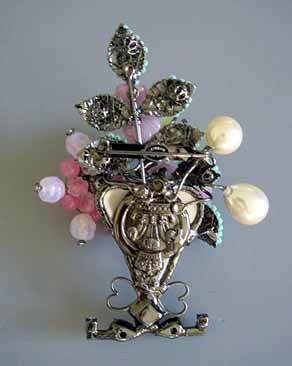 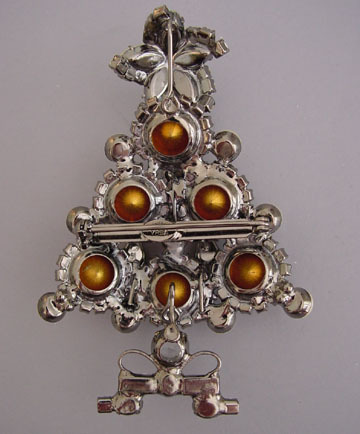 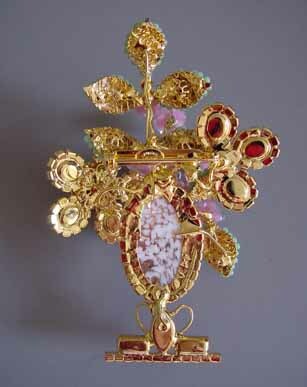 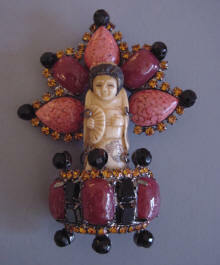 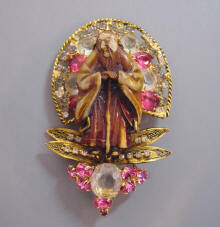 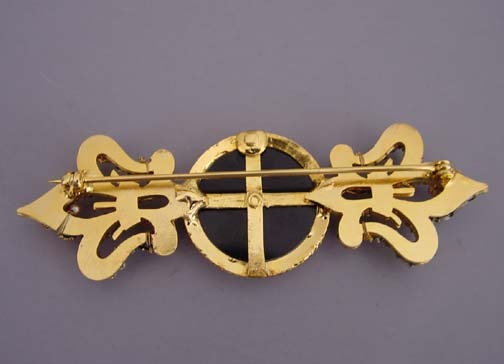 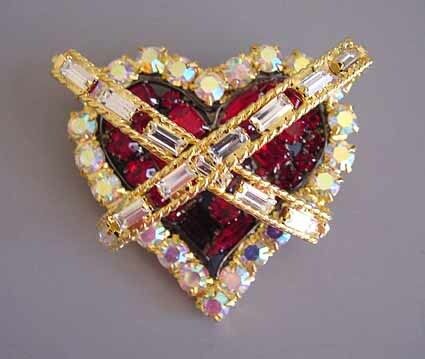 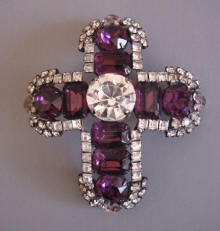 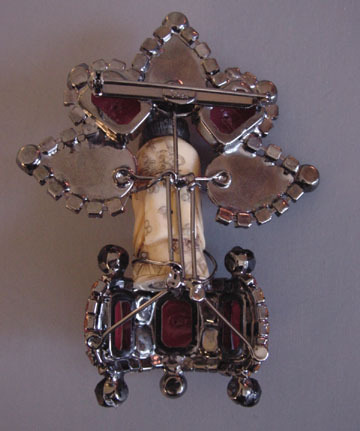 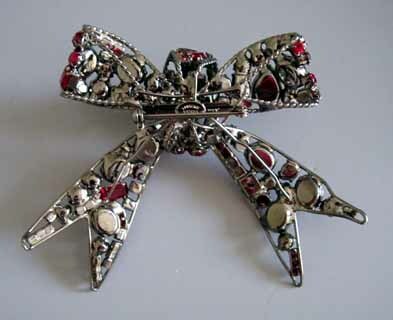 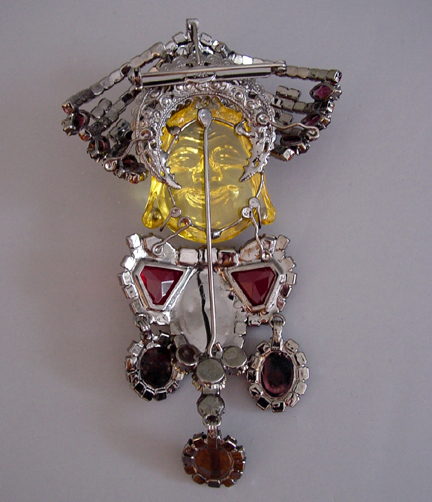 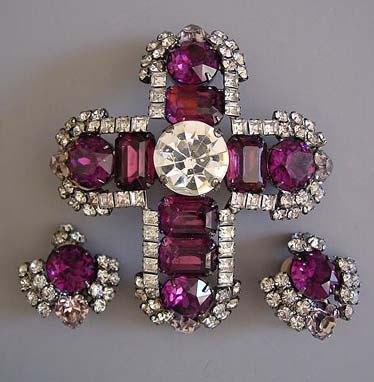 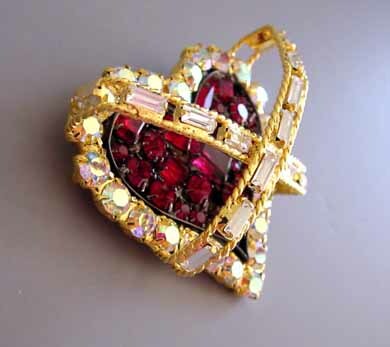 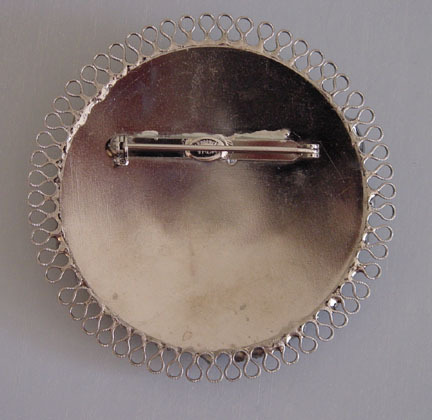 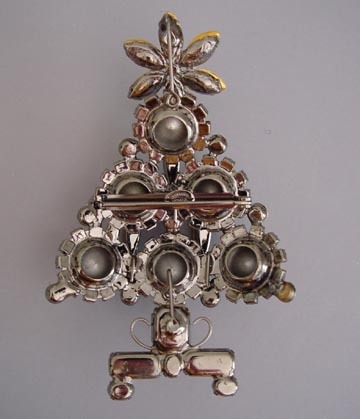 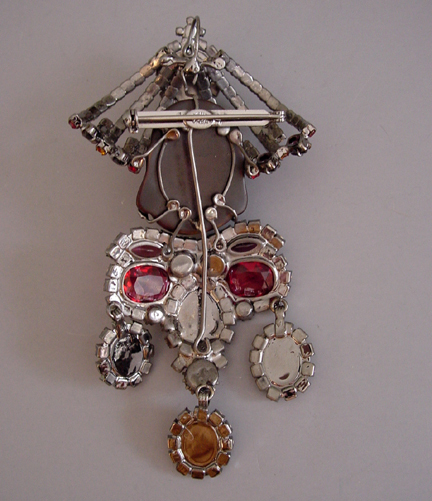 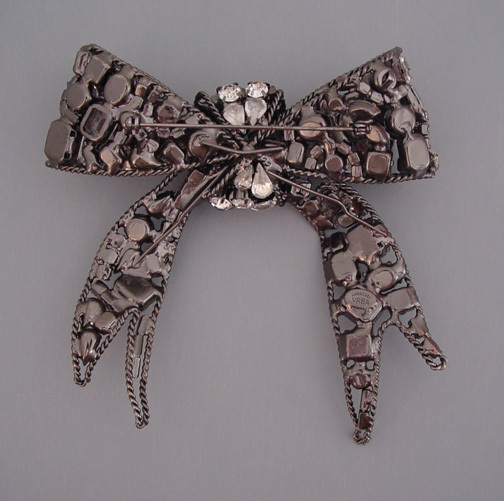 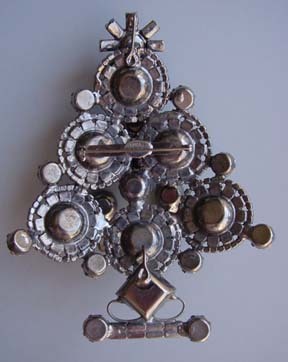 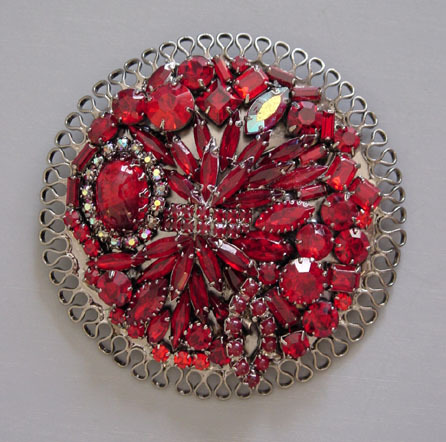 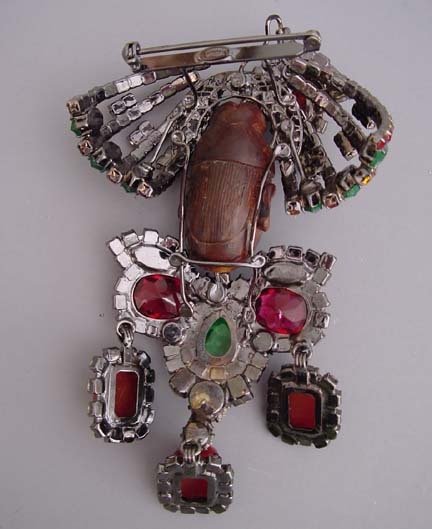 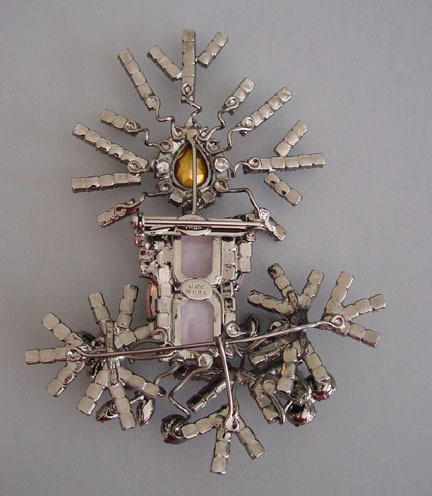 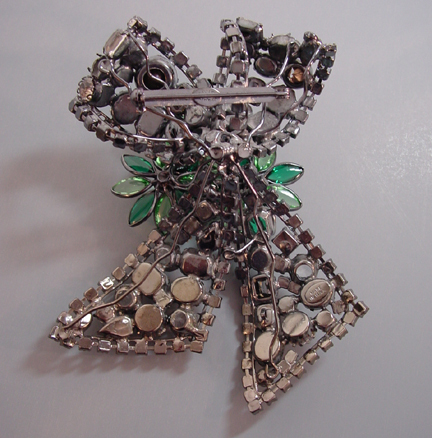 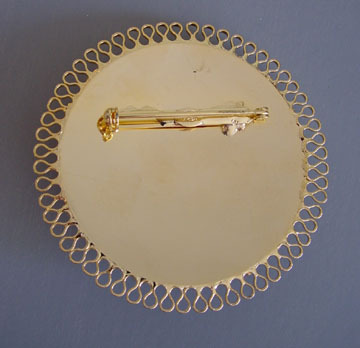 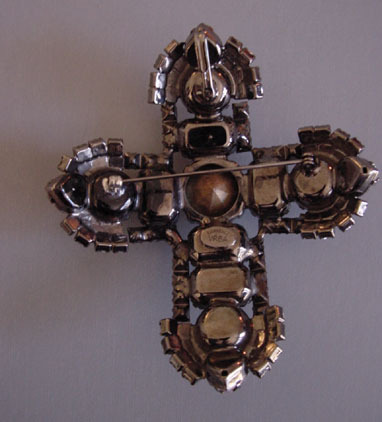 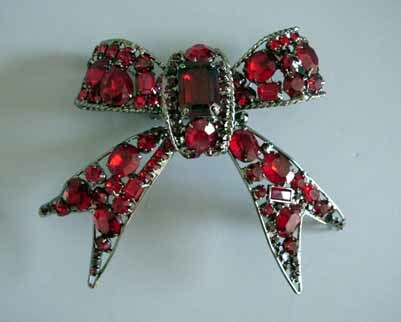 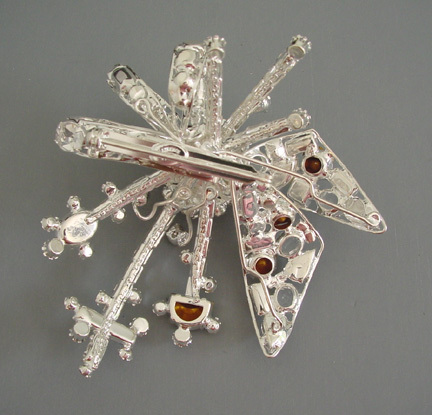 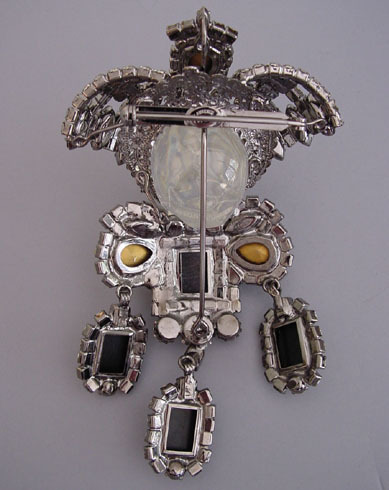 VRBA "cross my heart" brooch.